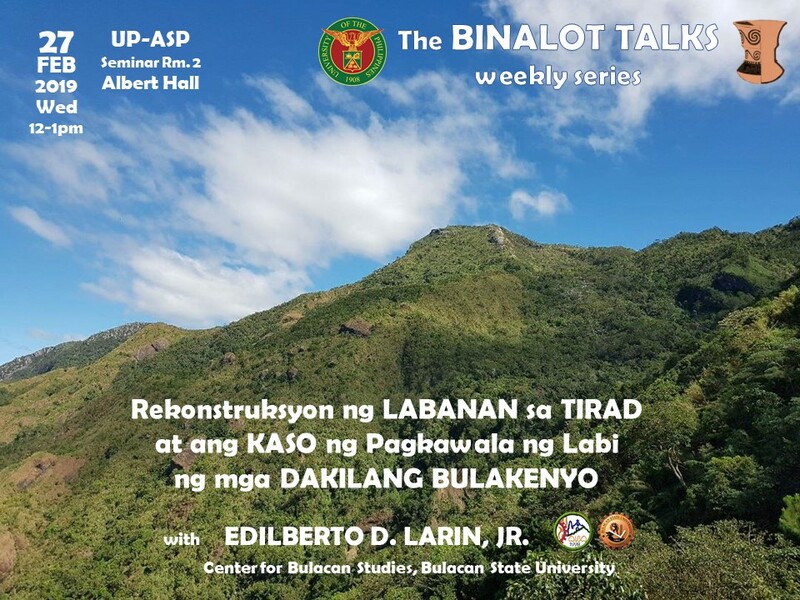 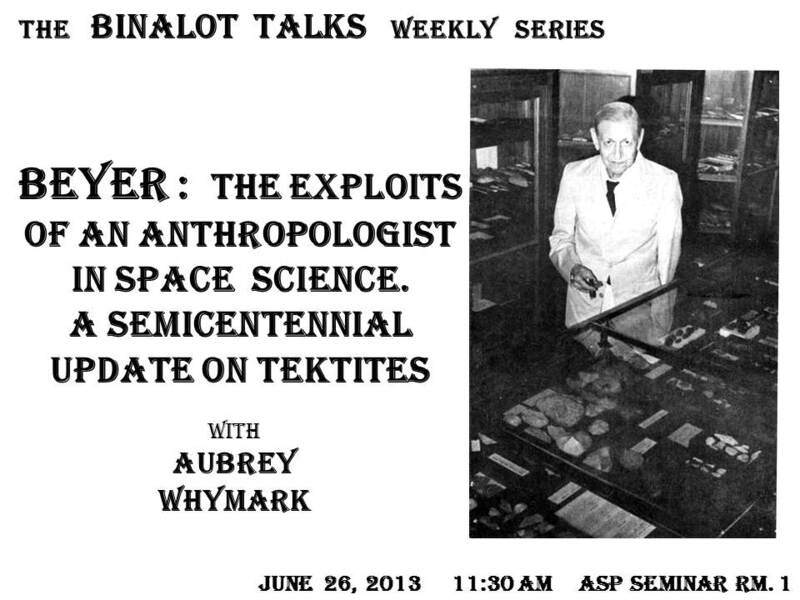 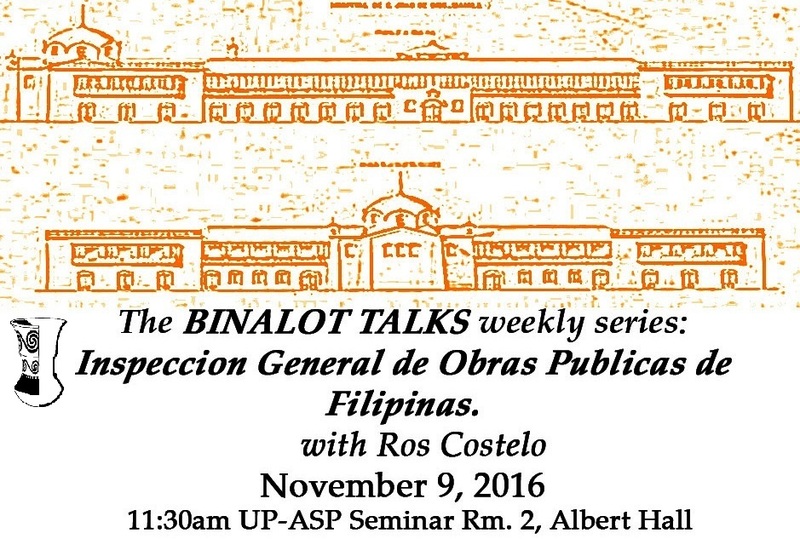 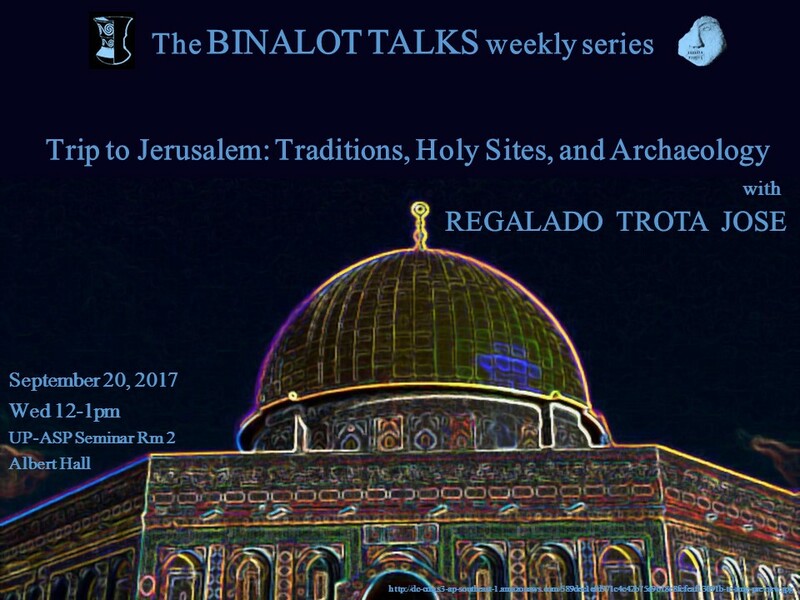 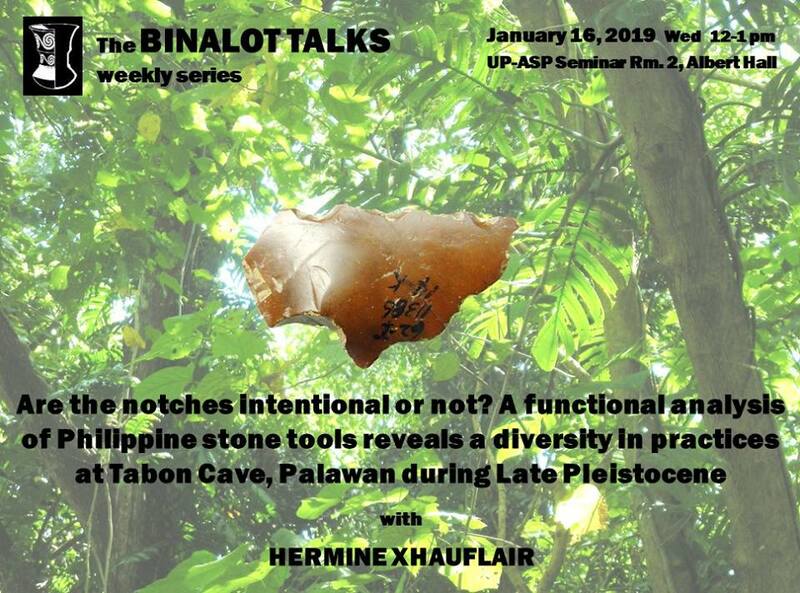 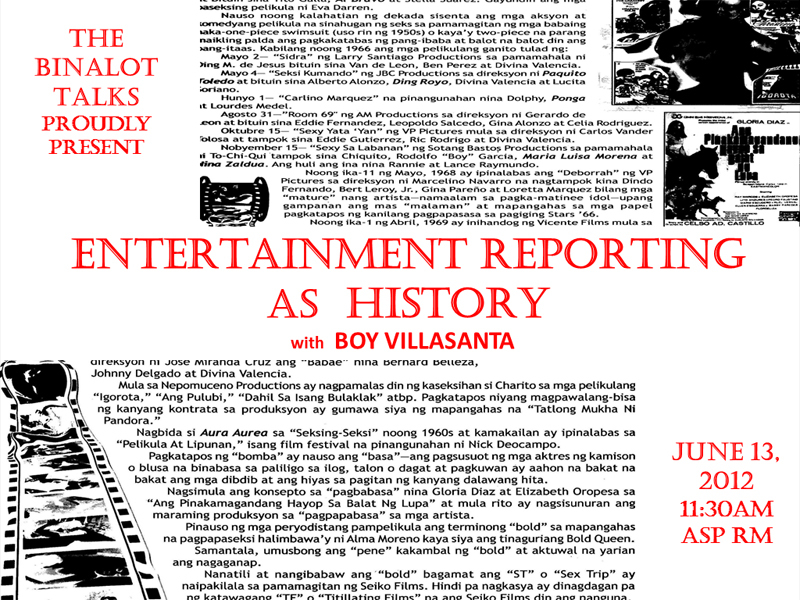 Commentaries on the Binalot Talks are featured in the Test Pit Bulletin under the Binalot Talk Series. 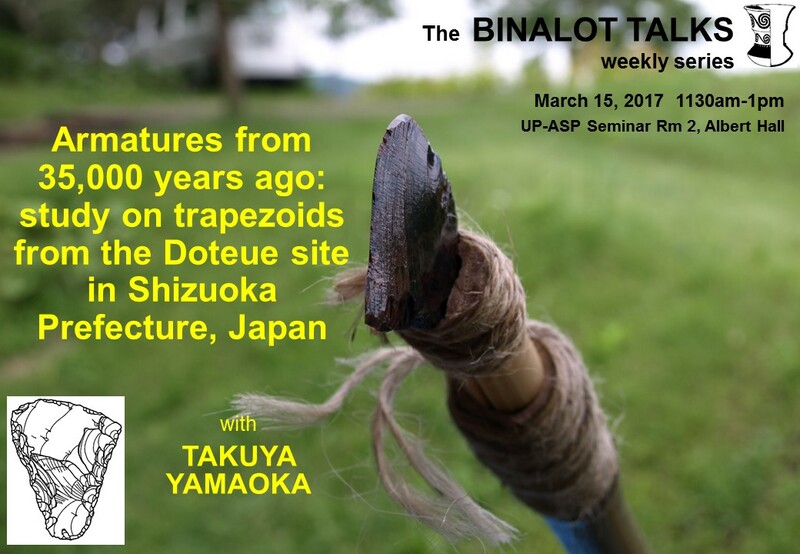 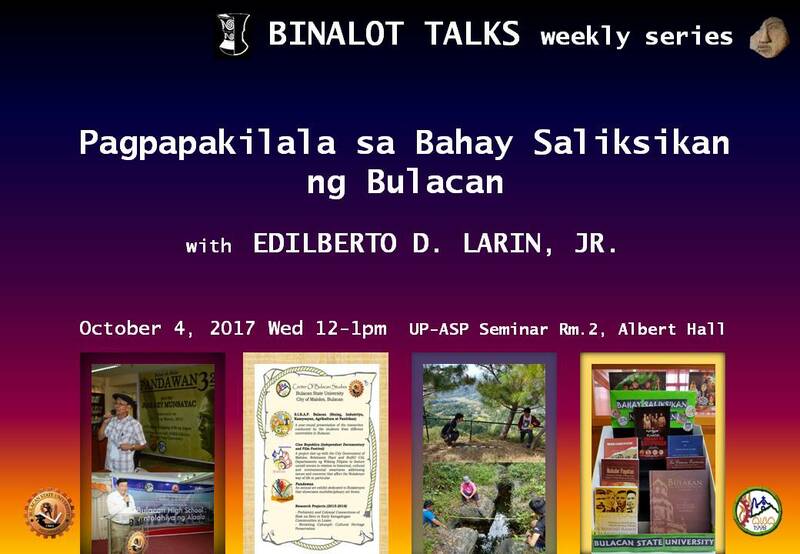 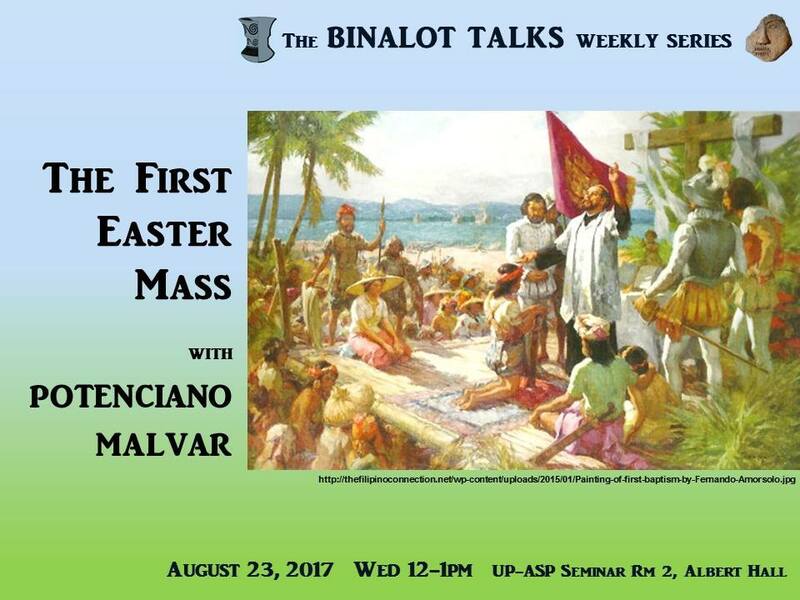 If you want to be included in the mailing list of people who are given weekly reminders on the Binalot Talks, please email Jane Carlos. 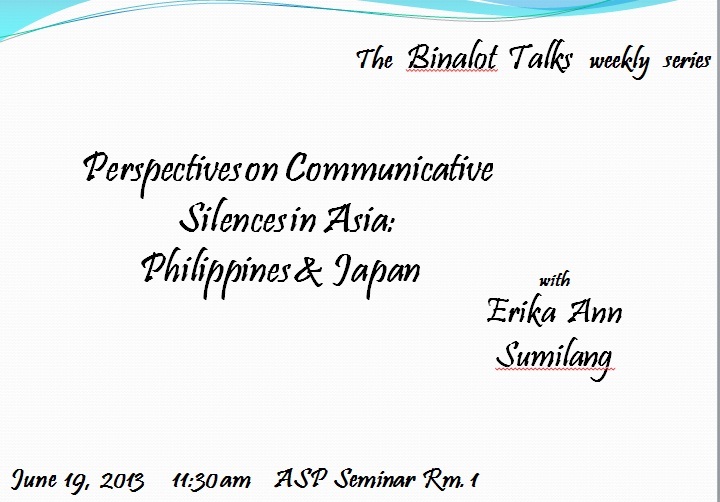 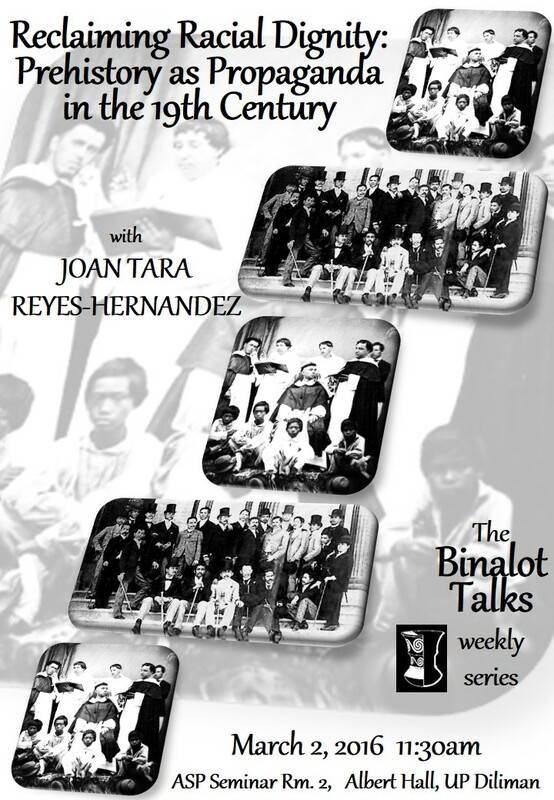 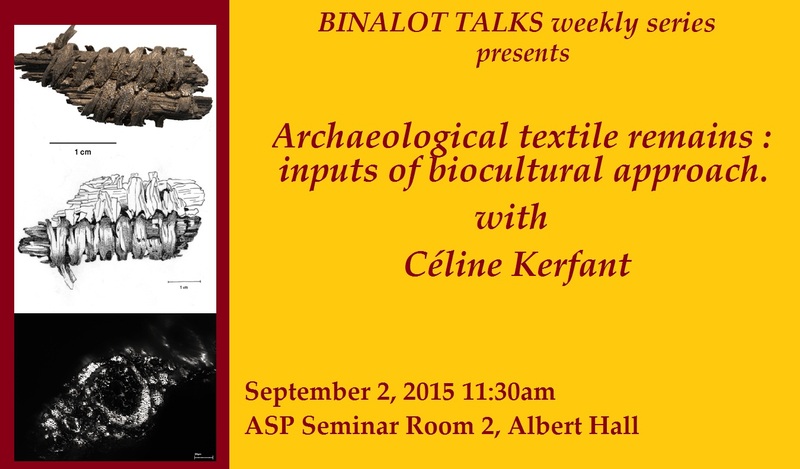 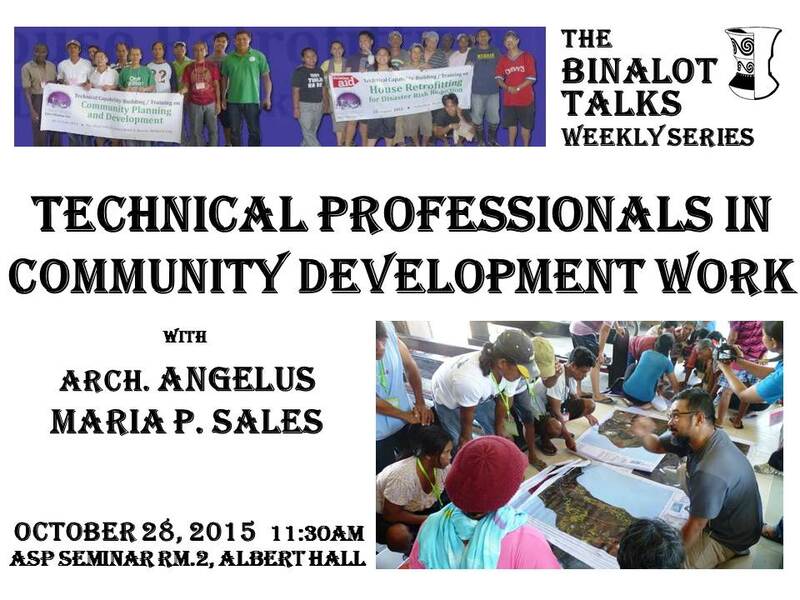 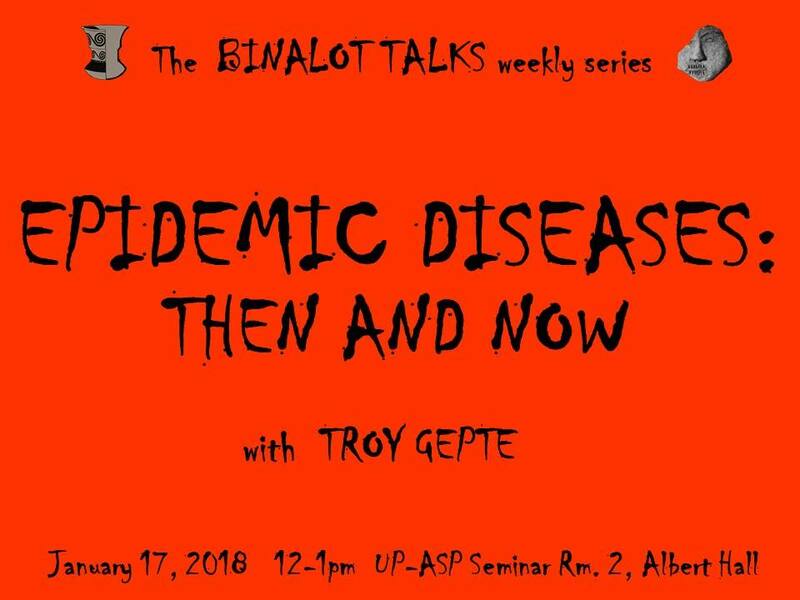 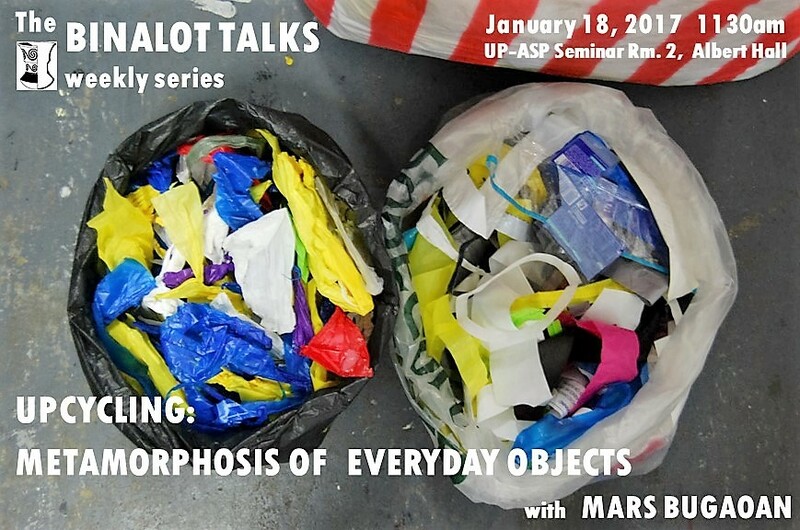 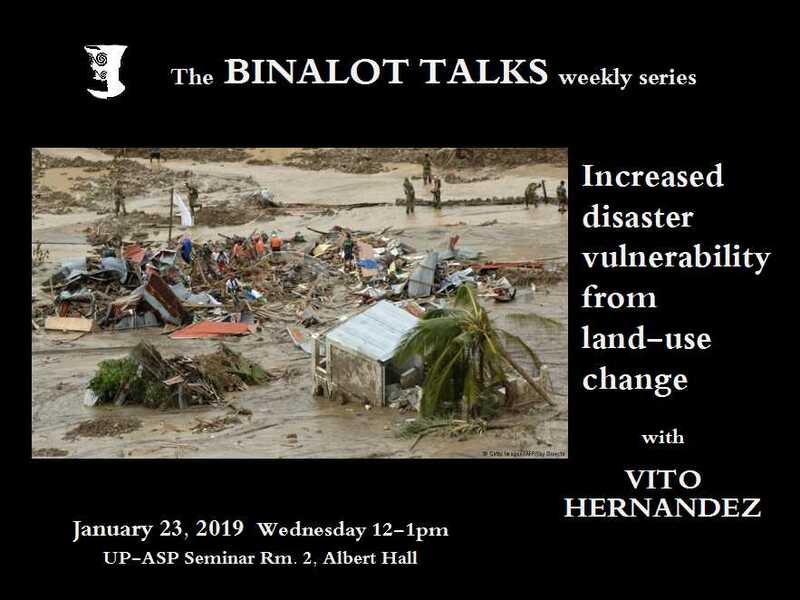 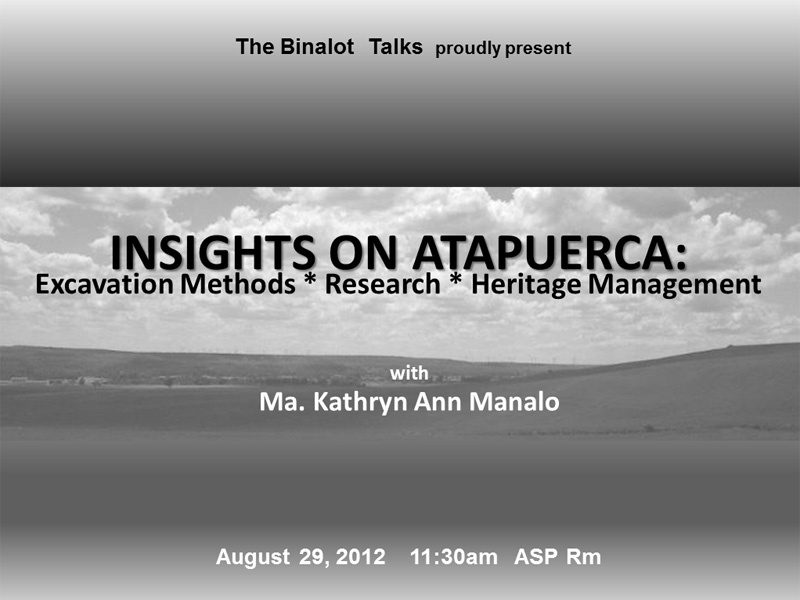 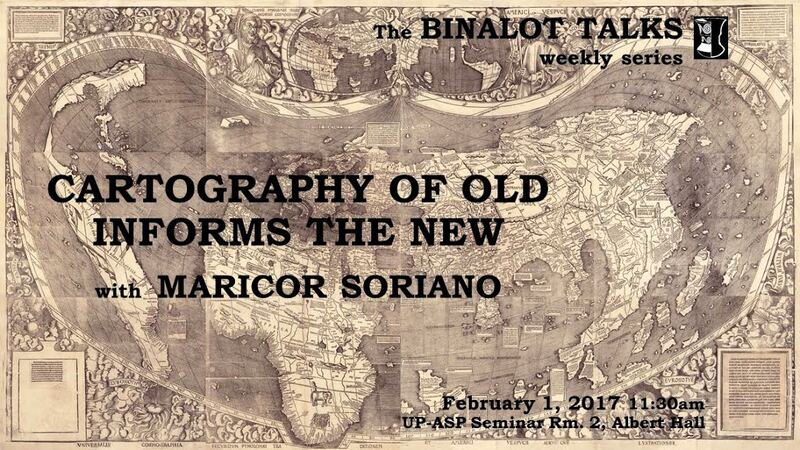 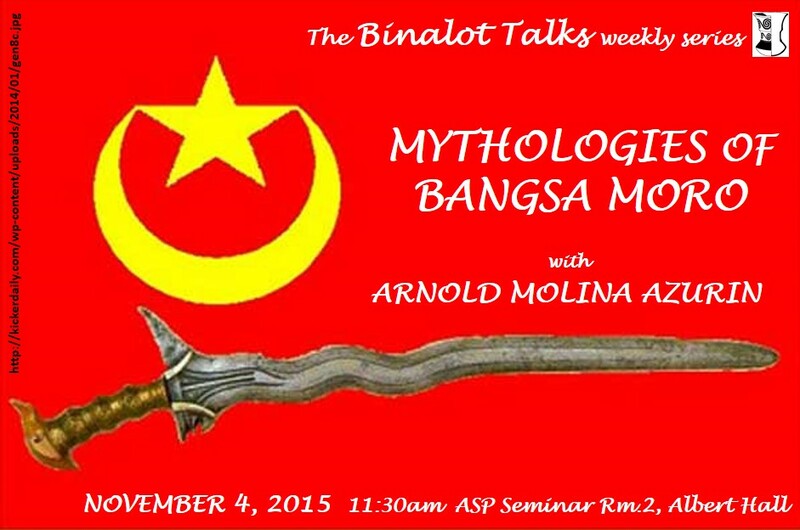 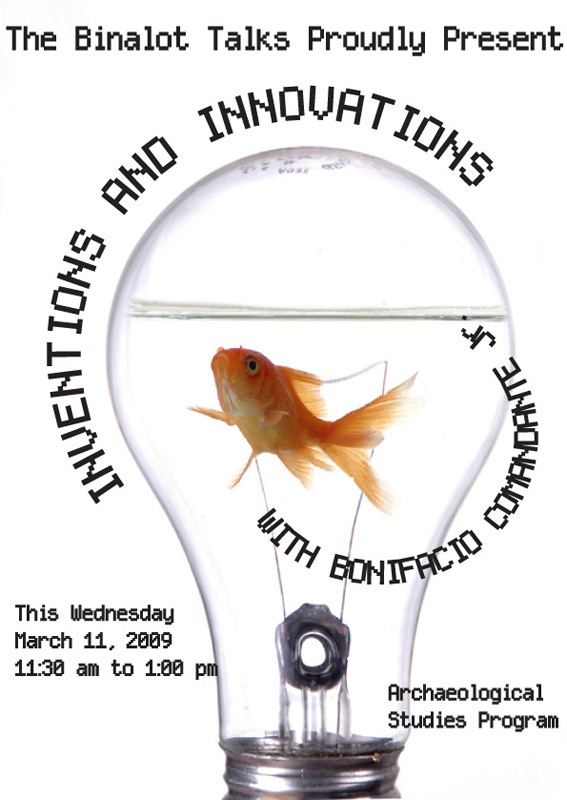 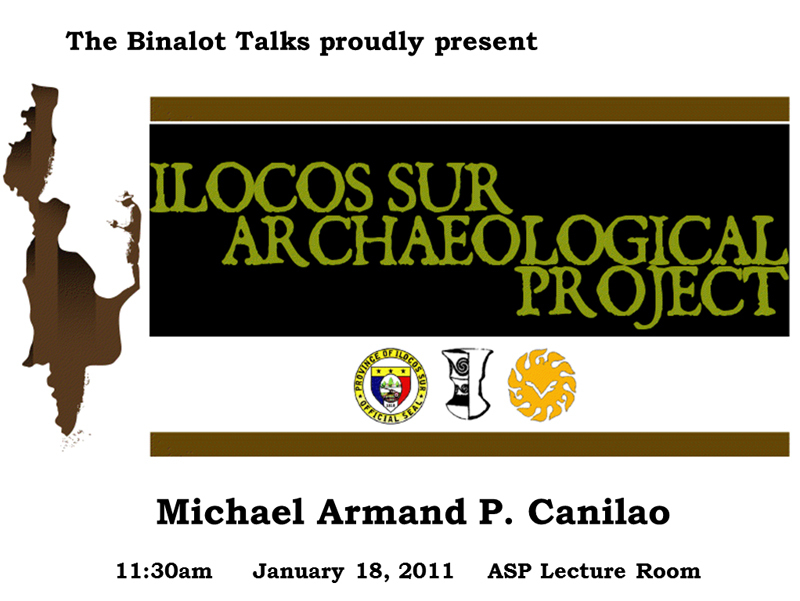 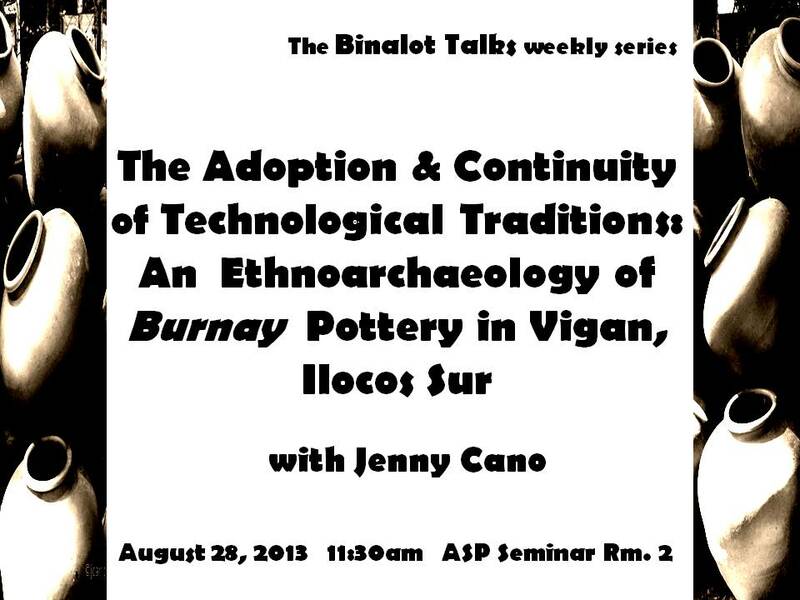 If you are interested in becoming a Binalot Talk speaker, please email Grace Barretto-Tesoro. 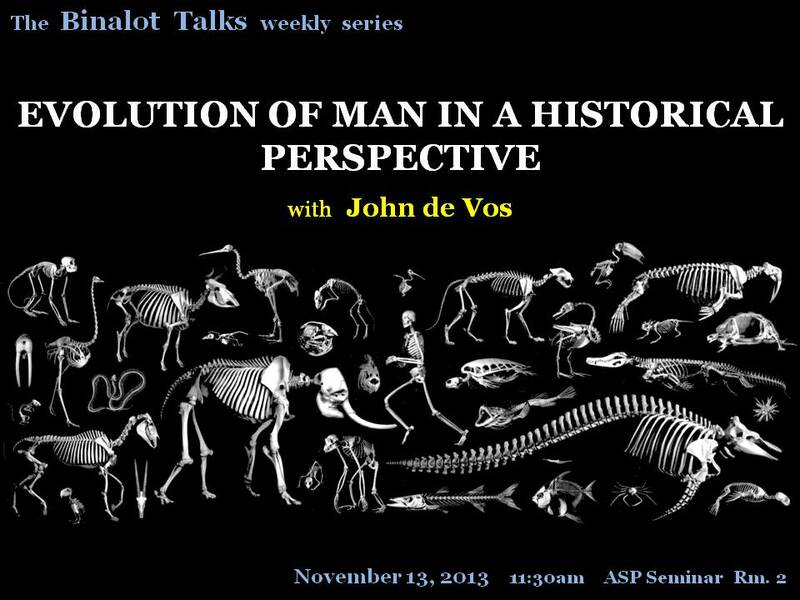 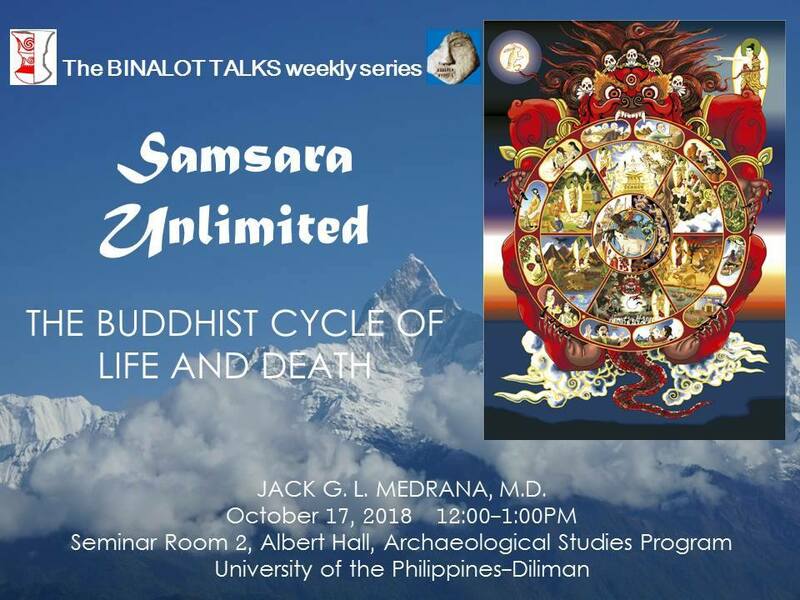 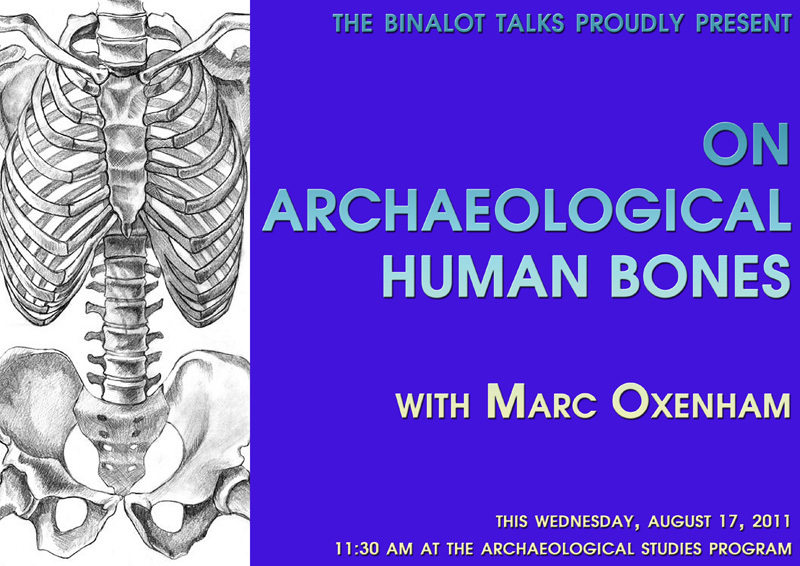 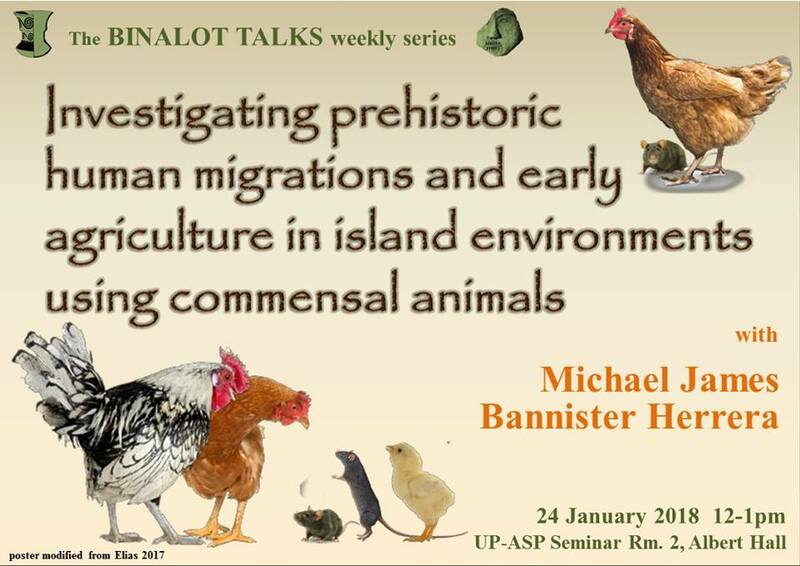 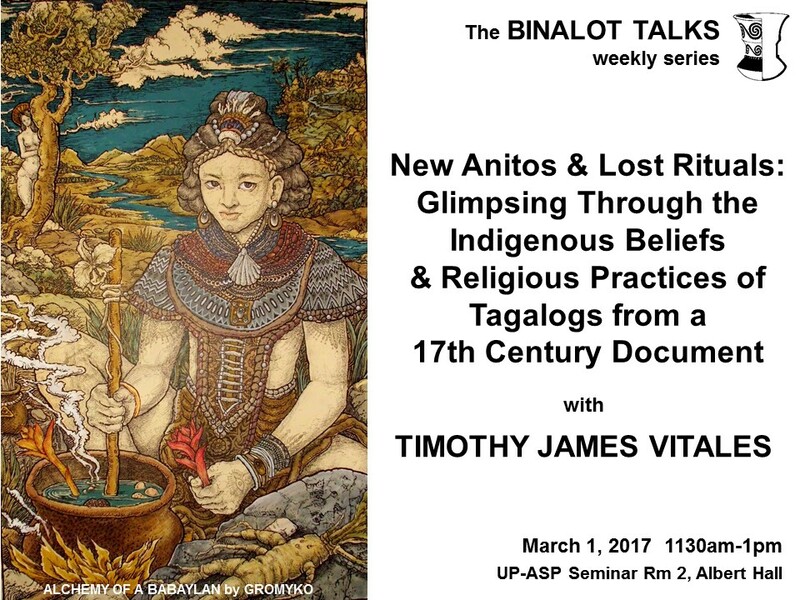 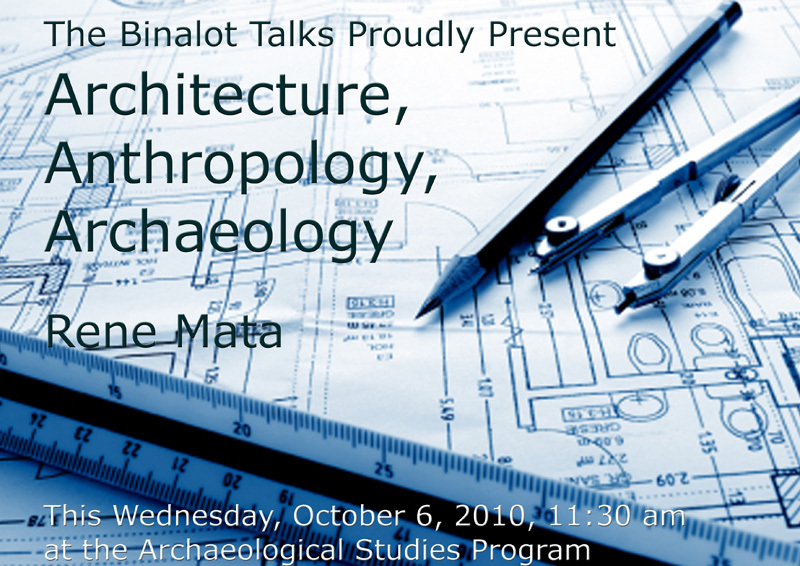 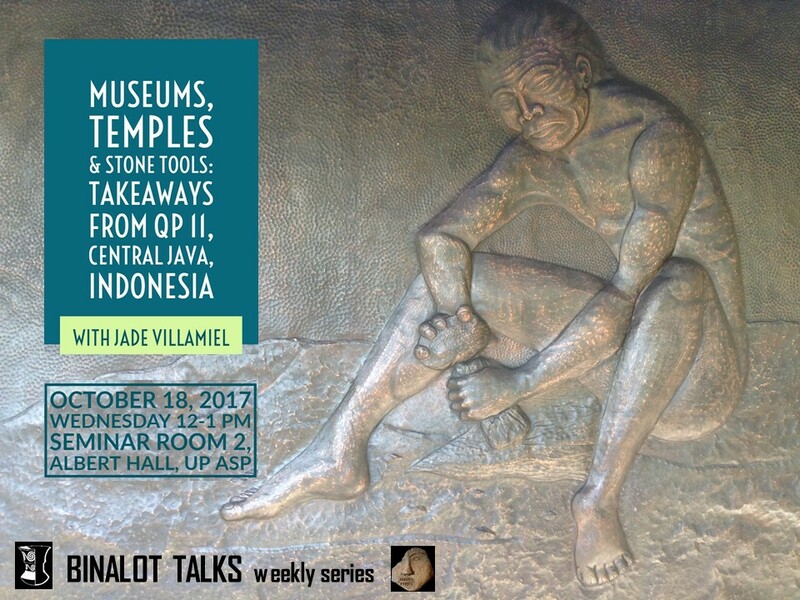 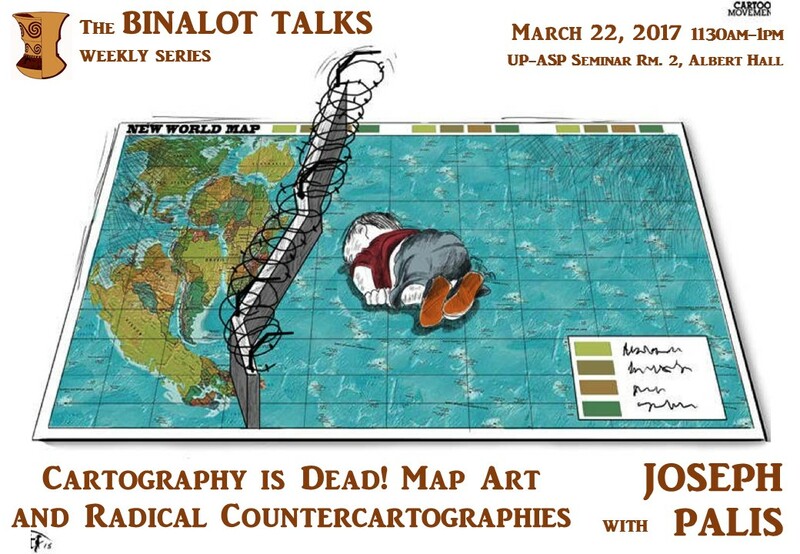 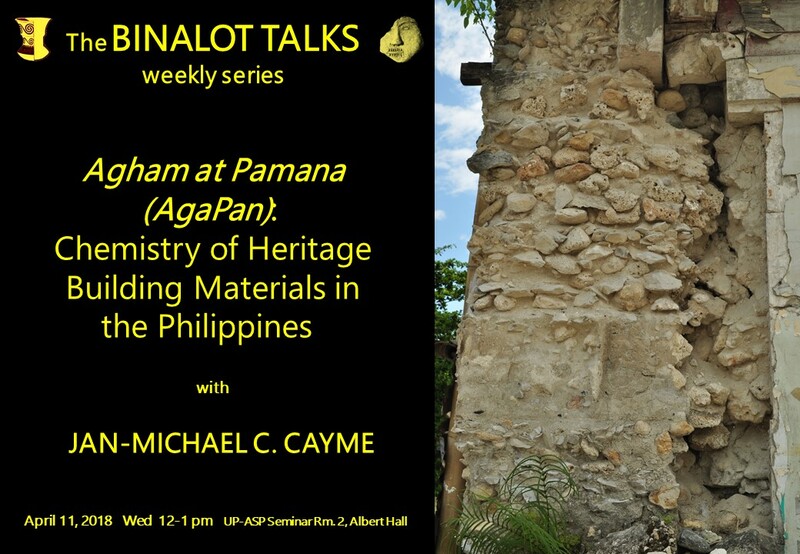 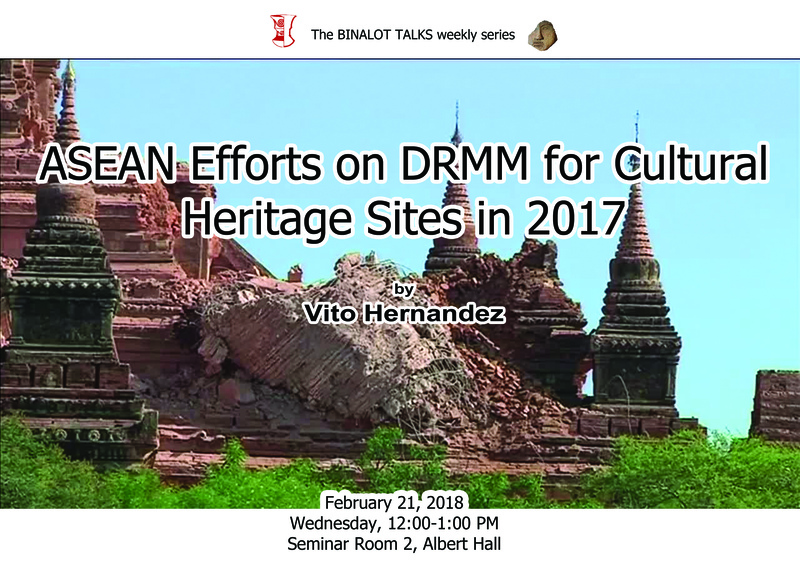 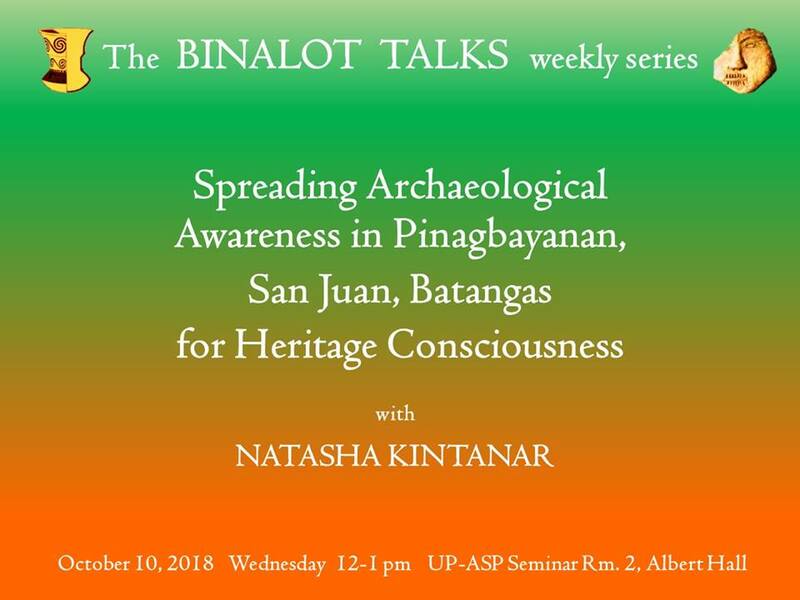 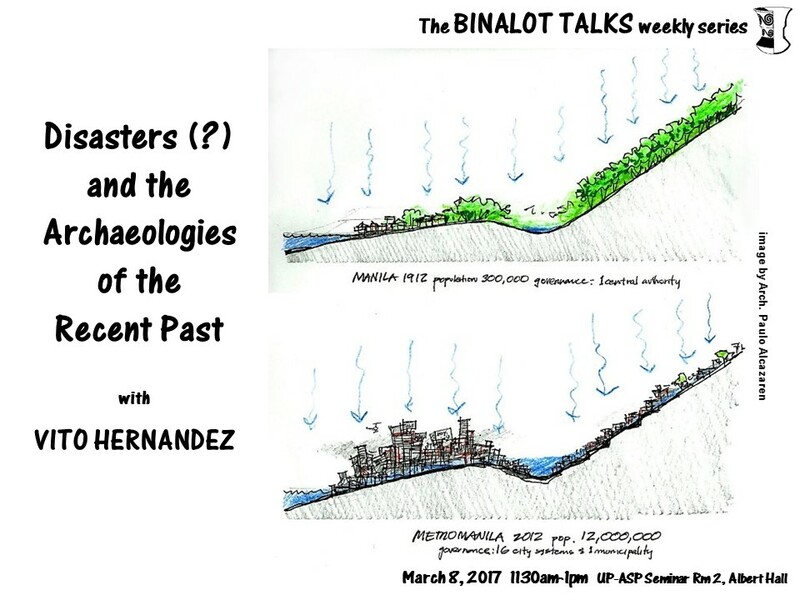 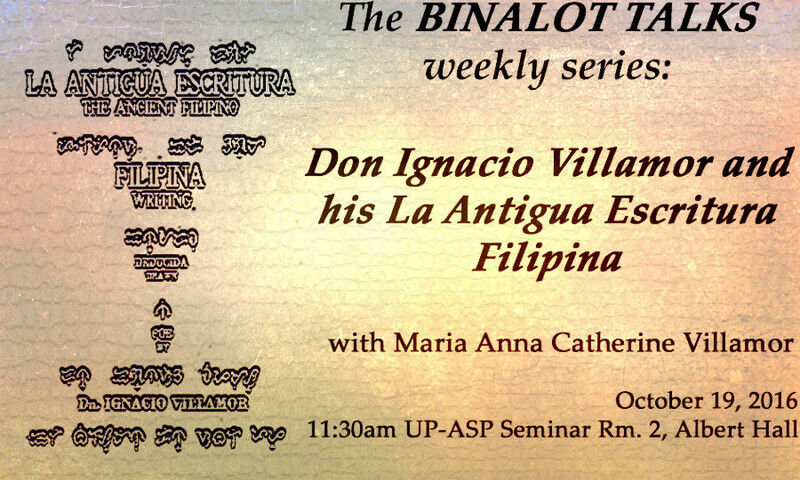 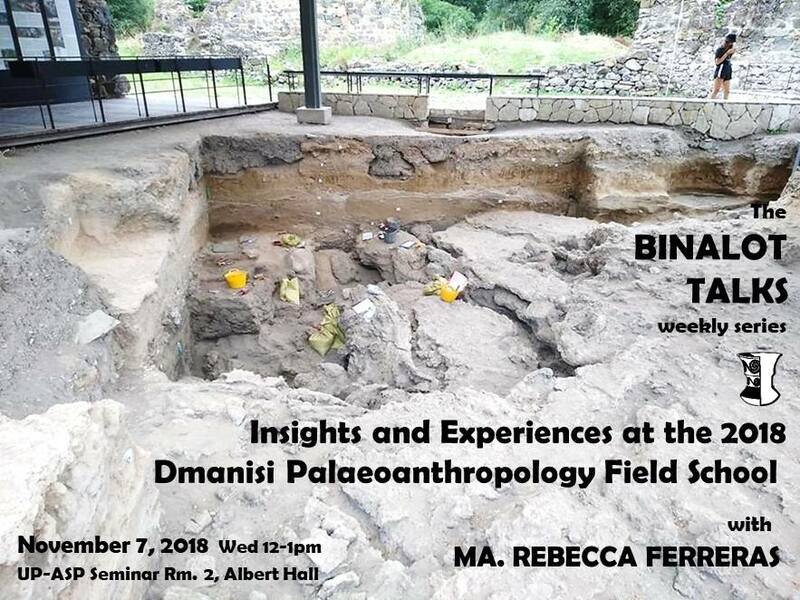 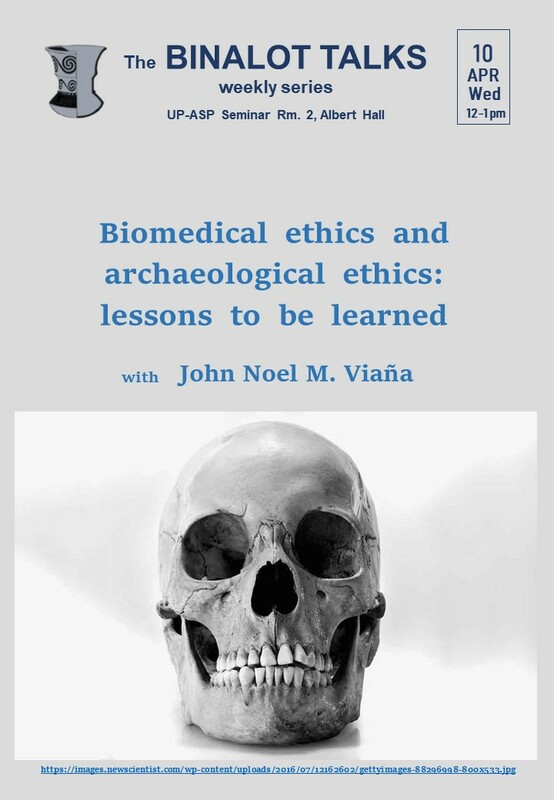 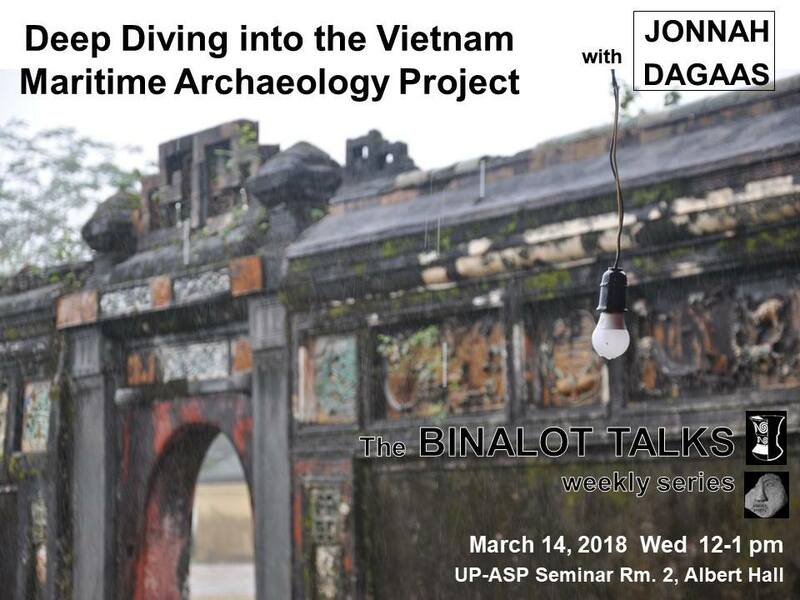 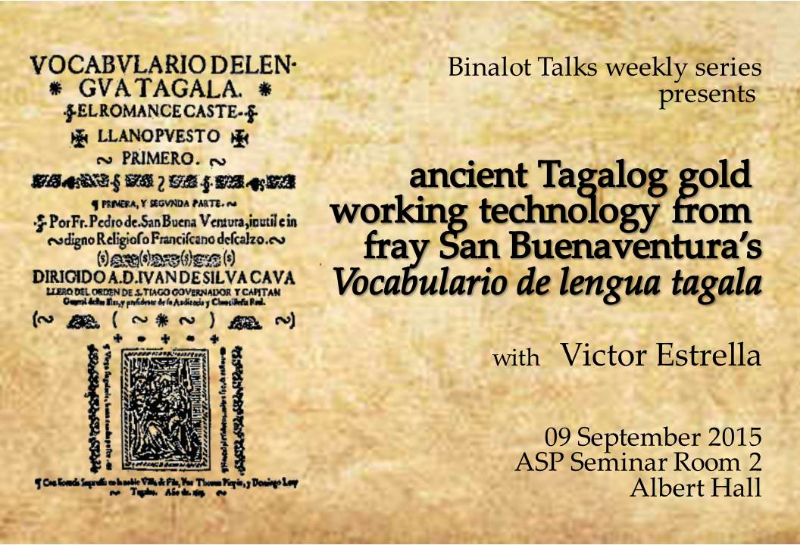 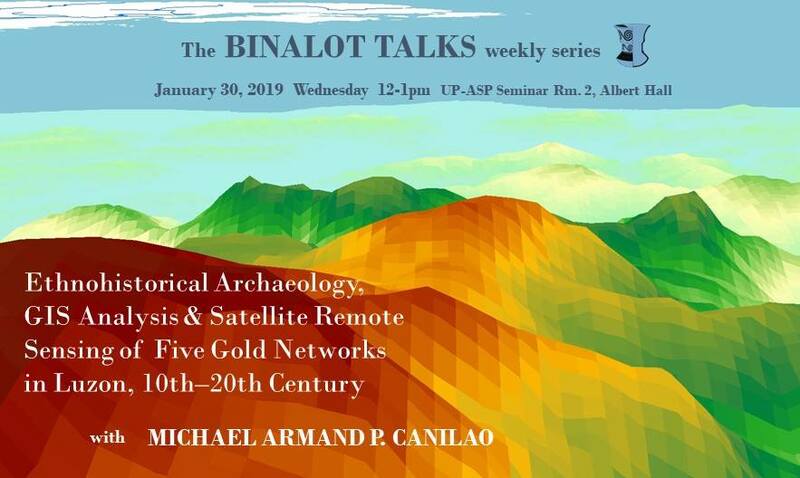 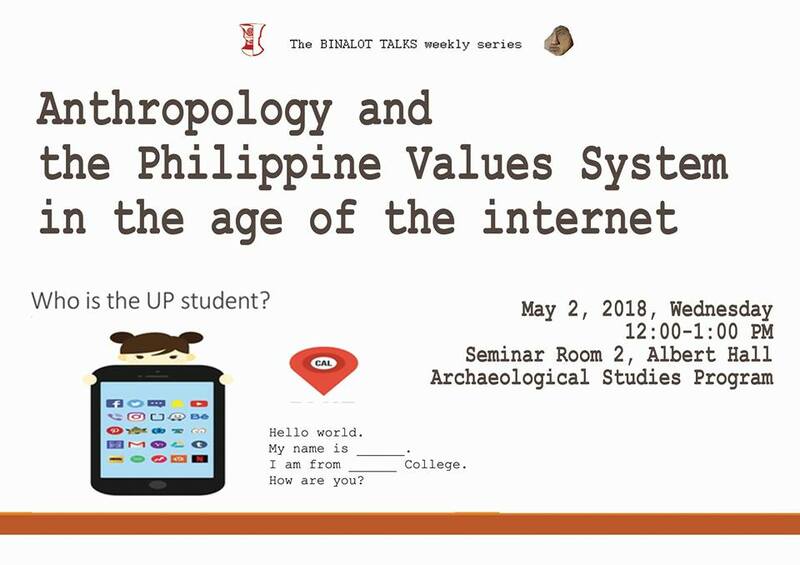 The Binalot Talk for this week will be given by John Noel M. Viana on "Biomedical ethics and archaeological ethics: Lessons to be learned". 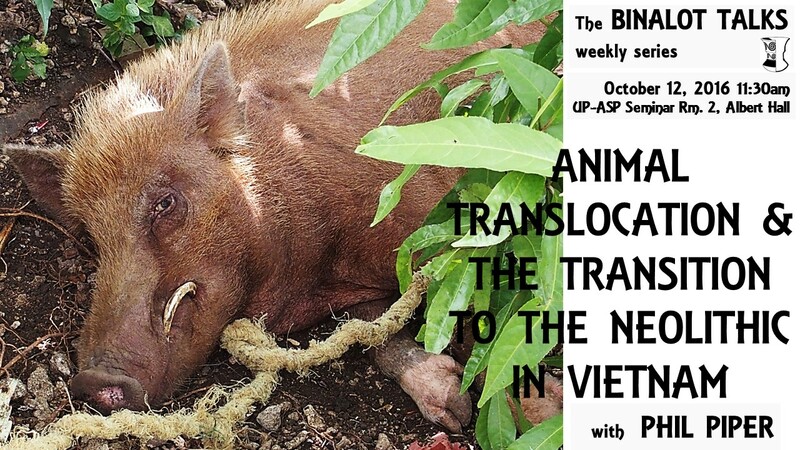 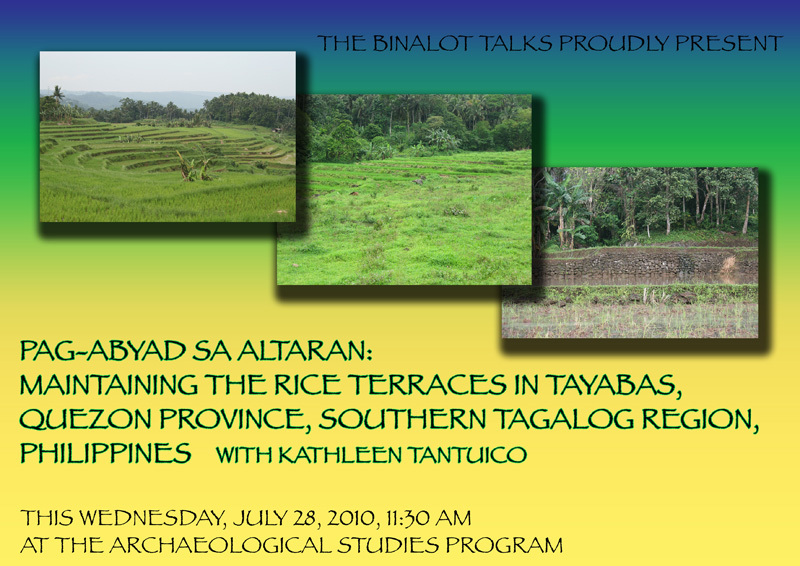 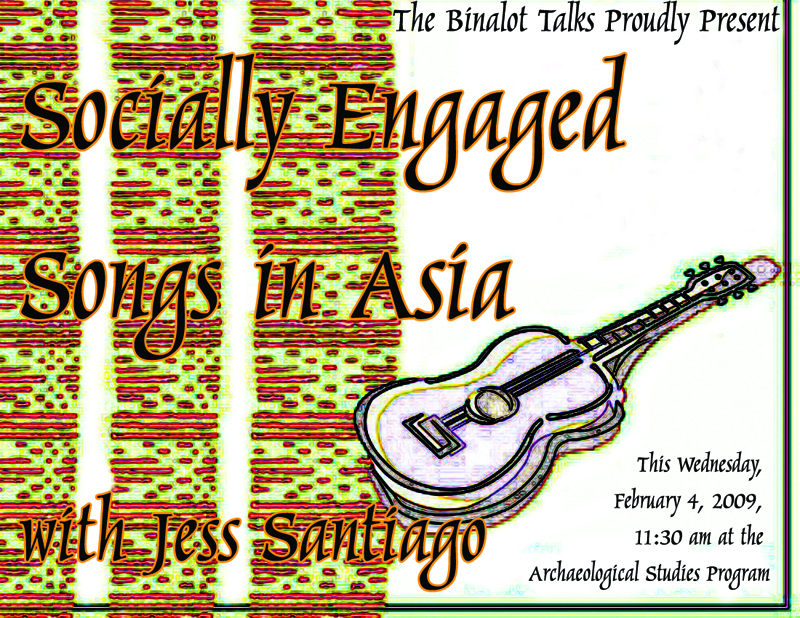 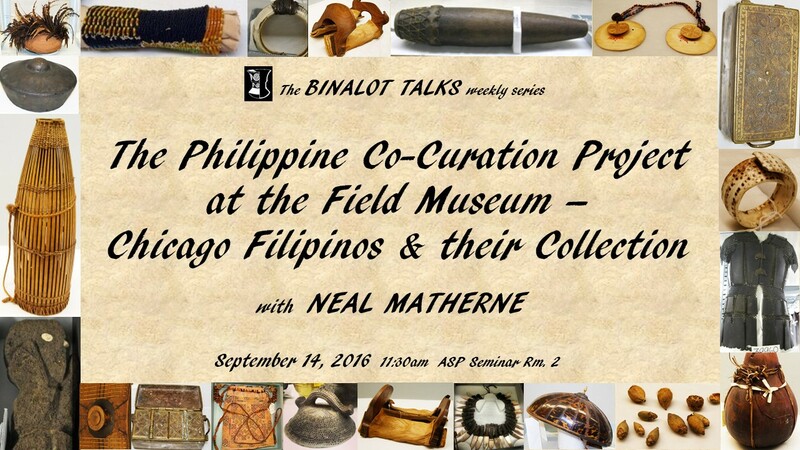 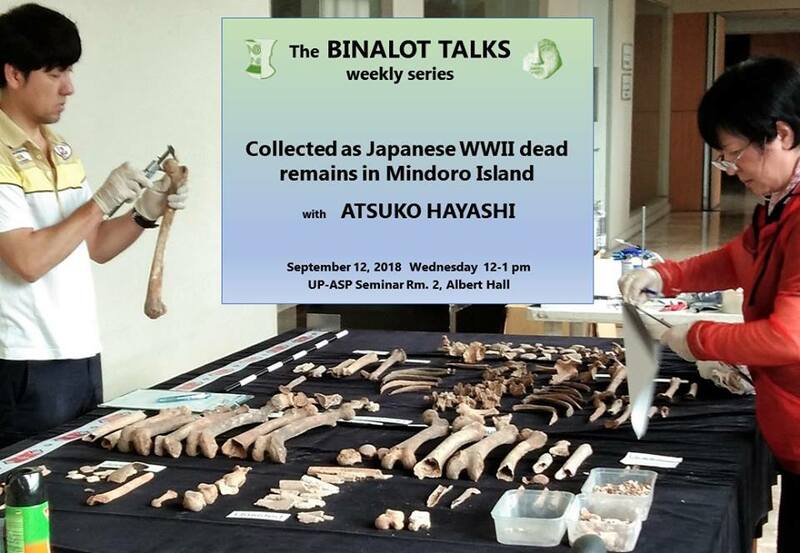 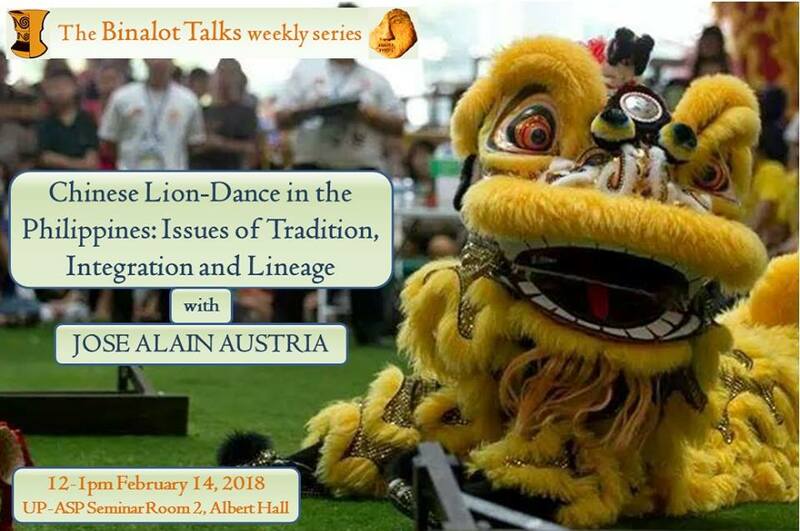 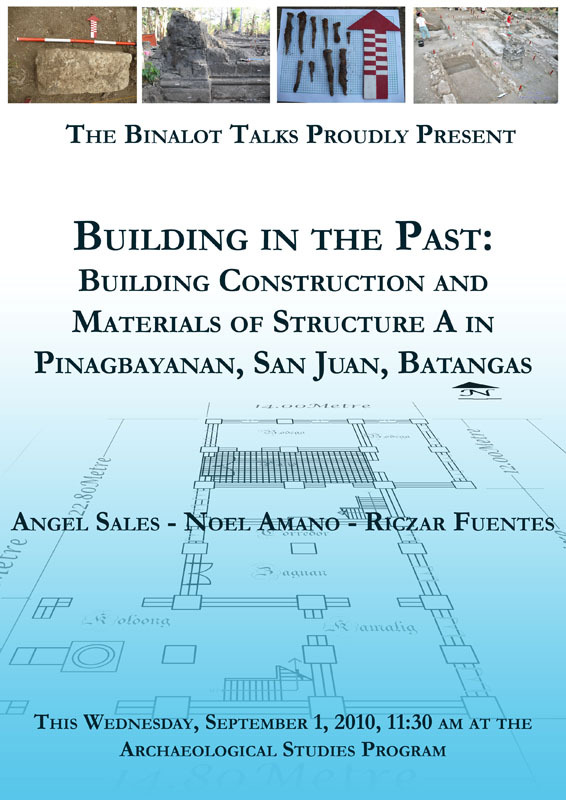 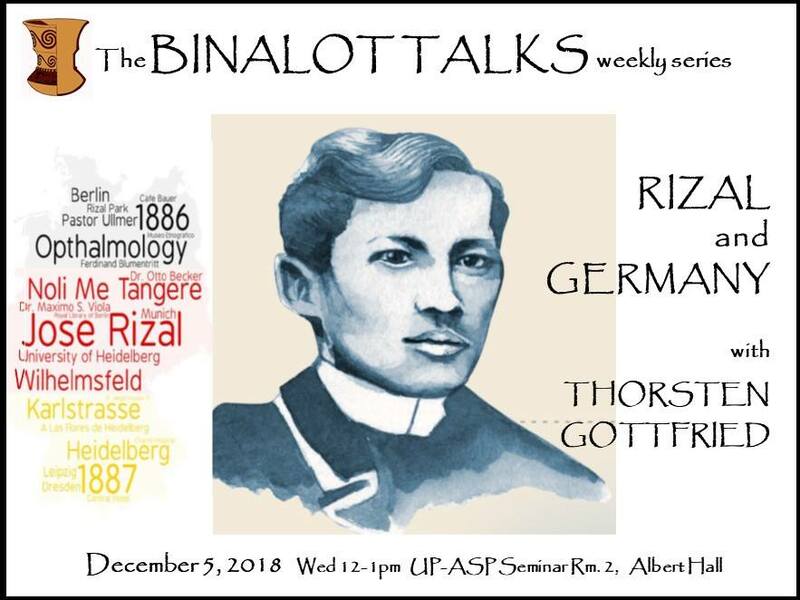 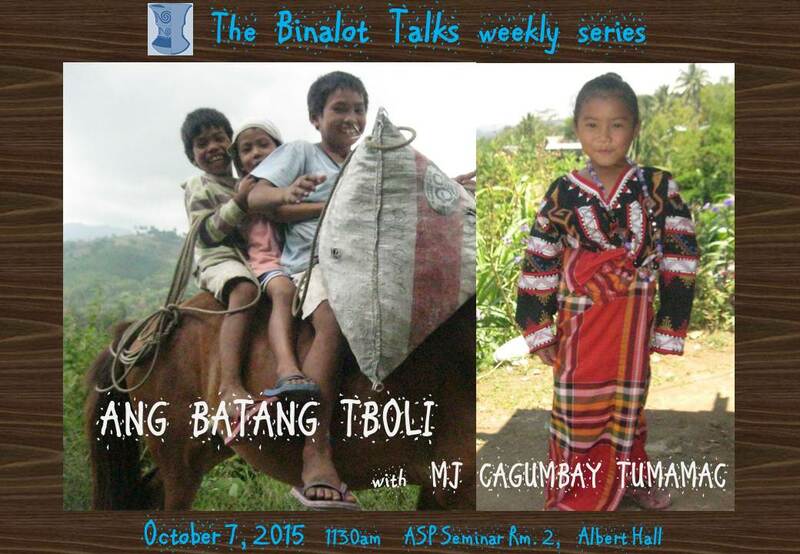 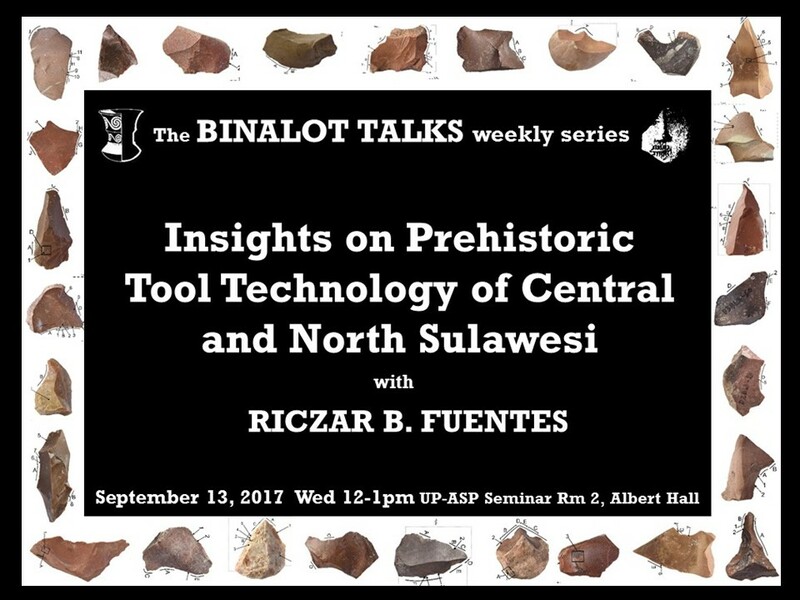 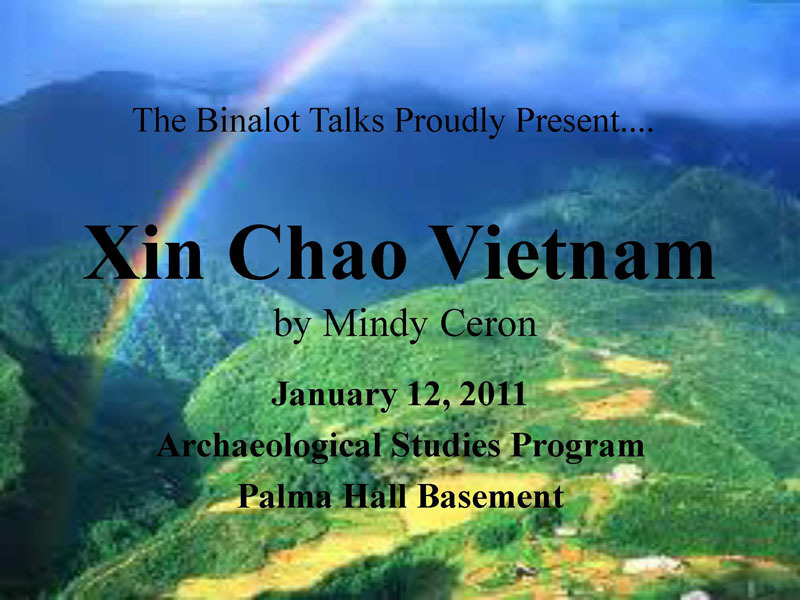 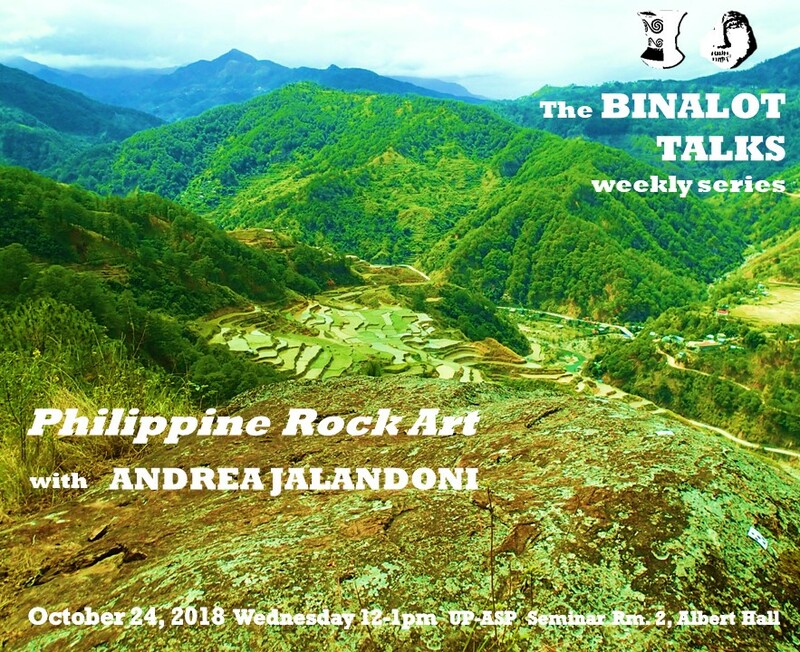 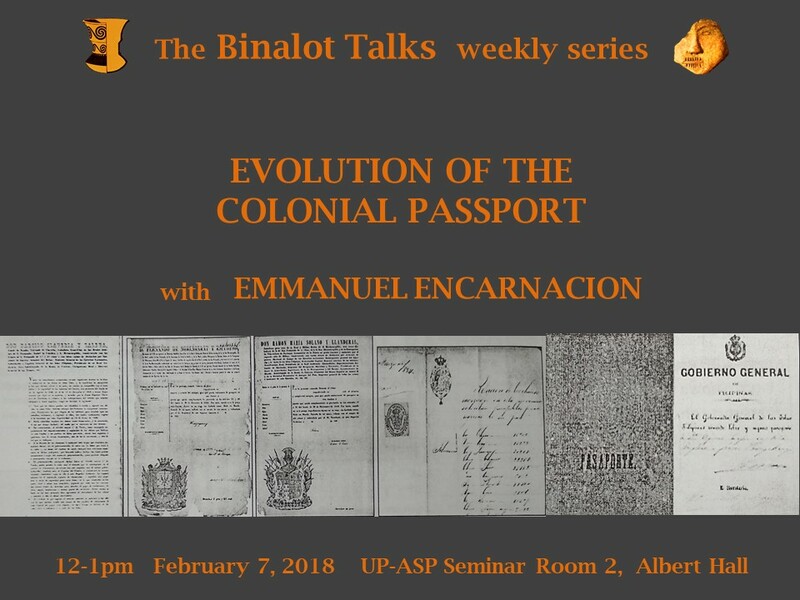 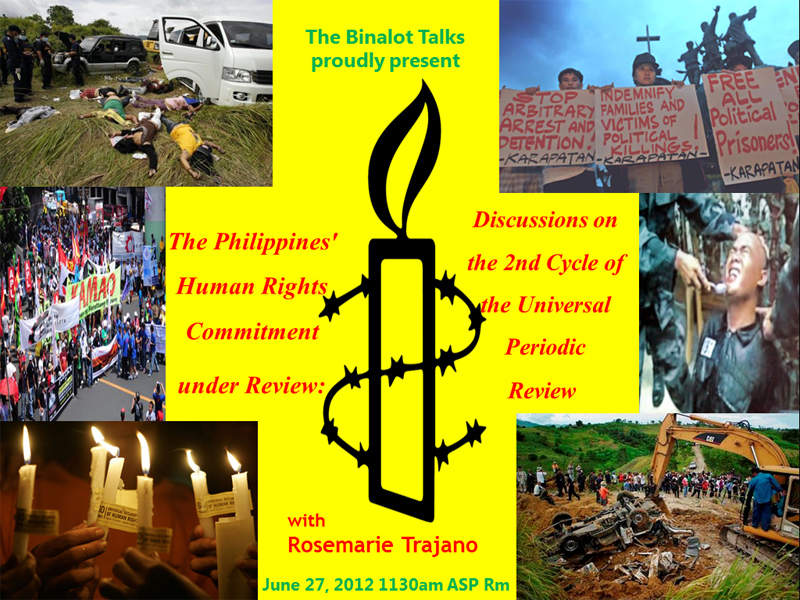 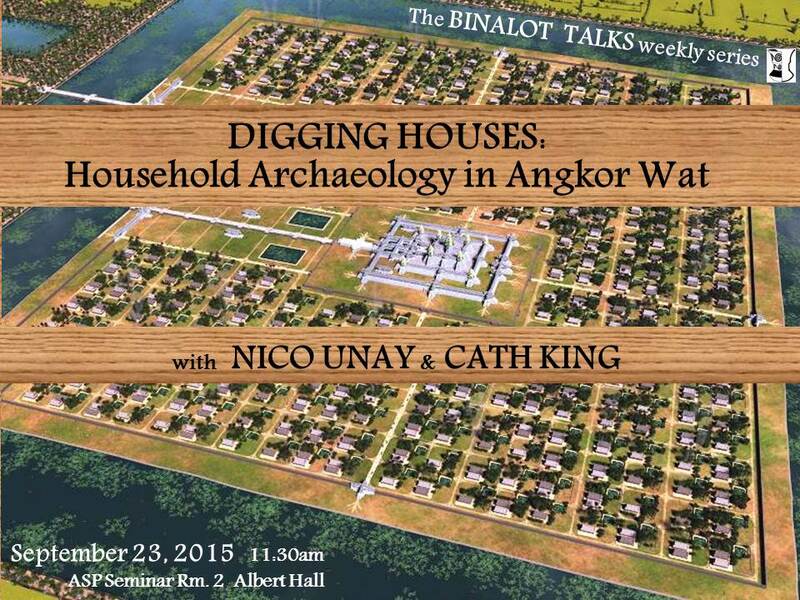 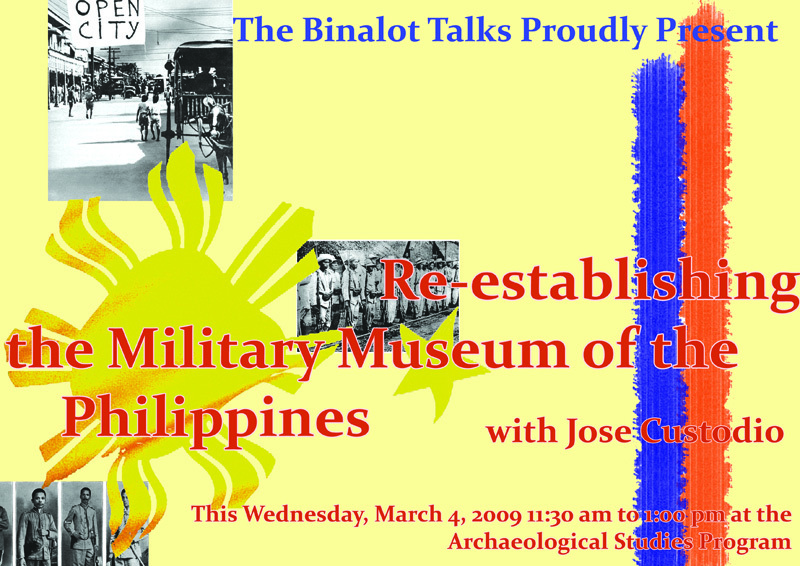 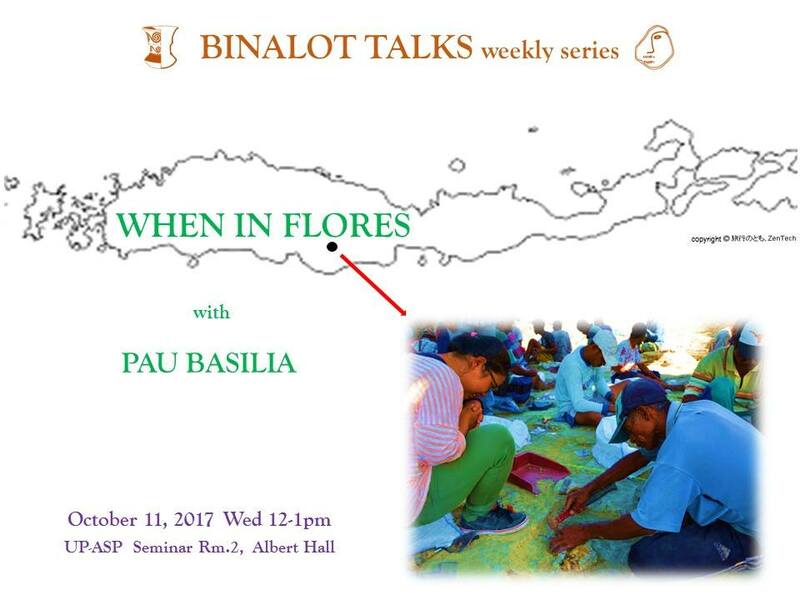 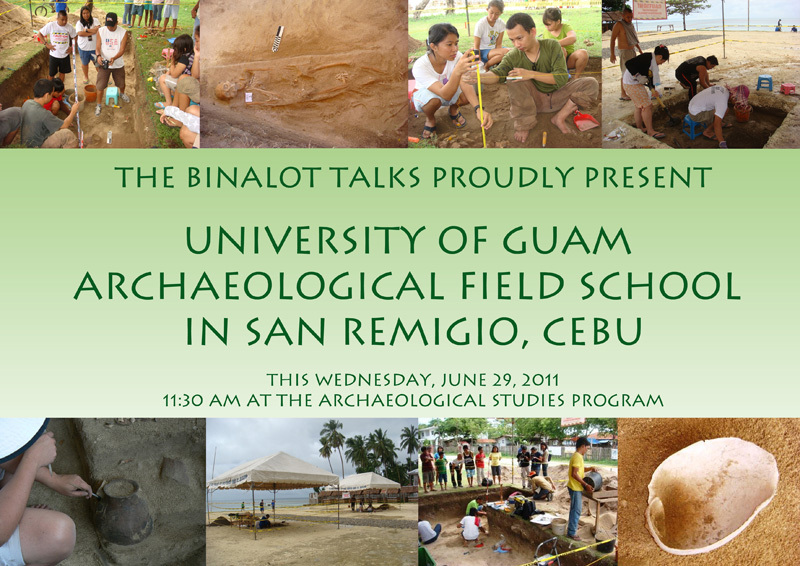 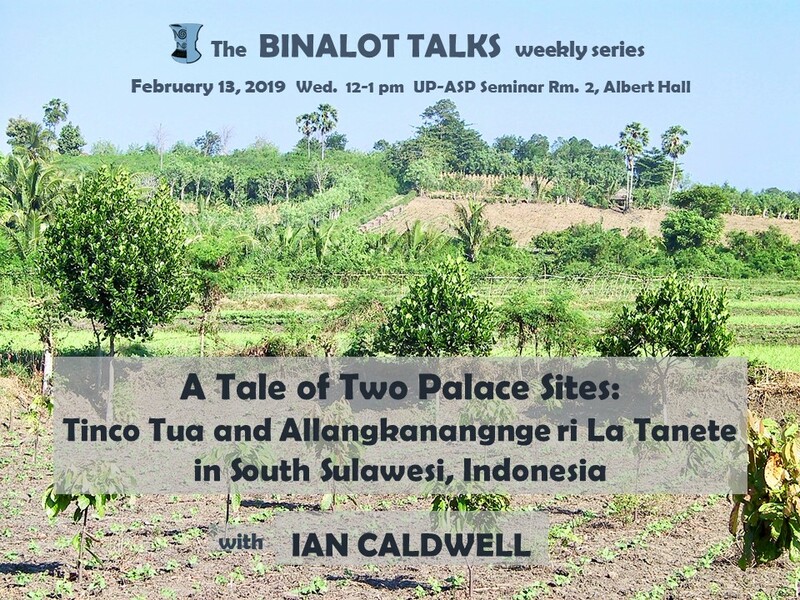 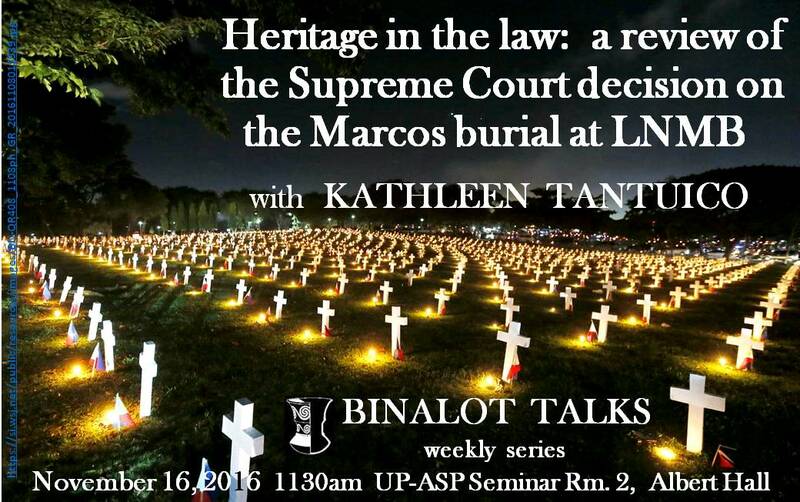 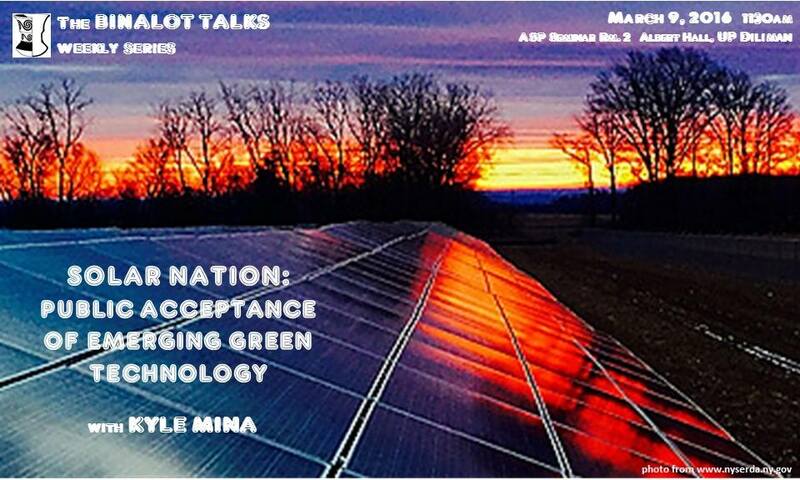 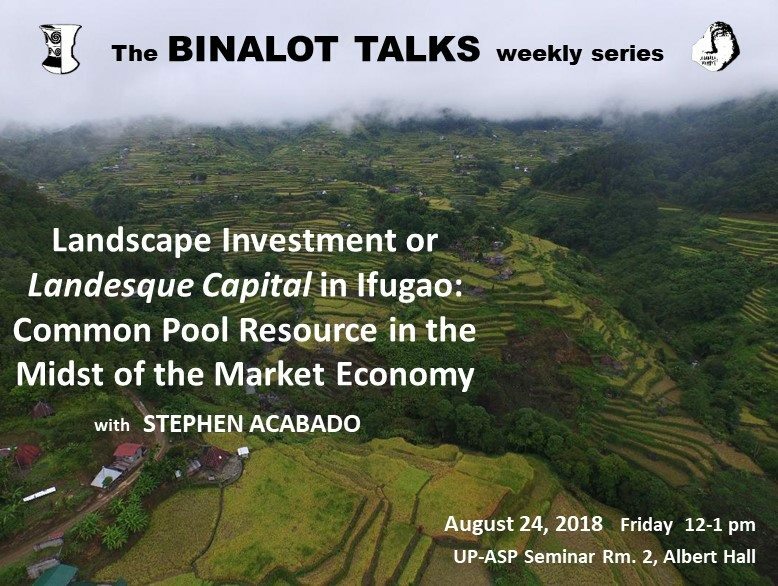 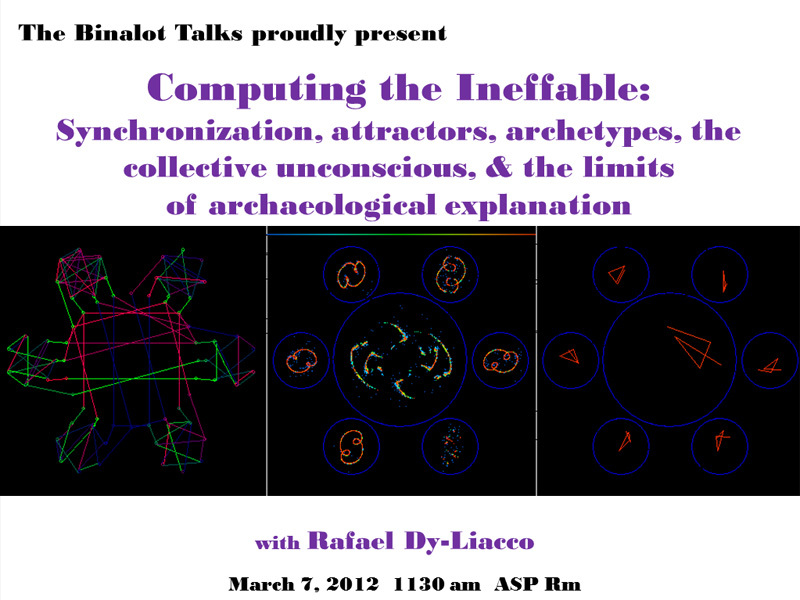 Visit the Binalot Talks Facebook page for updated information. 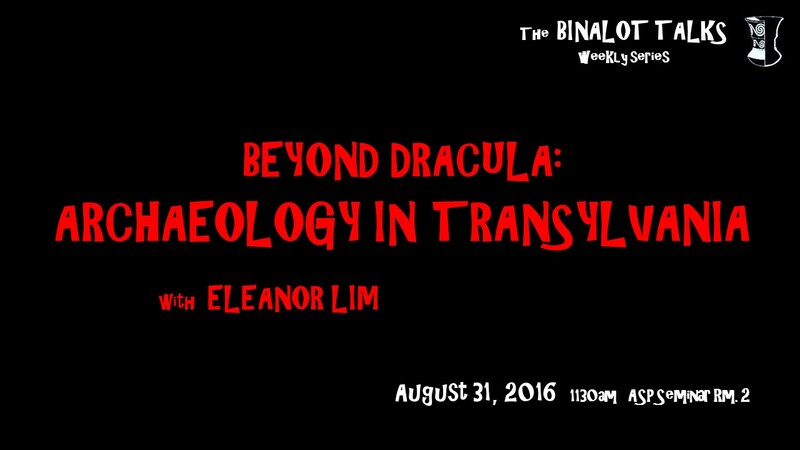 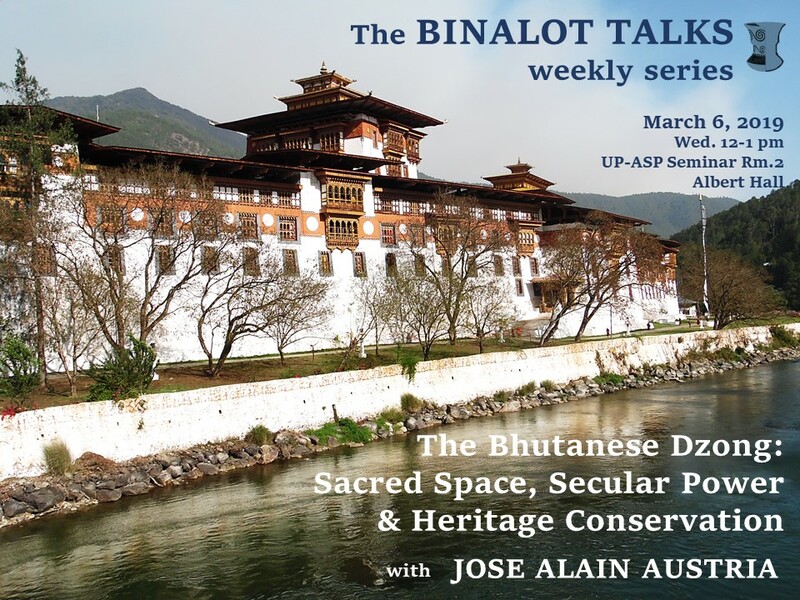 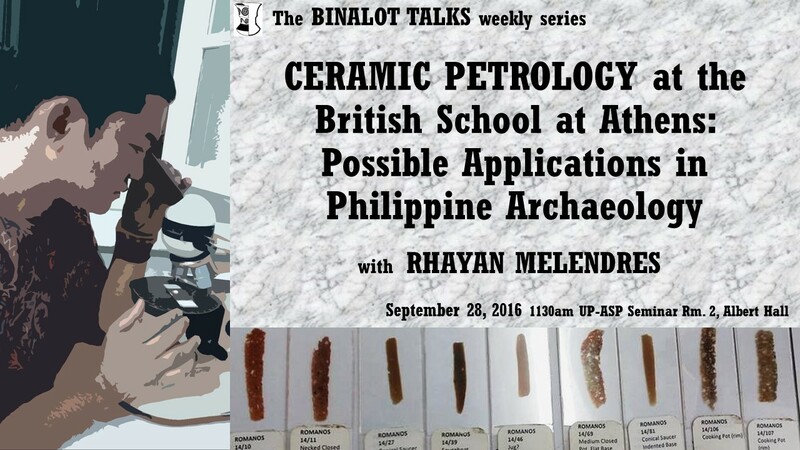 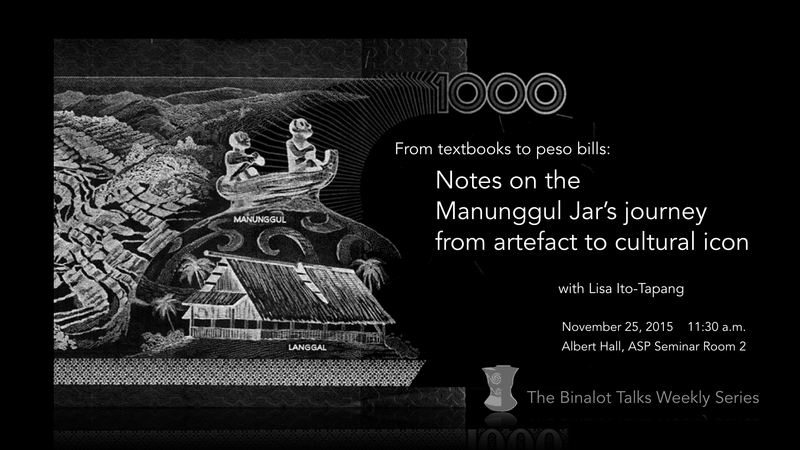 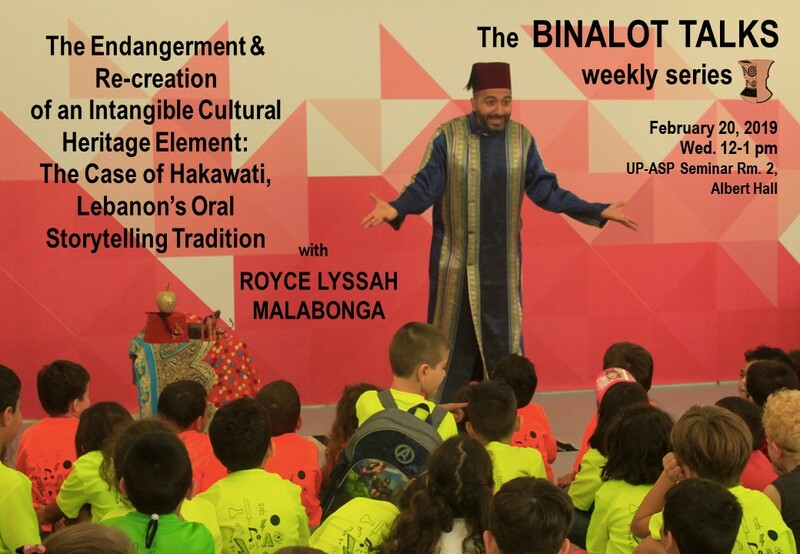 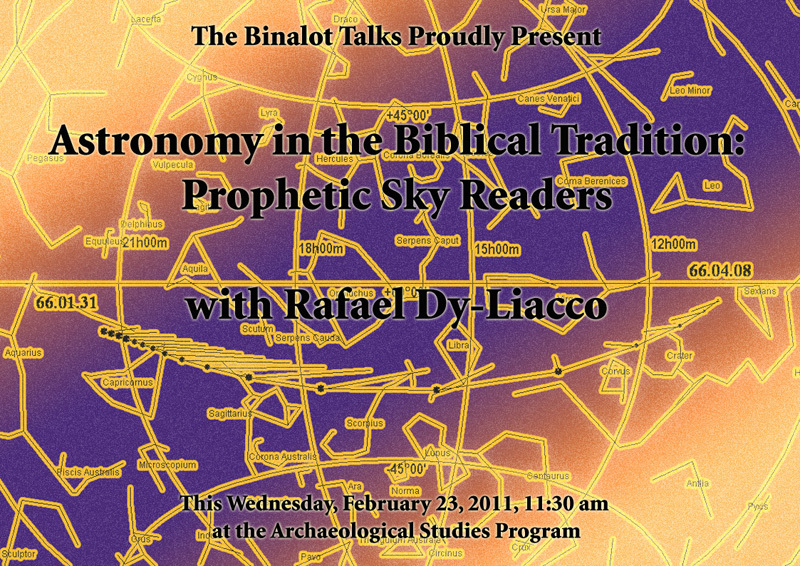 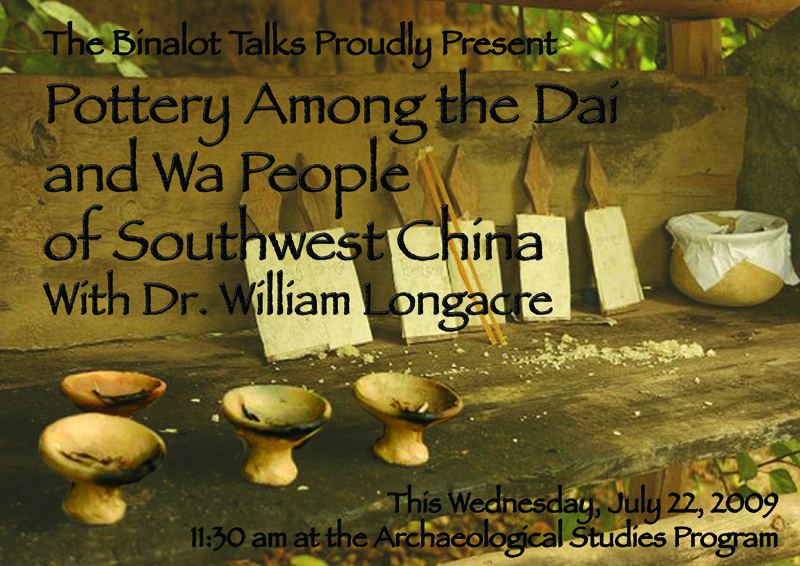 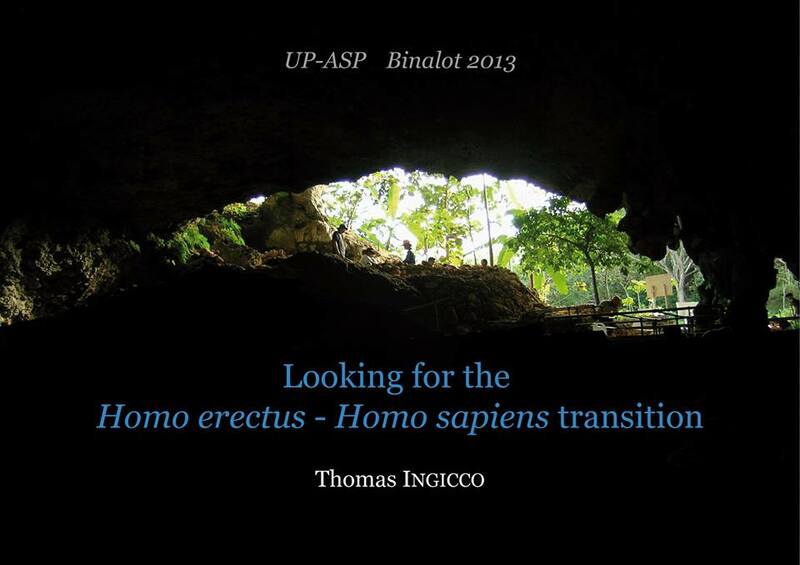 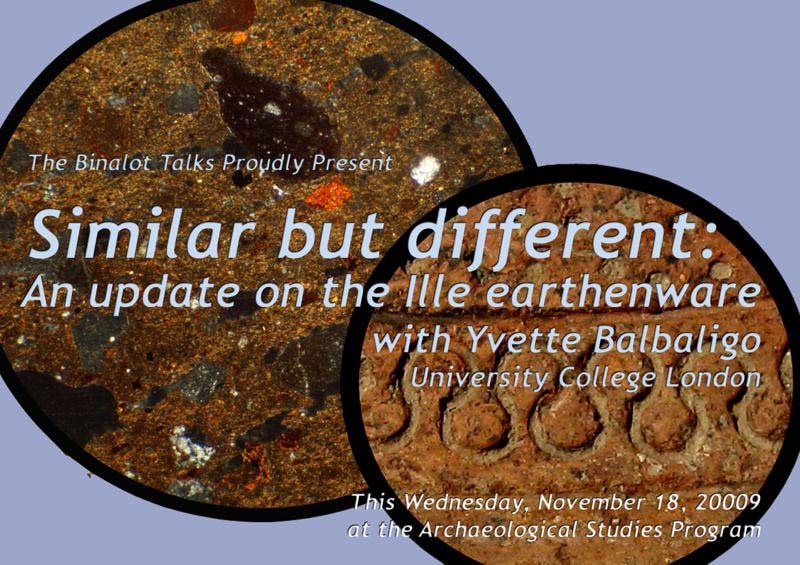 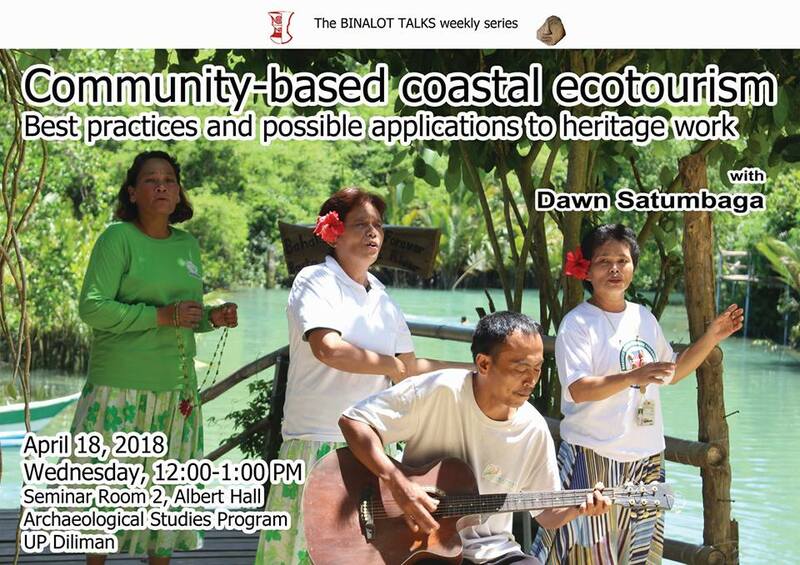 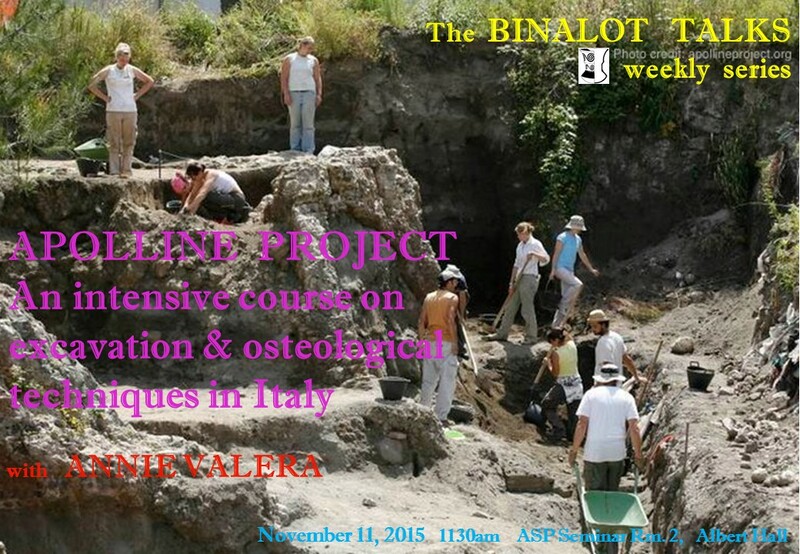 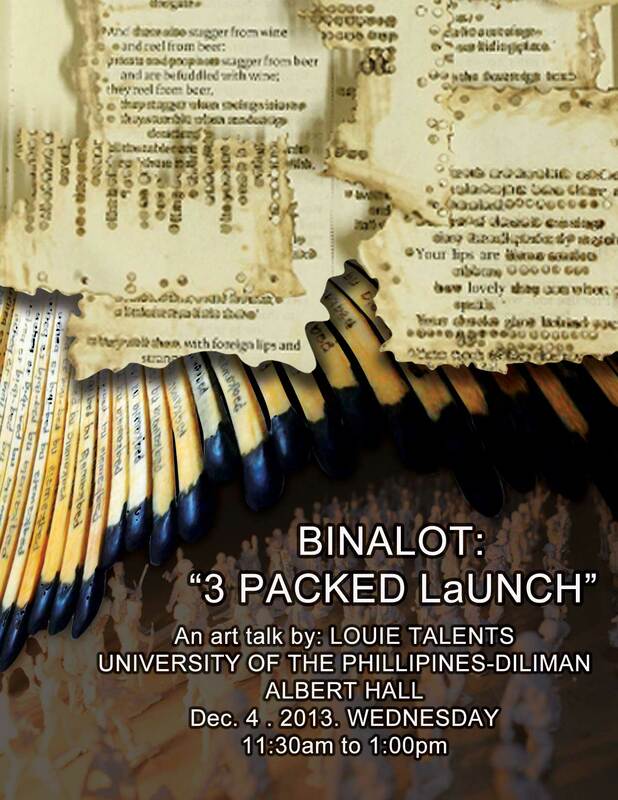 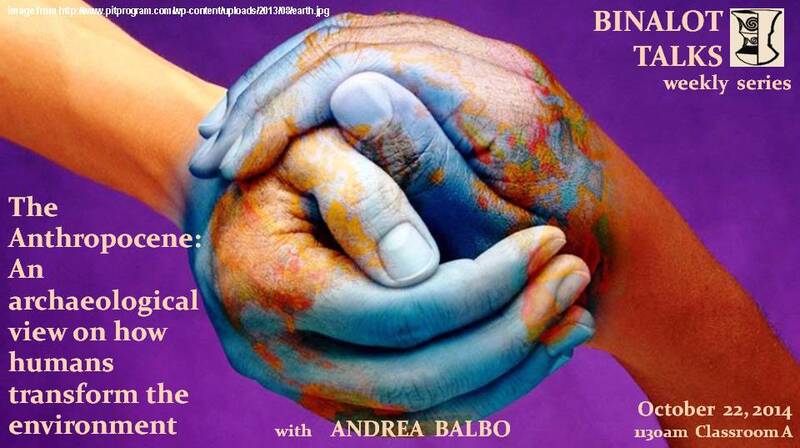 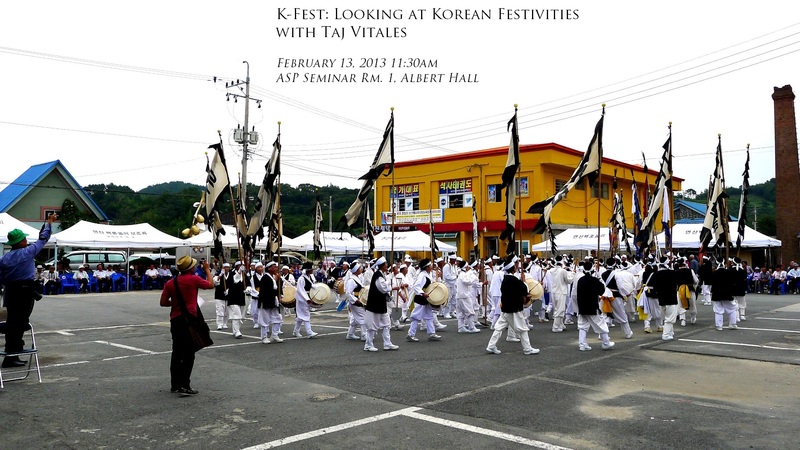 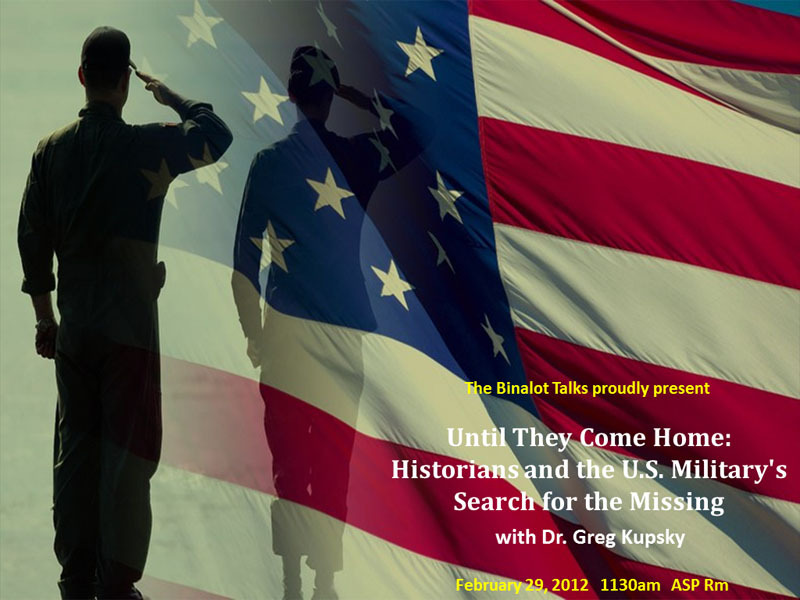 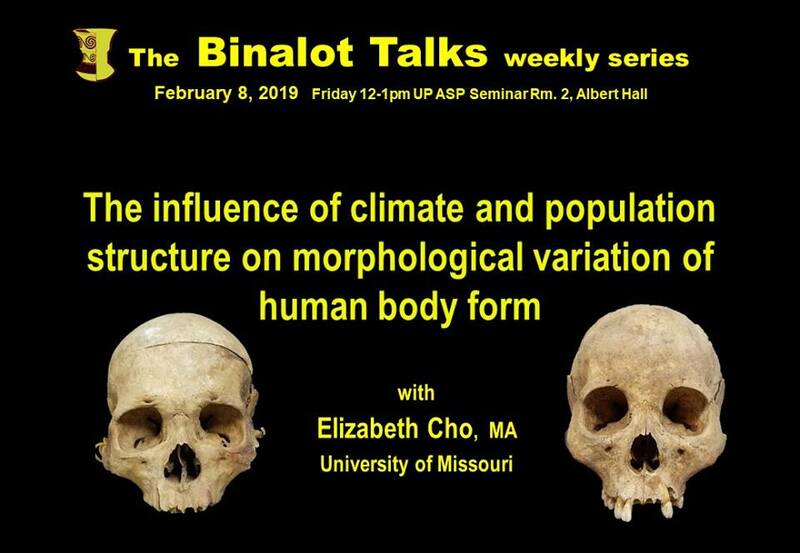 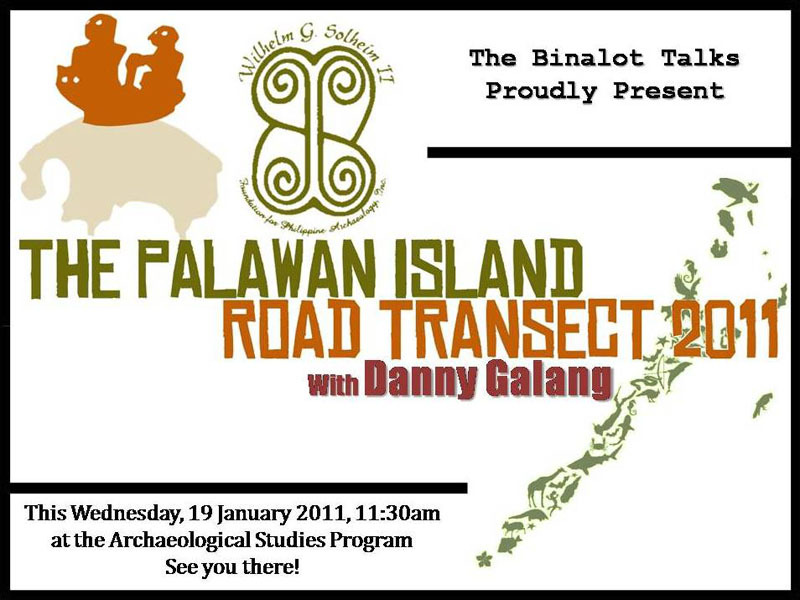 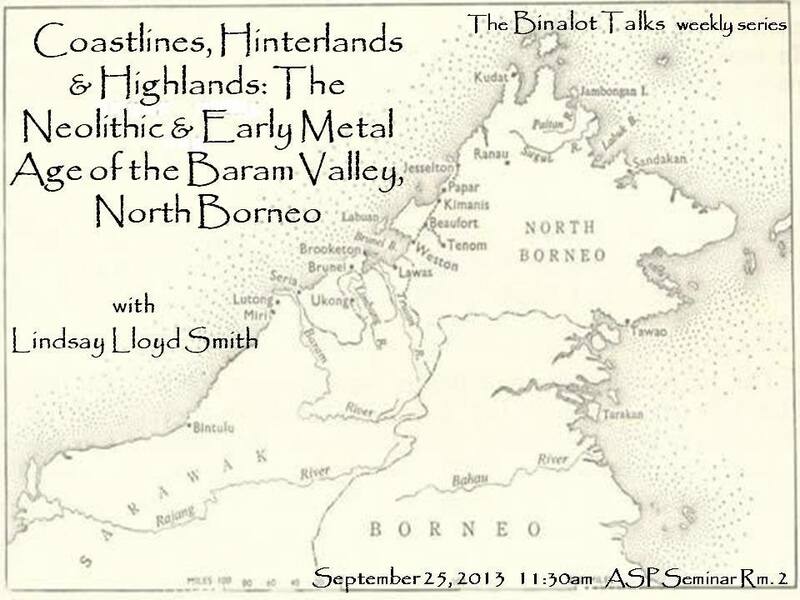 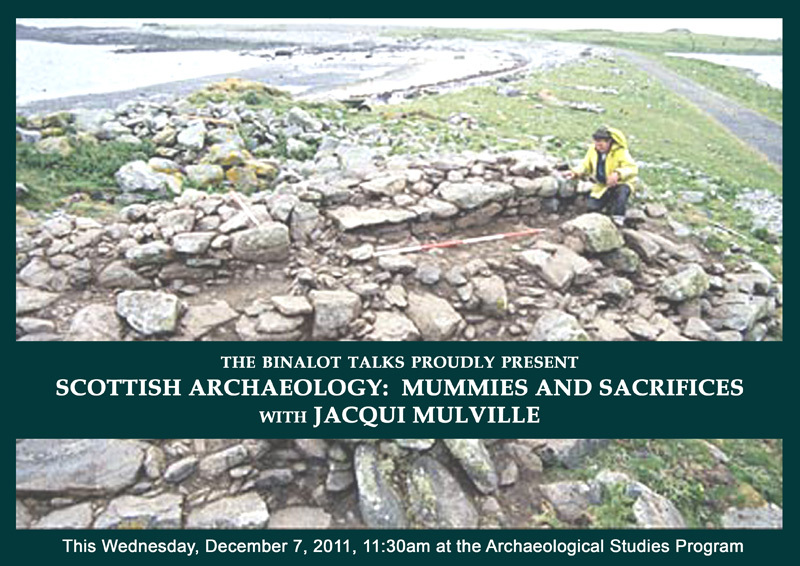 Watch this space for more information, or visit the Binalot Talks Facebook page. 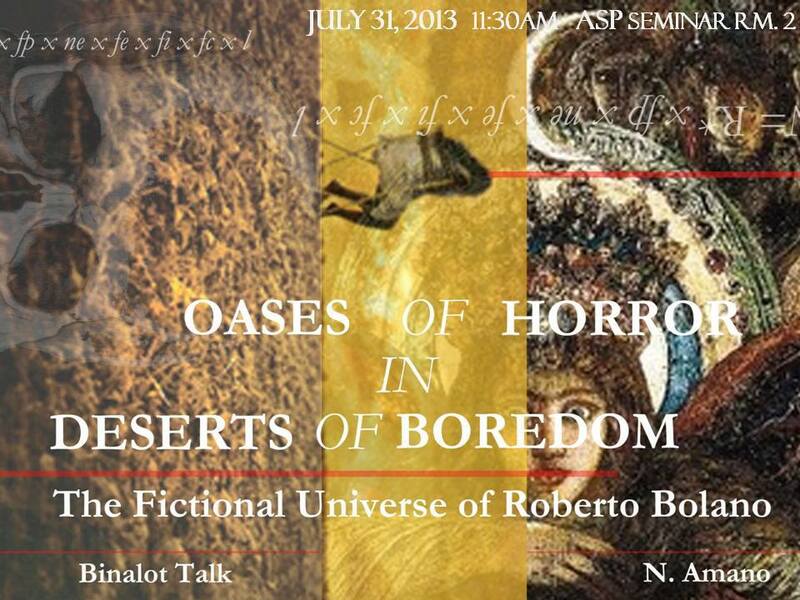 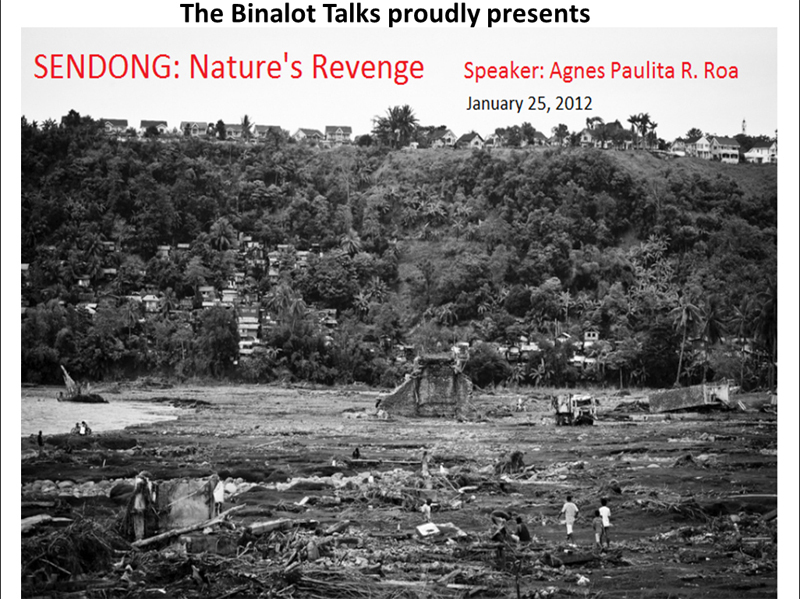 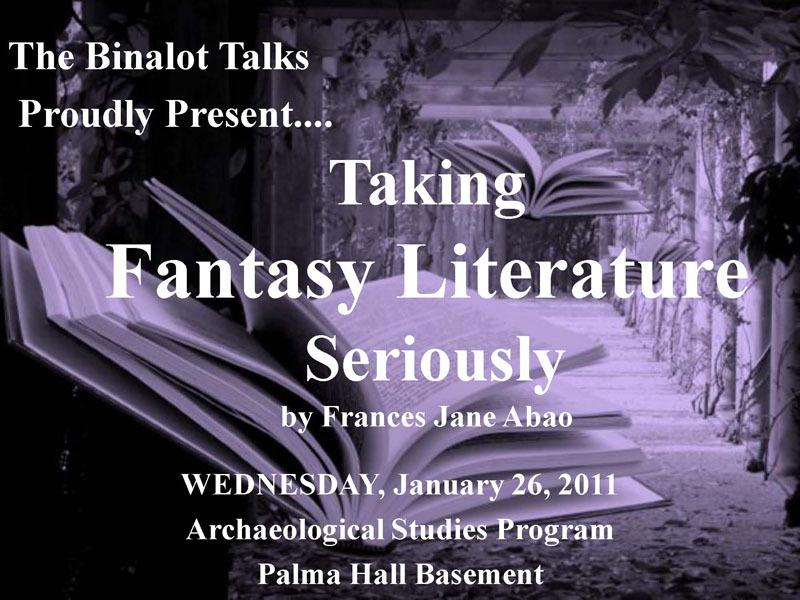 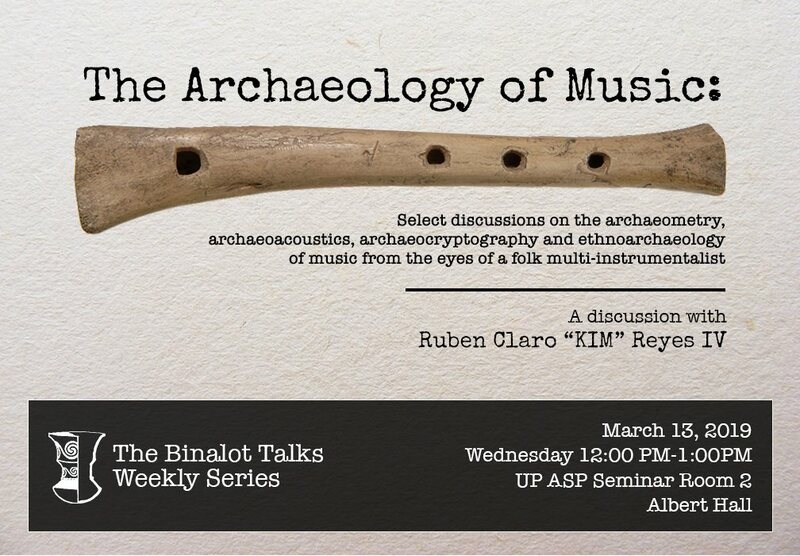 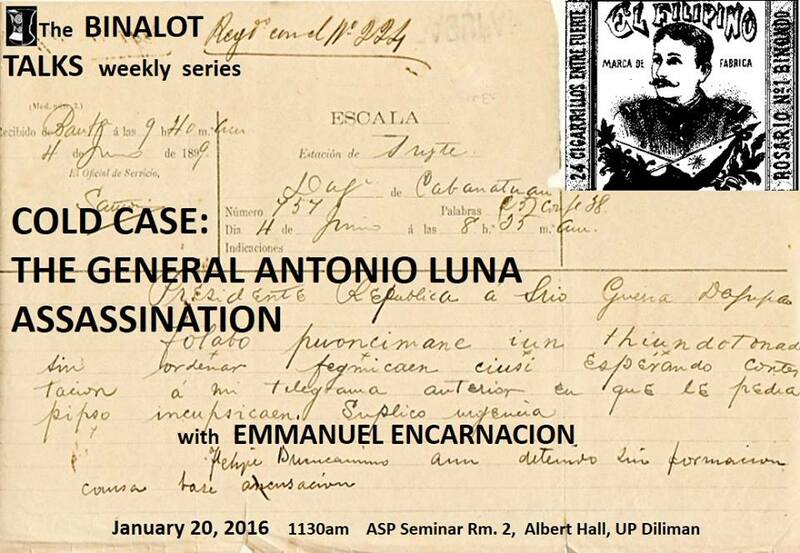 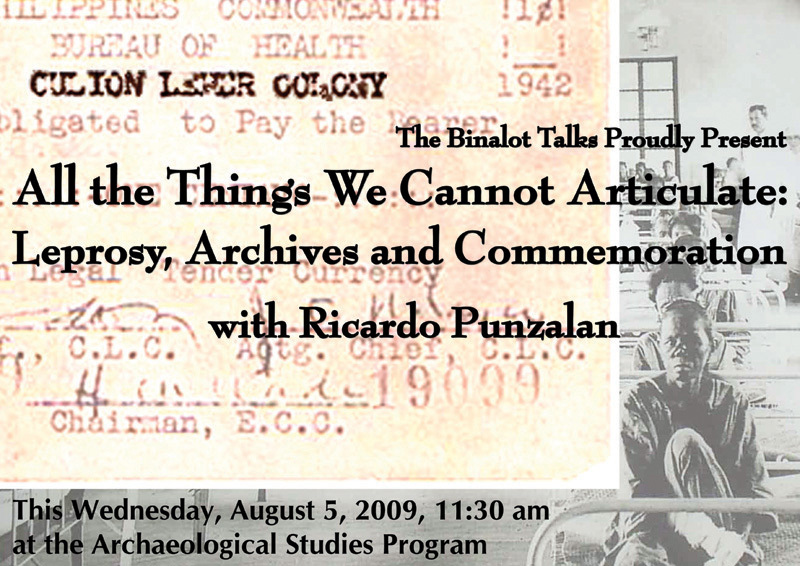 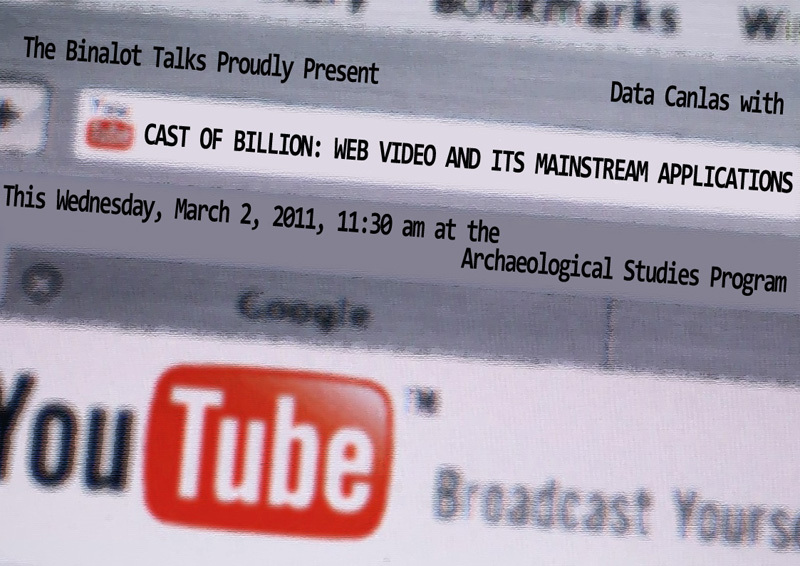 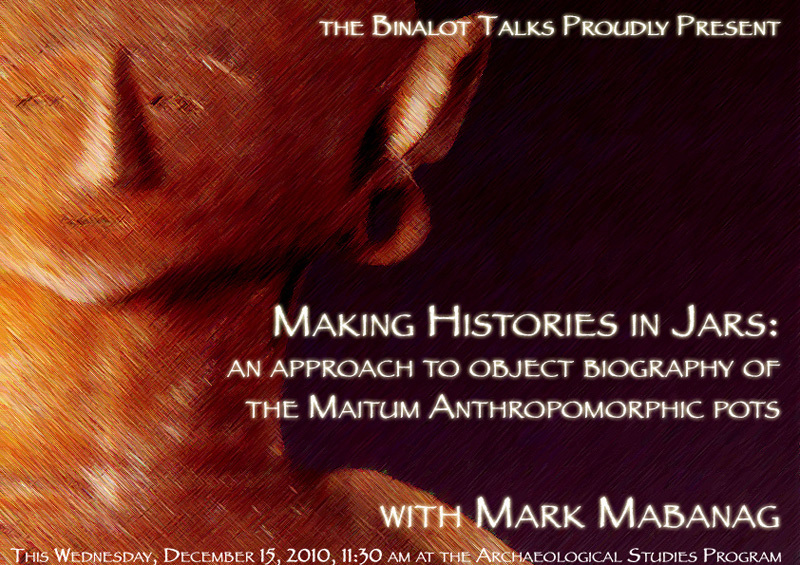 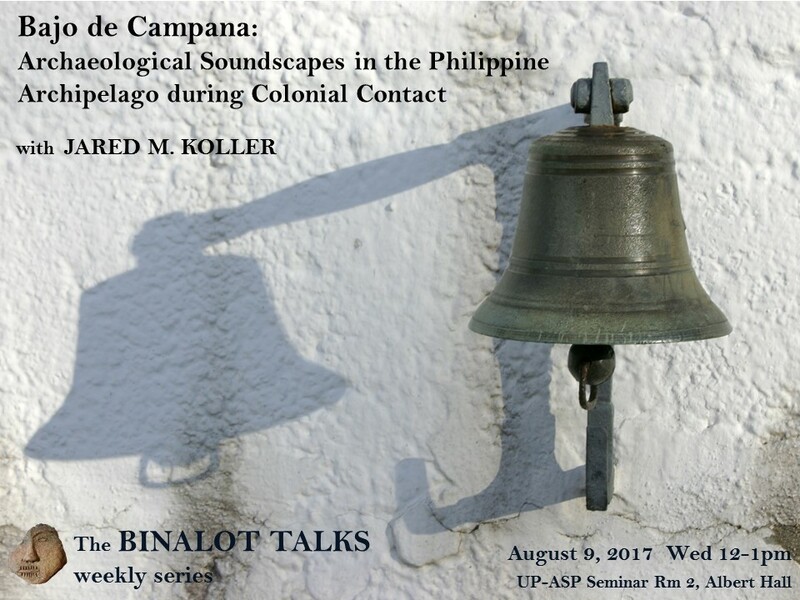 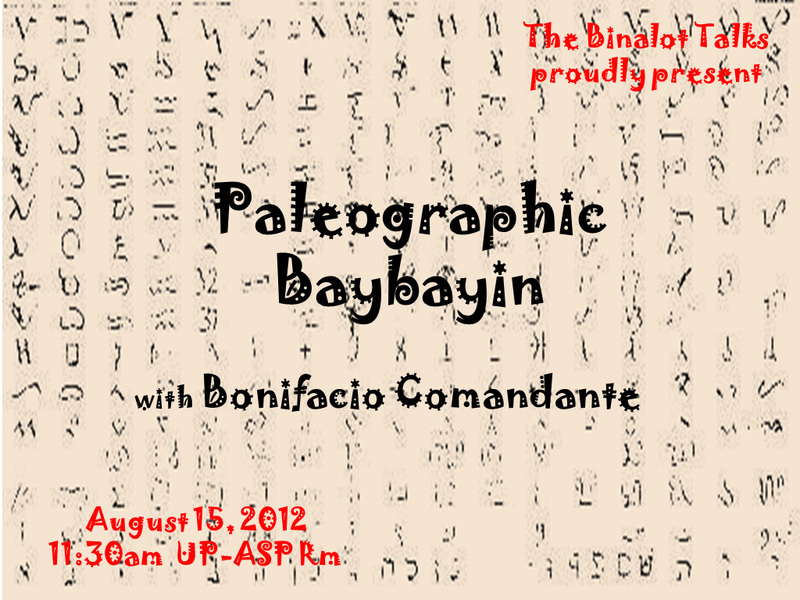 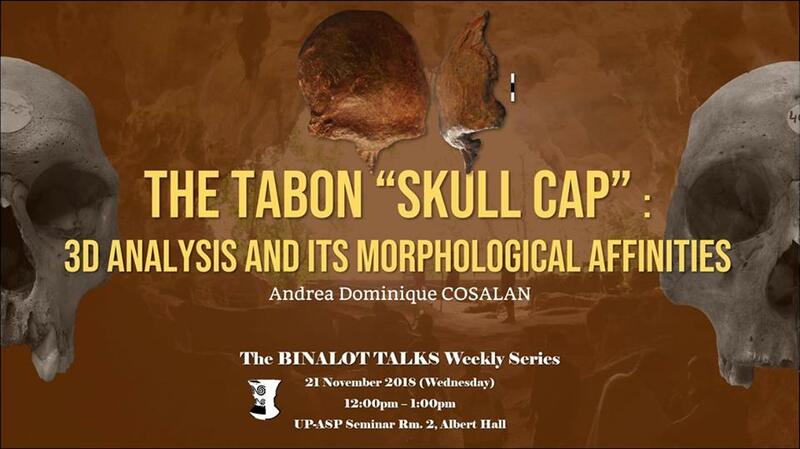 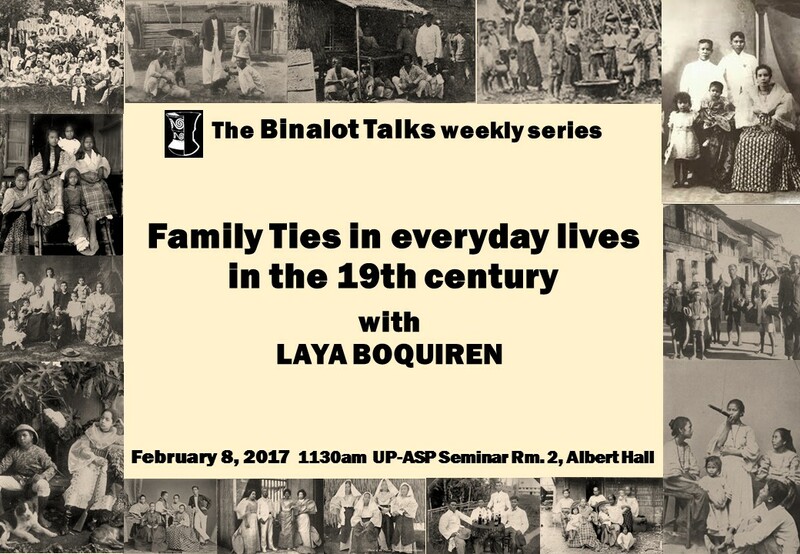 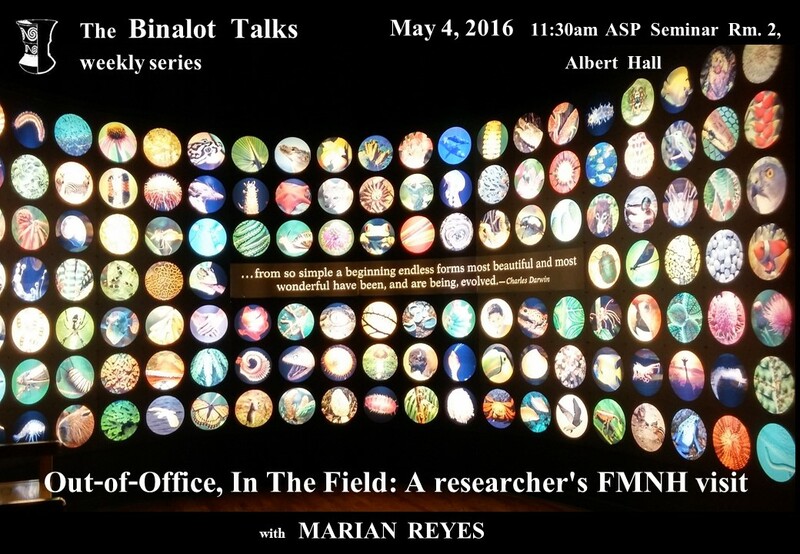 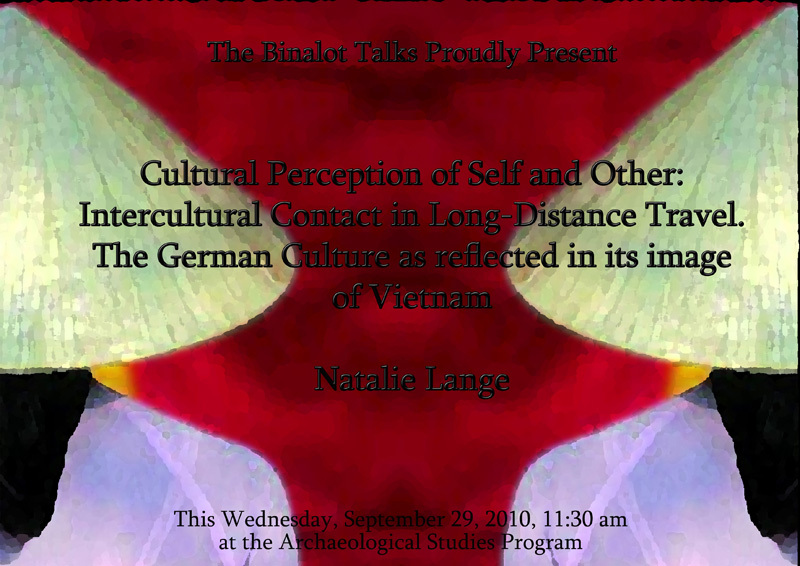 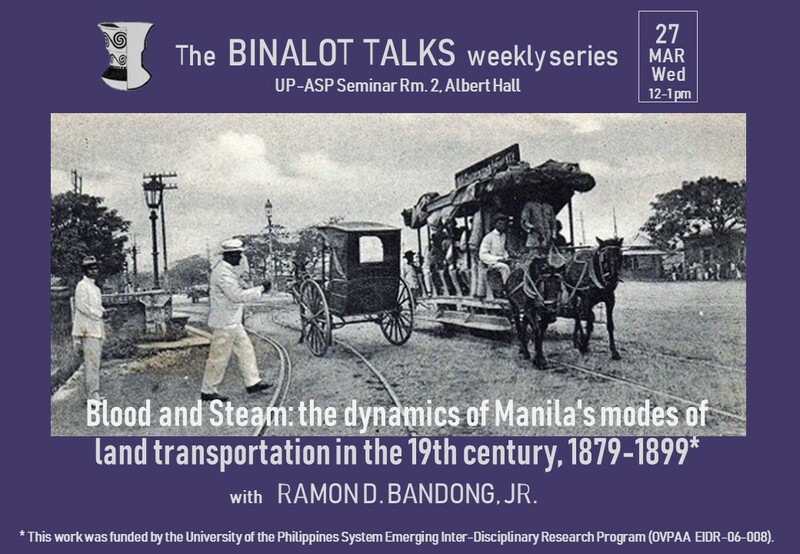 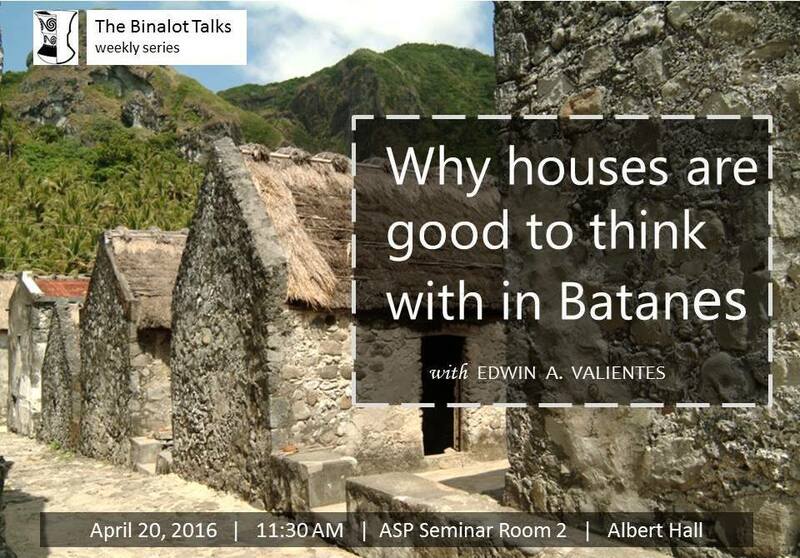 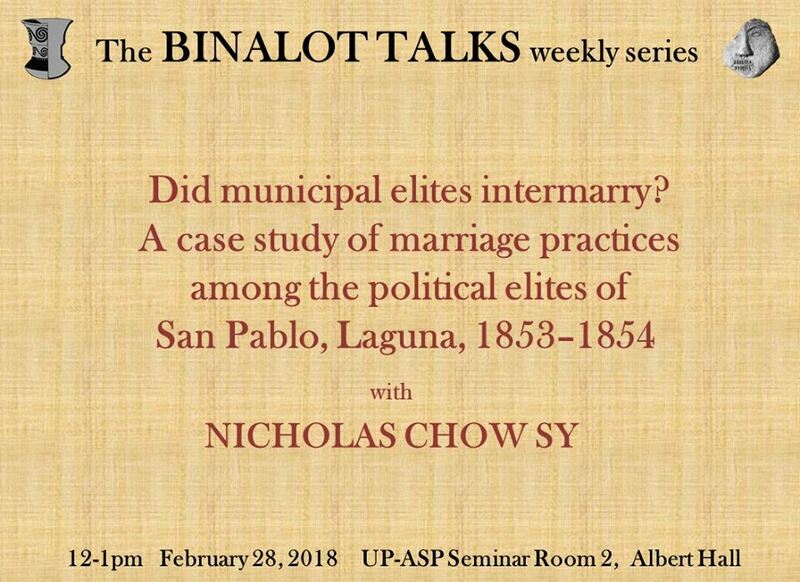 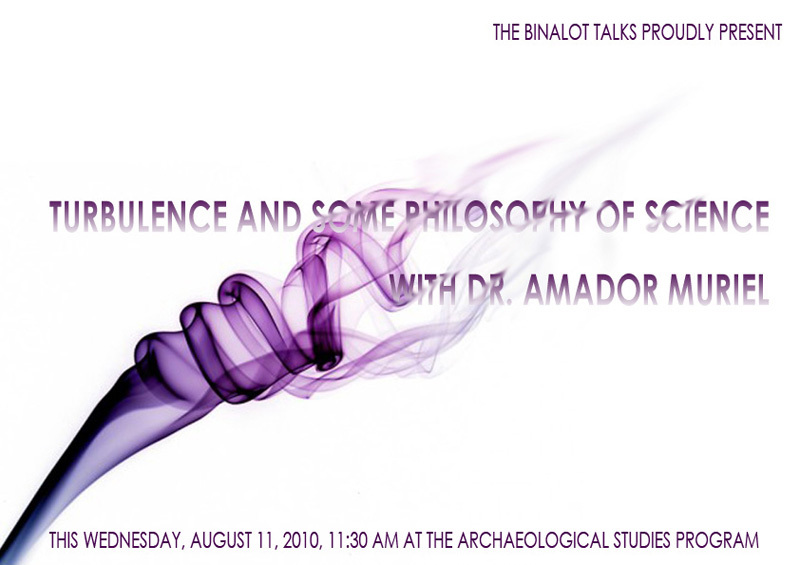 Clicking on titles will open a window, showing the poster for that particular Binalot Talk. 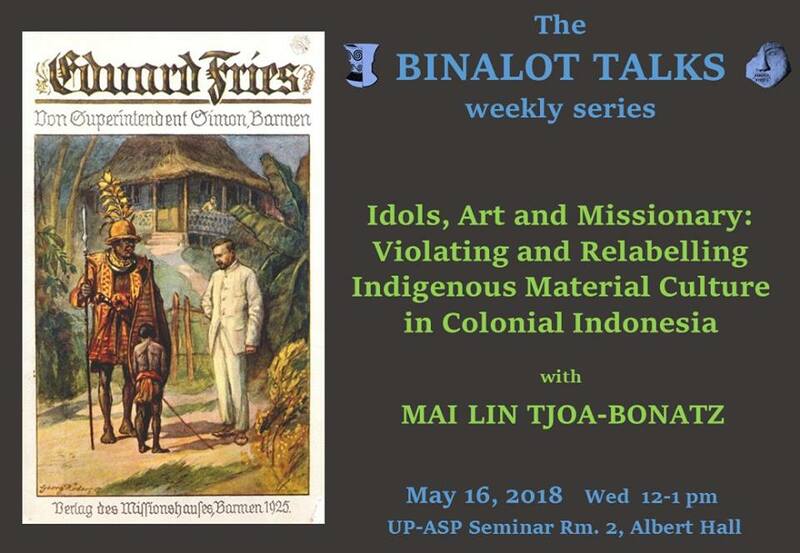 Idols, Art and Missionary: Violating and Relabelling Indegenous Material Culture in Colonial Indonesia. 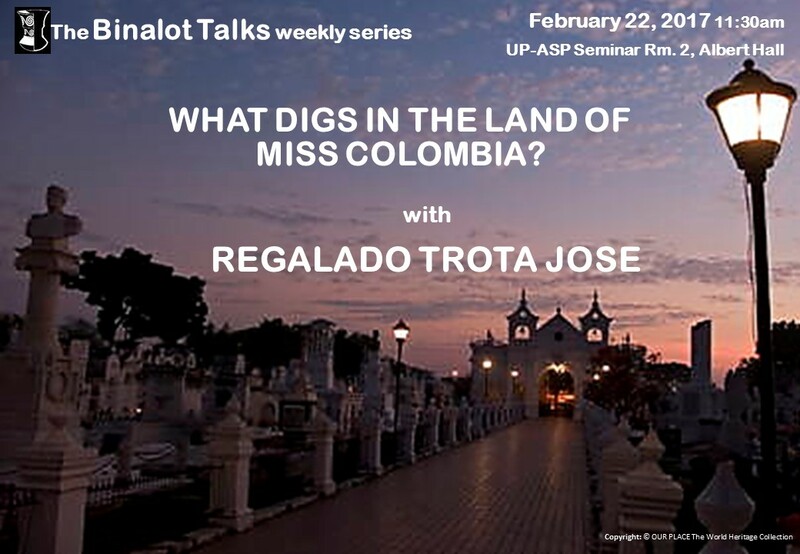 What Digs in the Land of Miss Colombia? 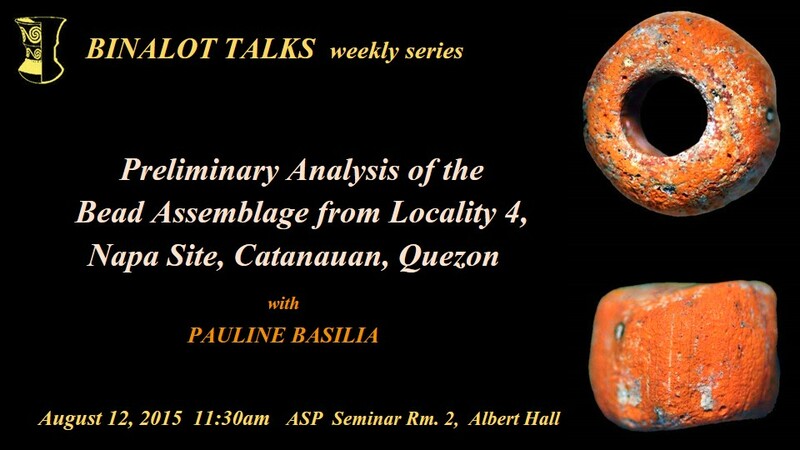 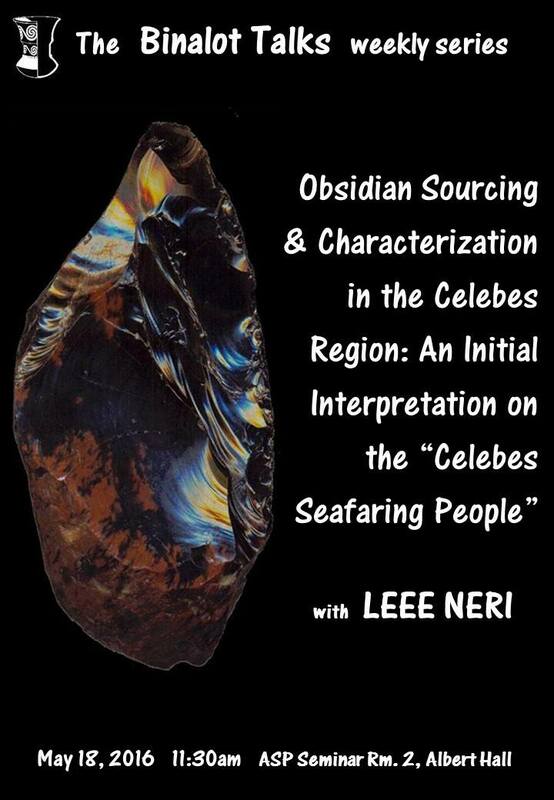 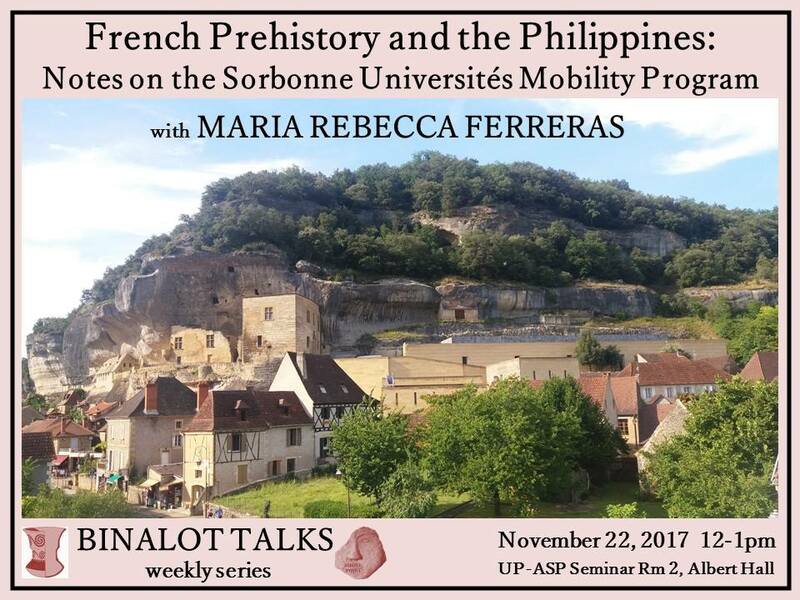 Obsidian Sourcing and Characterization in the Celebes Region: An Intial Interpretation on the "Celebes Seafaring People"
Whose MTBMLE program? 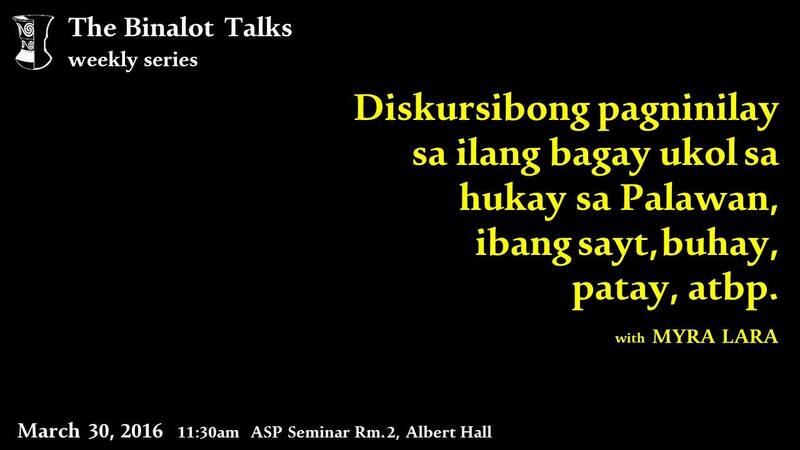 Yours? 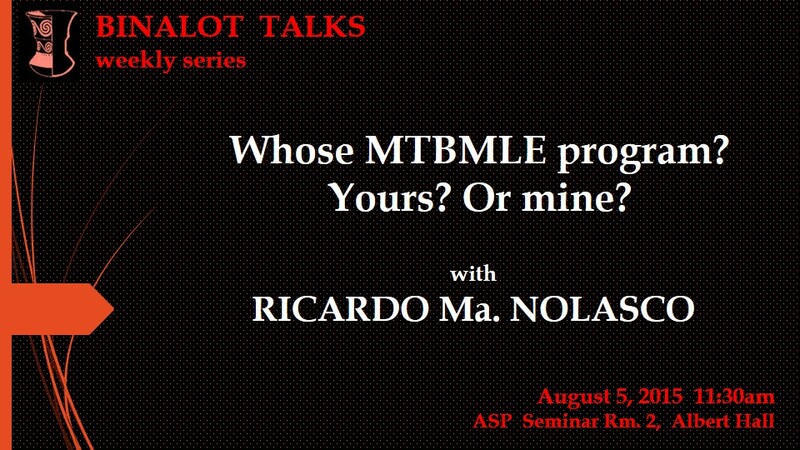 Or mine? 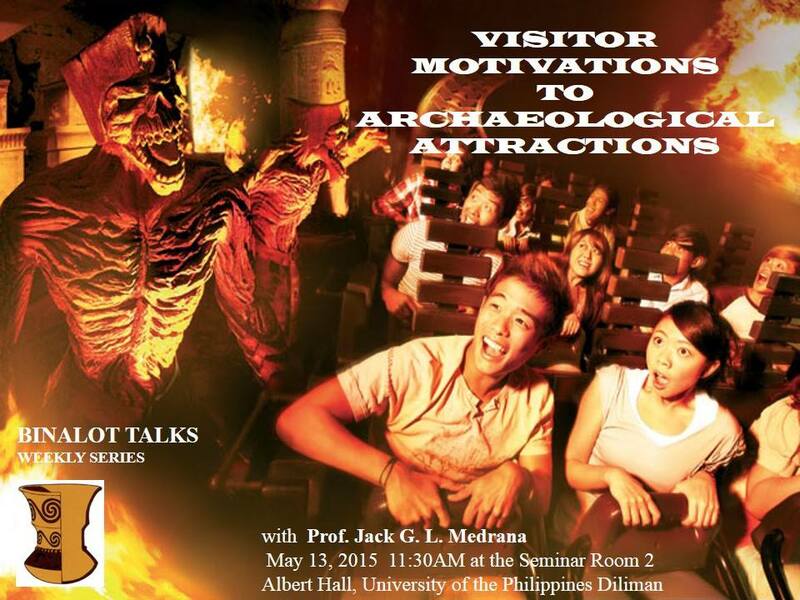 Visitor Motivations to Archaeological Attractions. 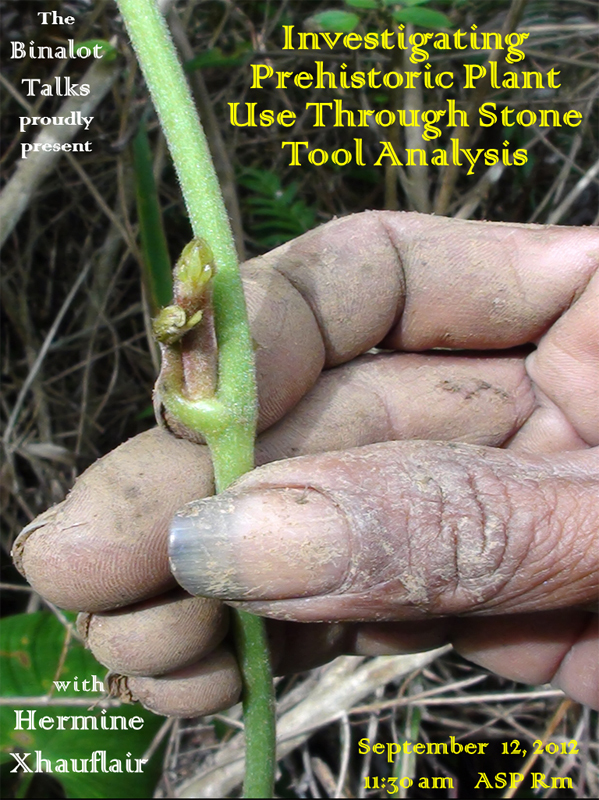 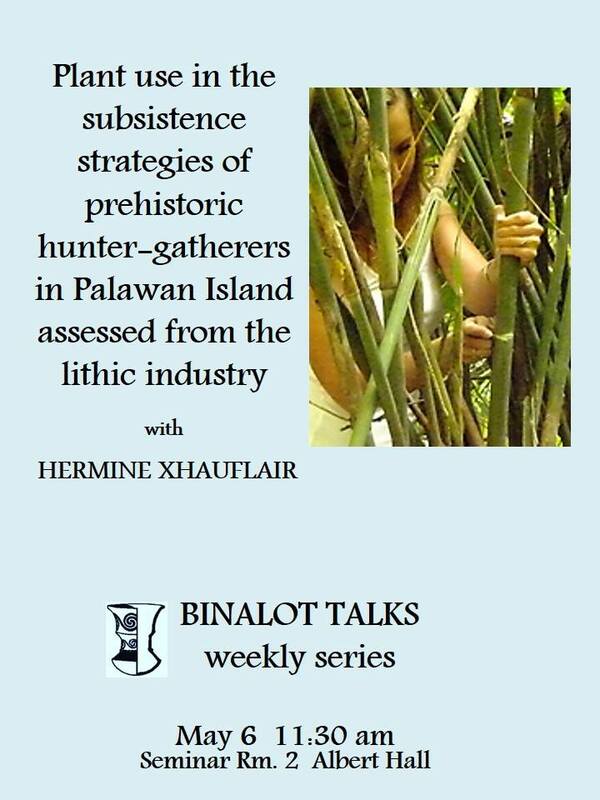 Plant Use in the Subsistence Strategies of Prehistoric Hunter-Gatherers in Palawan Island Assessed from the Lithic Industry. 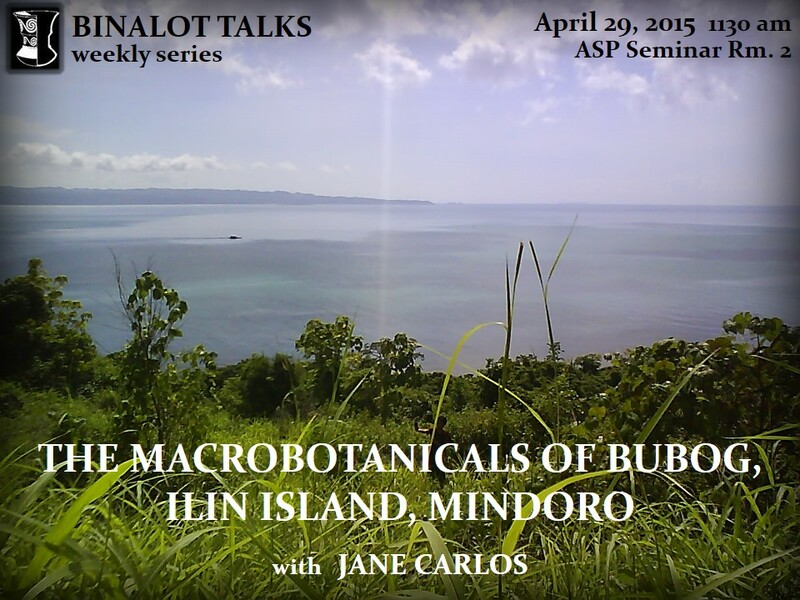 The Macrobotanicals Of Bubog, Ilin Island, Mindoro. 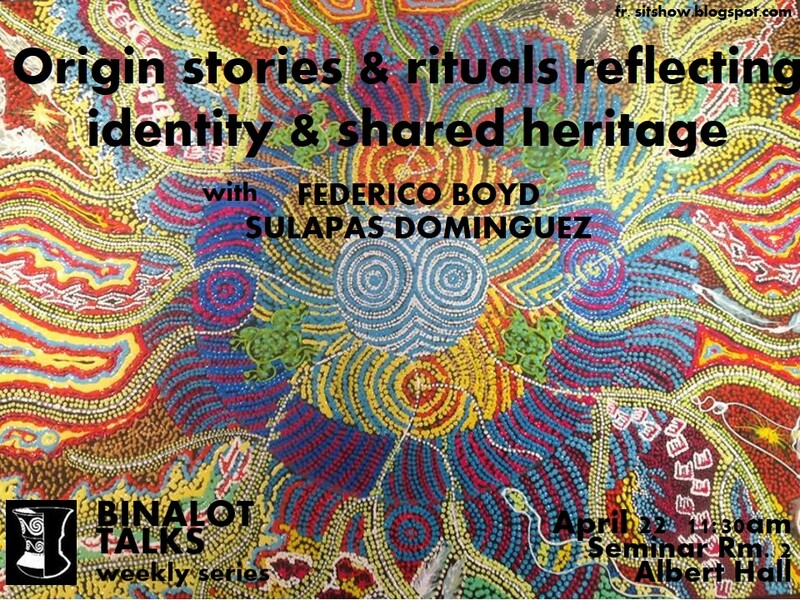 Origin Stories and Rituals Reflecting Identity and Shared Heritage. 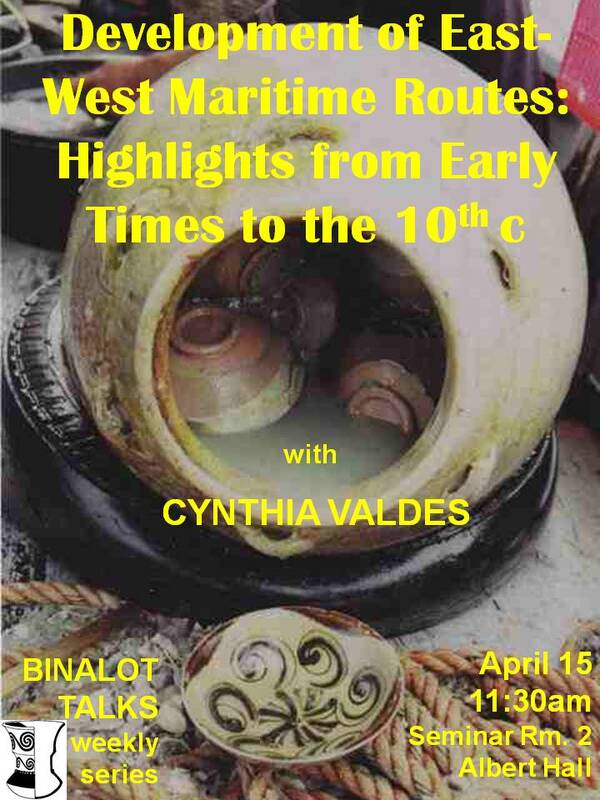 Development of East-West Maritime Routes: Highlights from Early Times to the 10th century. 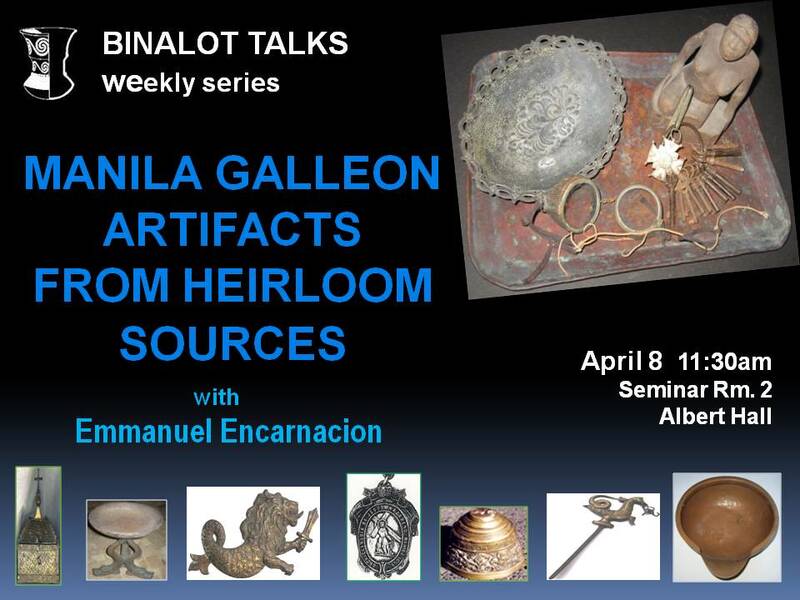 Manila Galleon Artifacts from Heirloom Sources. 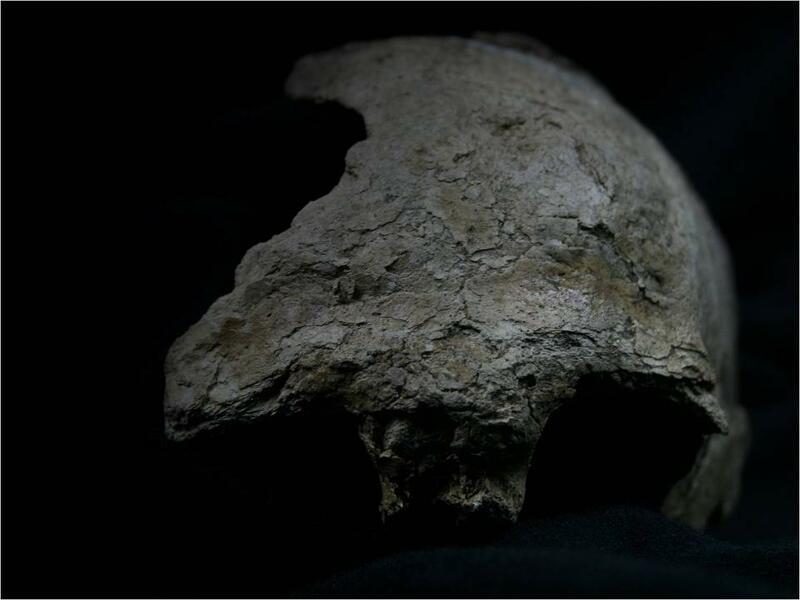 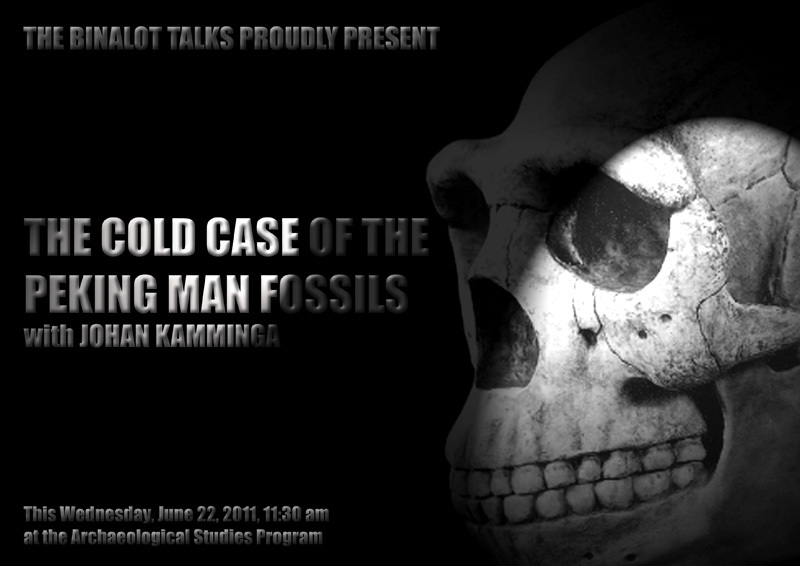 The Ecology of Homo Erectus in Java. 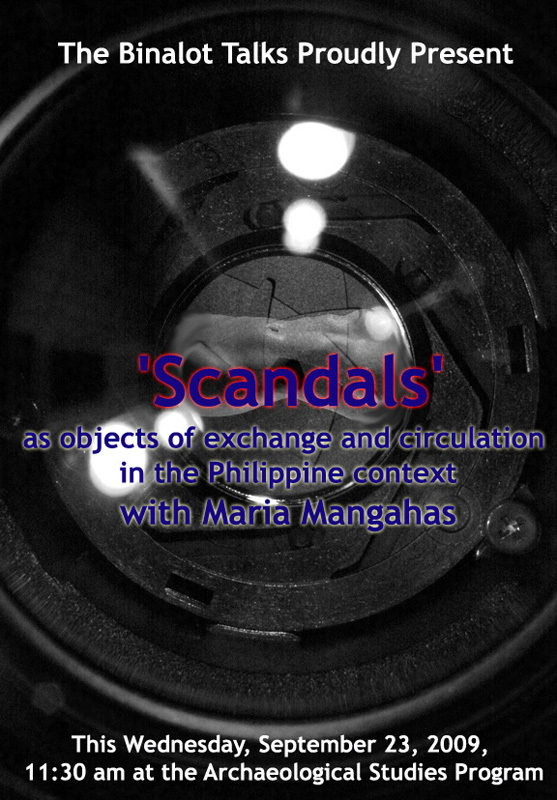 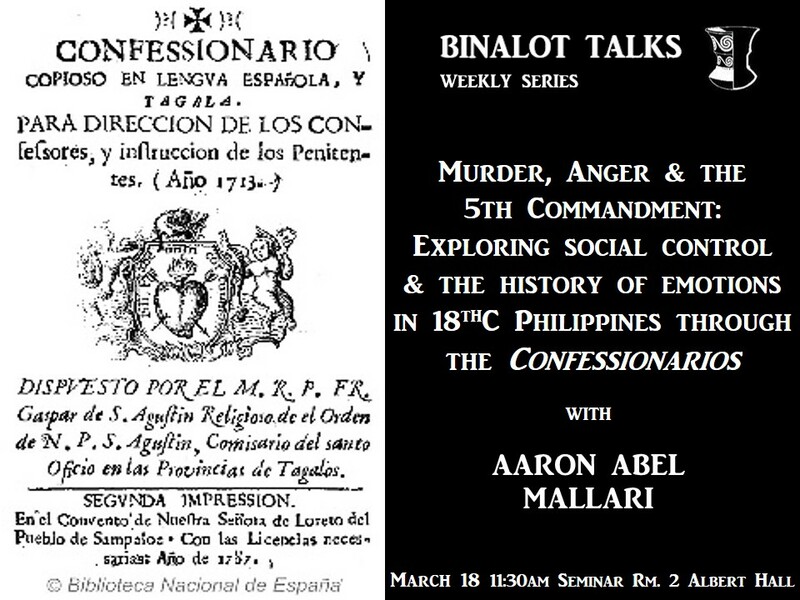 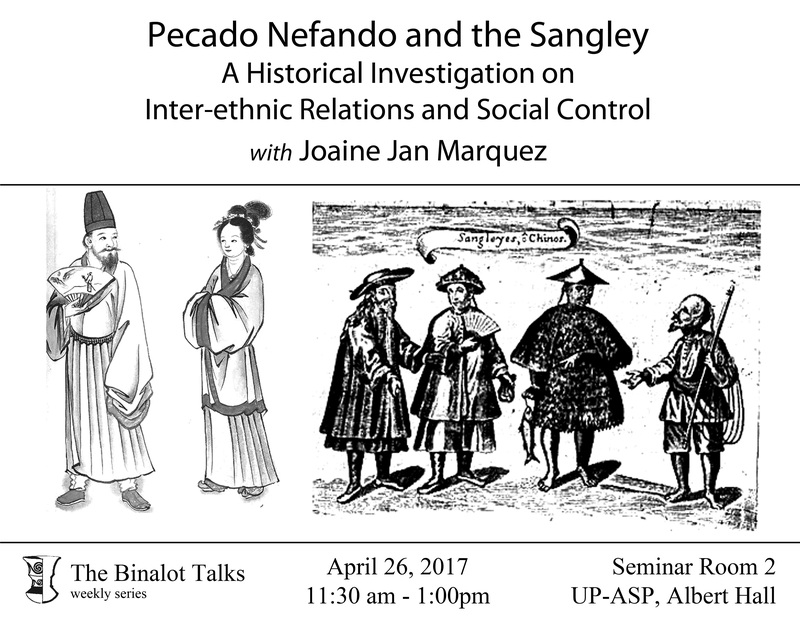 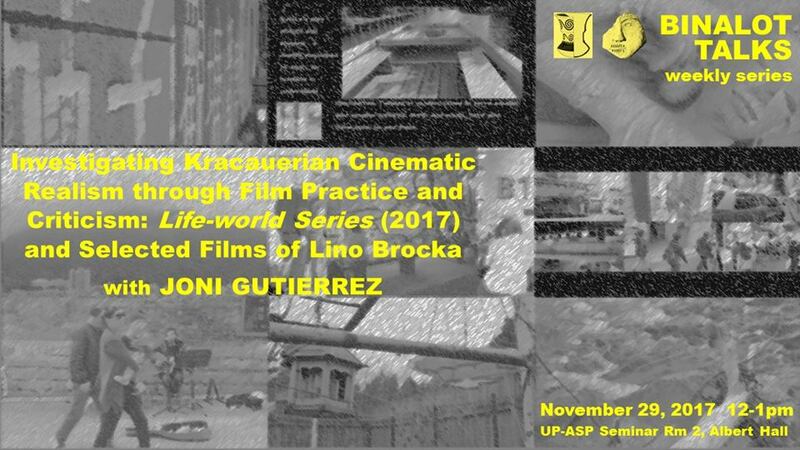 Murder, Anger & the 5th Commandment: Exploring social control & the history of emotions in 18thC Philippines through the Confessionarios. 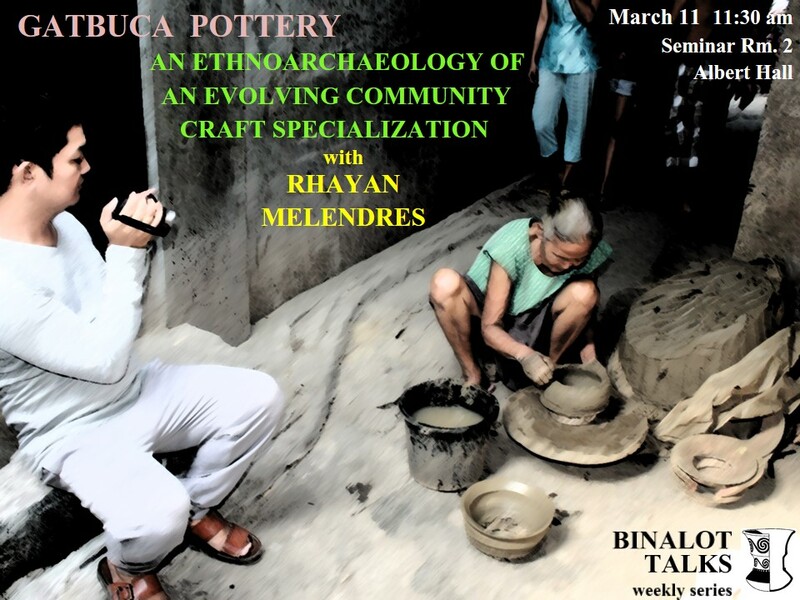 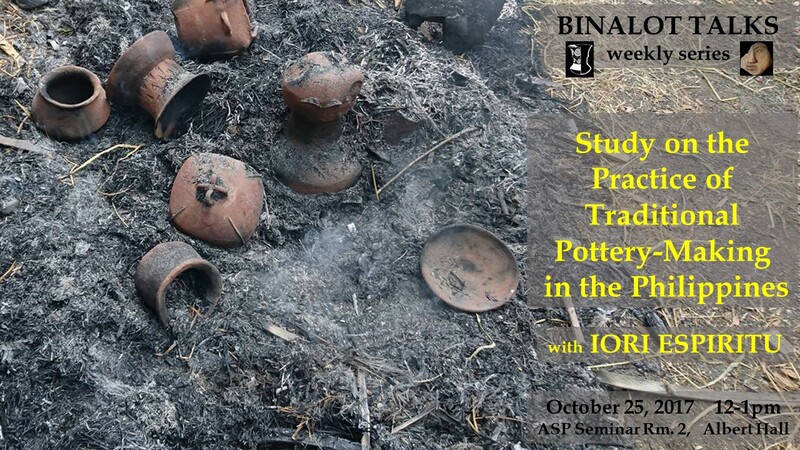 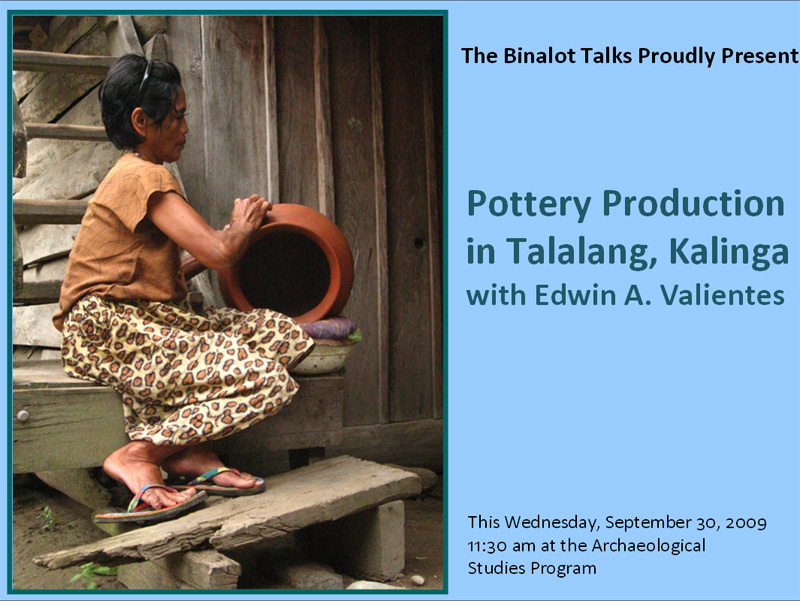 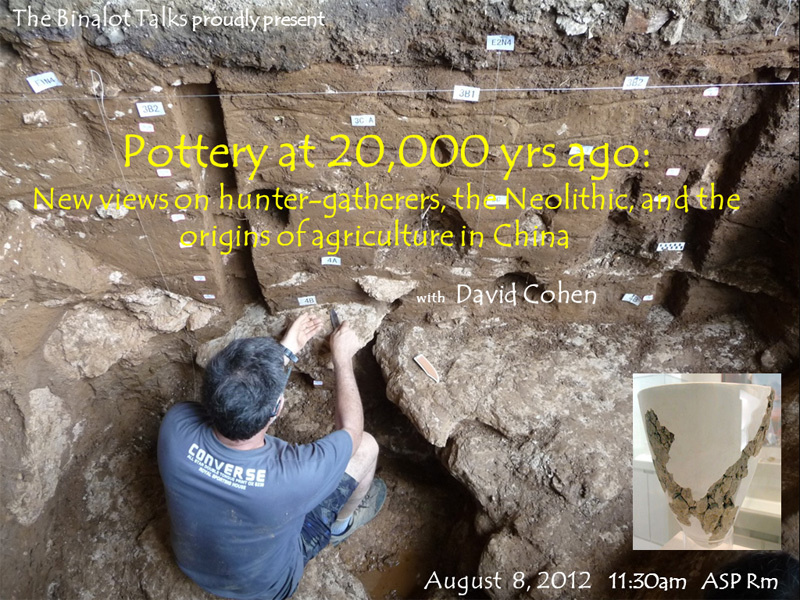 Gatbuca Pottery: An Ethnoarchaeology of an Evolving Community Craft Specialization. 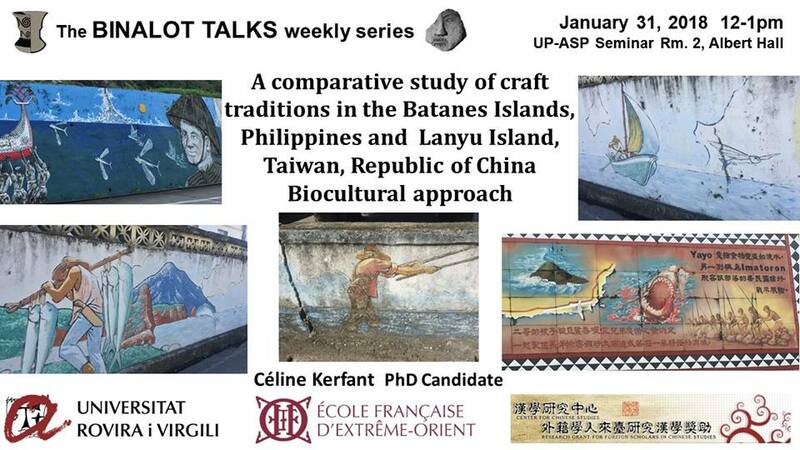 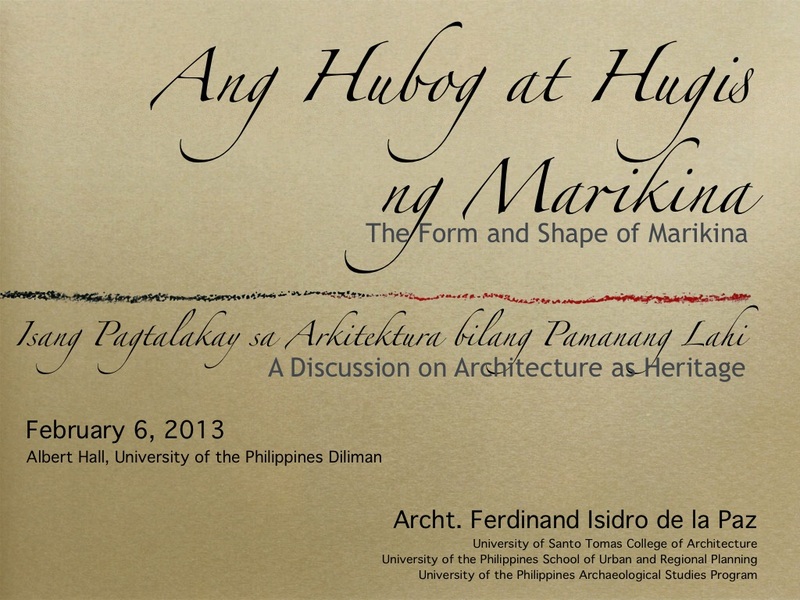 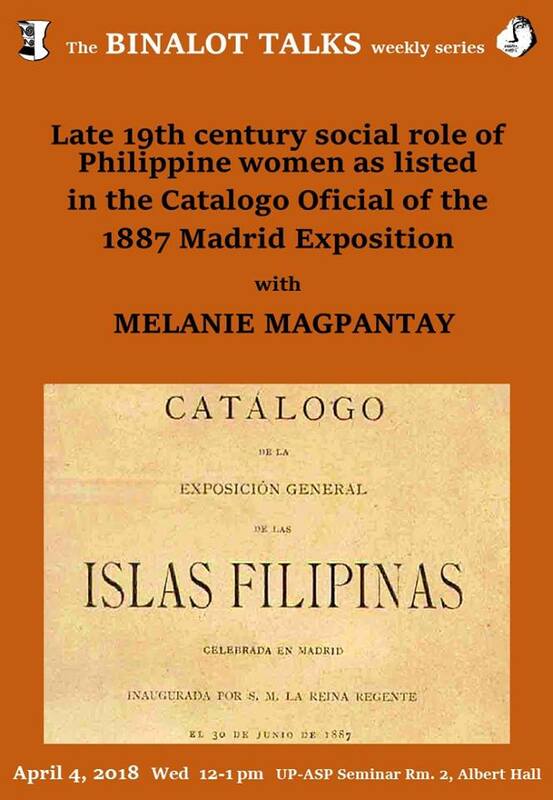 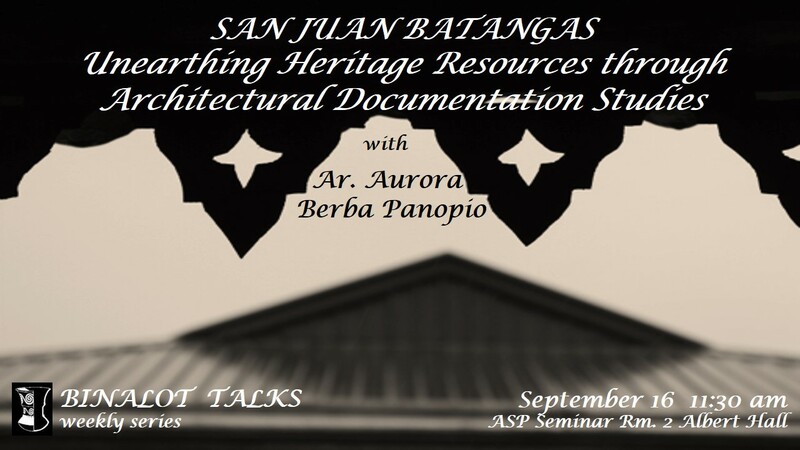 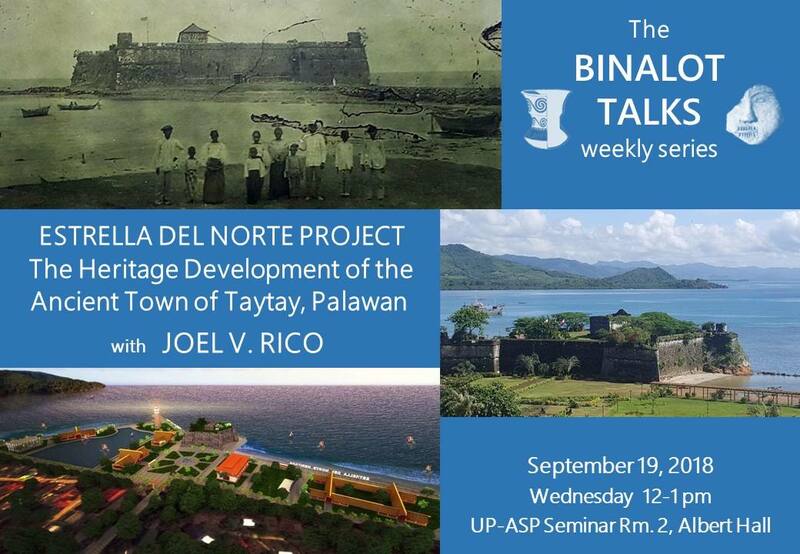 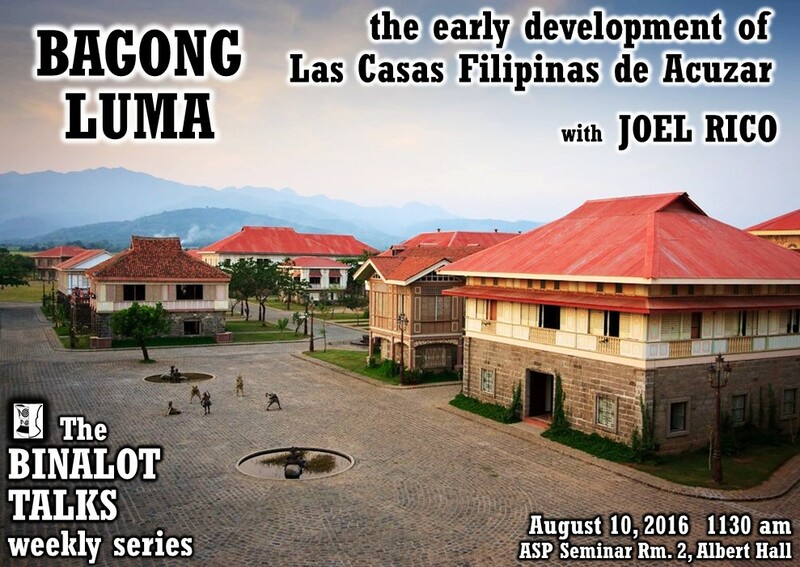 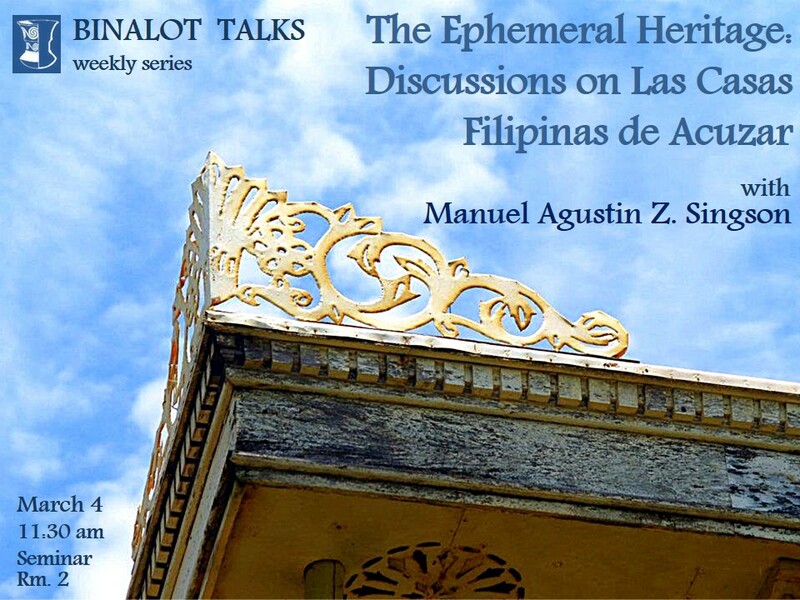 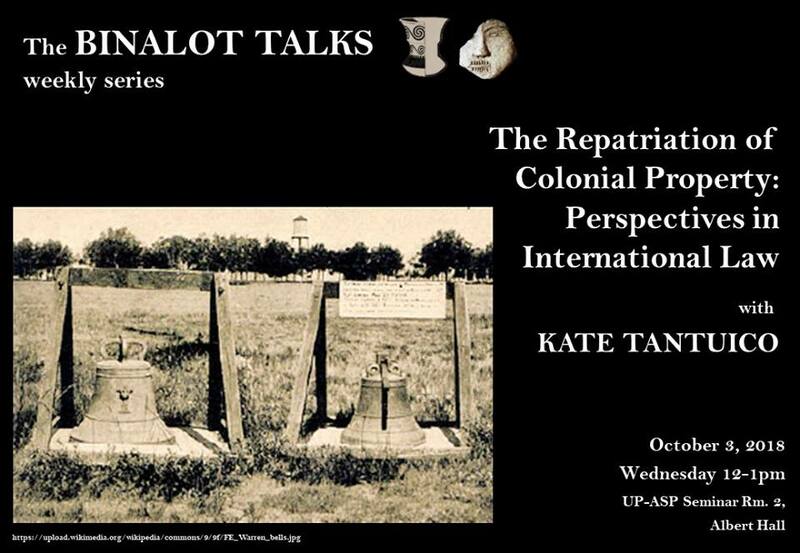 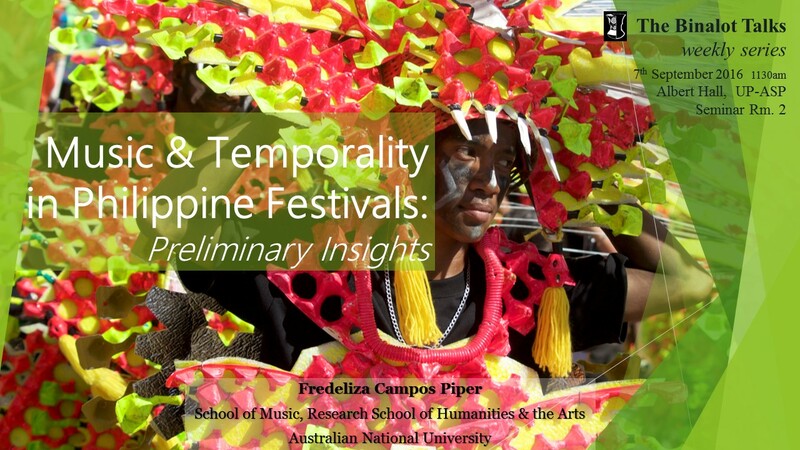 The Ephemeral Heritage: Discussions on Las Casas Filipinas de Acuzar. 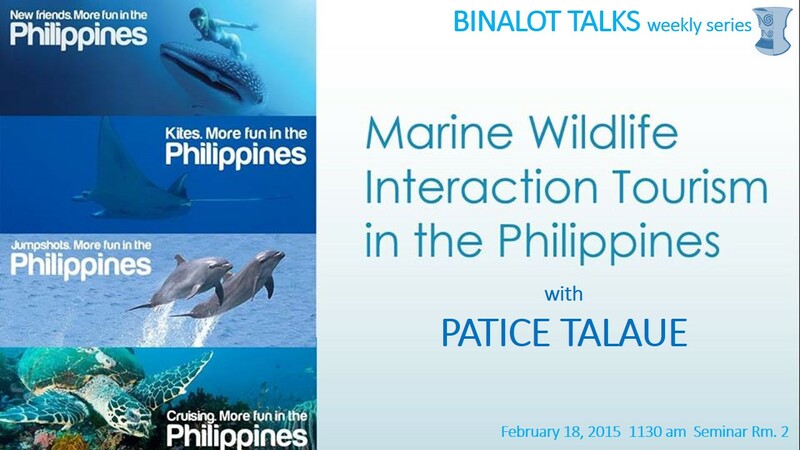 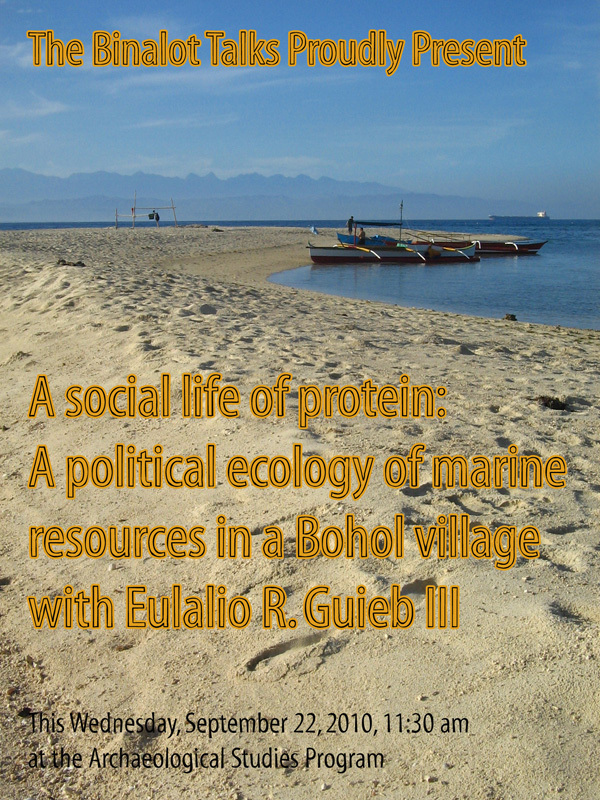 Marine Wildlife Interaction Tourism In The Philippines. 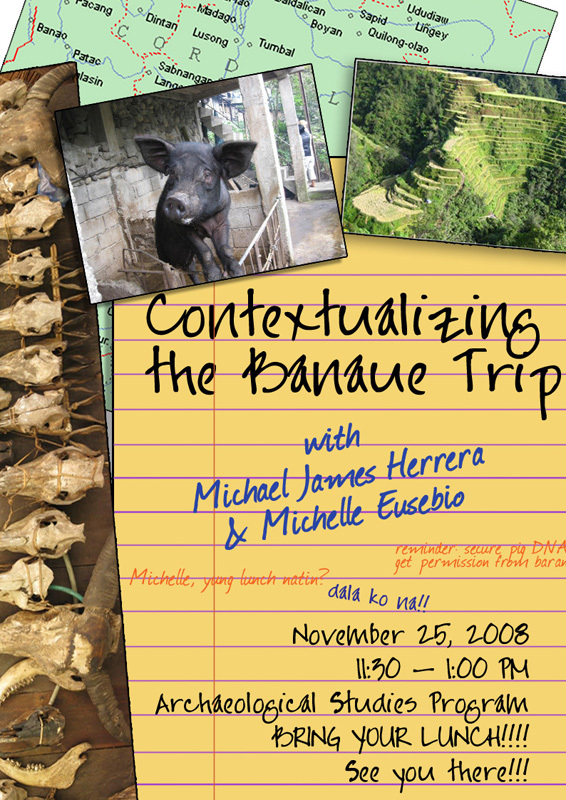 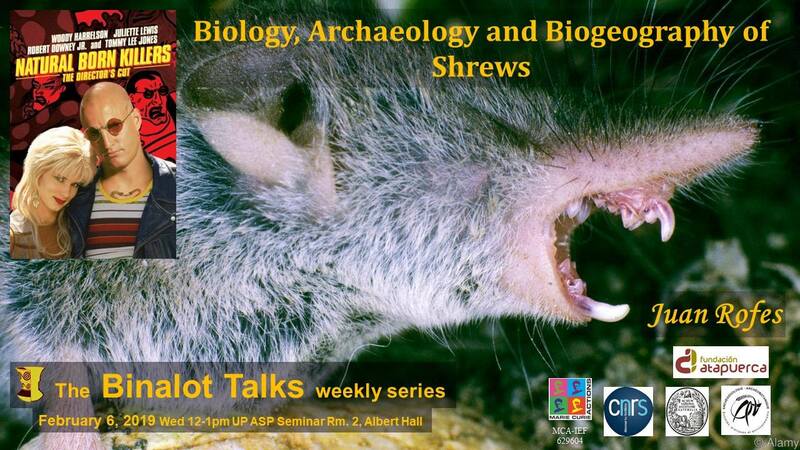 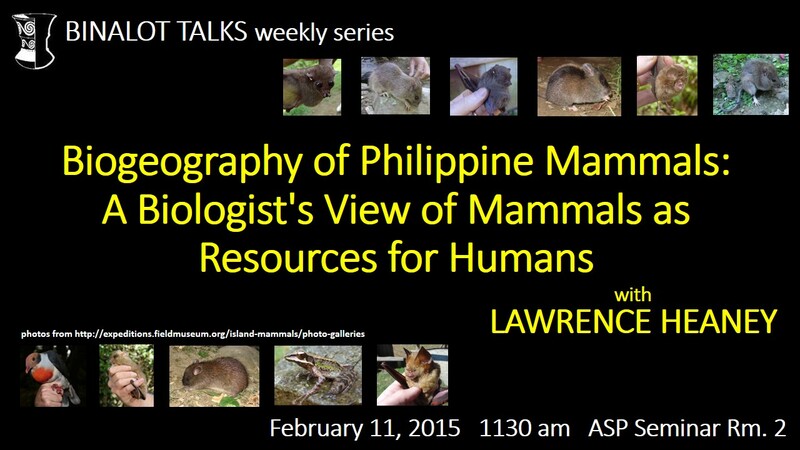 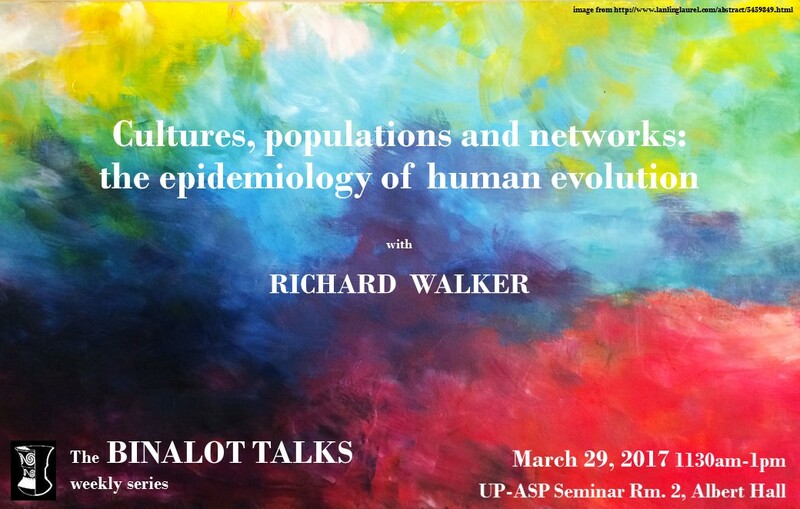 Biogeography of Philippine Mammals: A Biologist's View of Mammals as Resources for Humans. 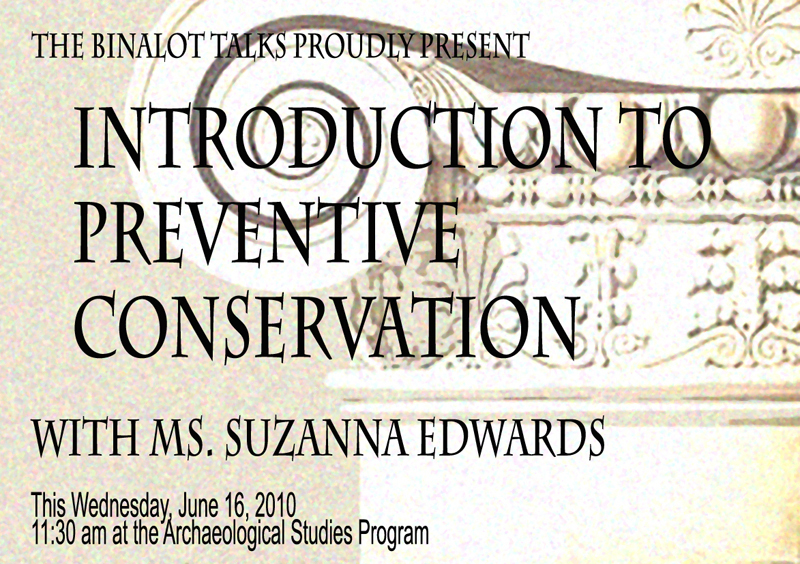 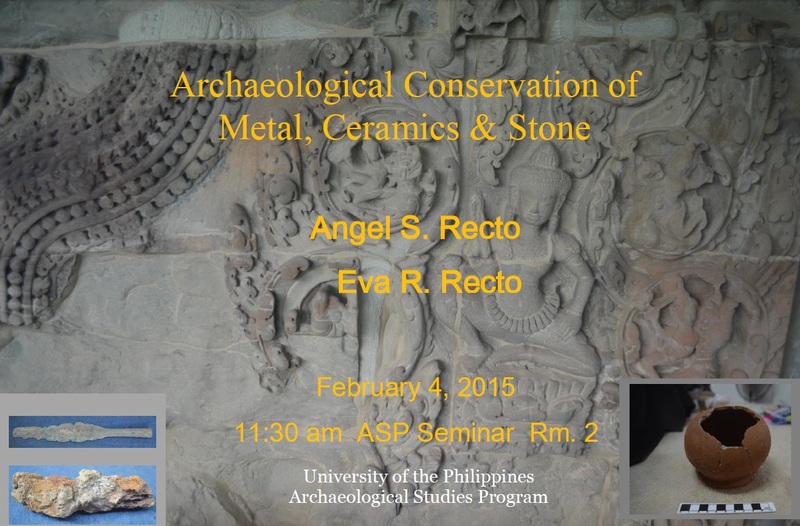 Archaeological Conservation of Metal, Ceramics & Stone. 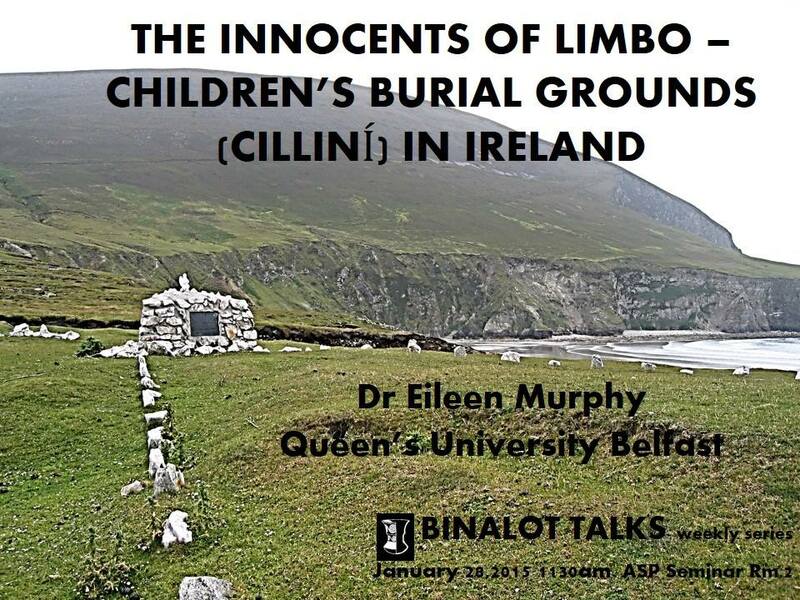 The Innocents of Limbo-Children's Burial in Cilliní, Ireland. 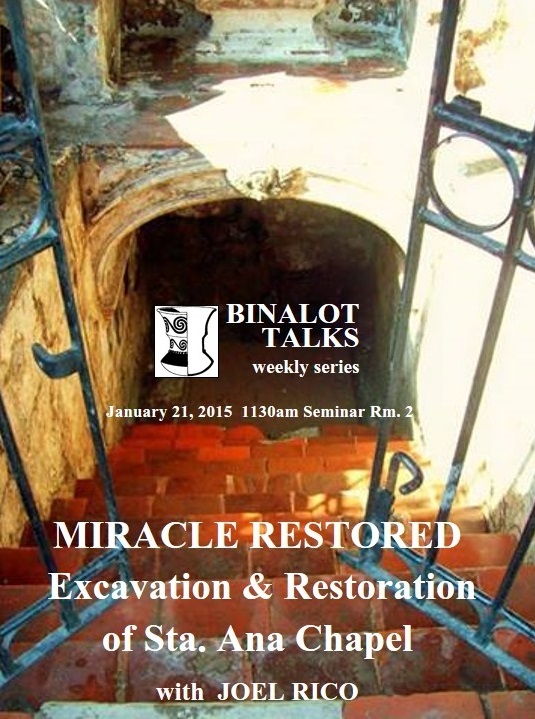 Miracle Restored: Excavation and Restoration of Sta. 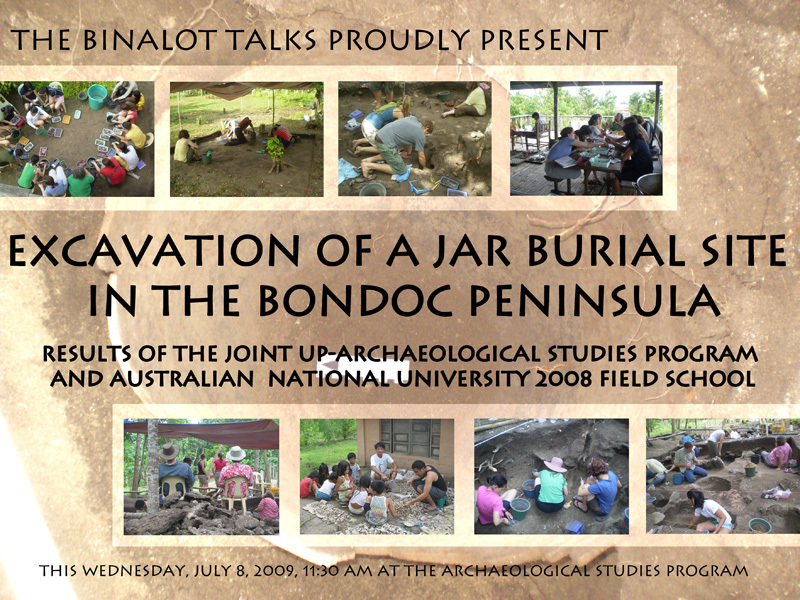 Ana Chapel. 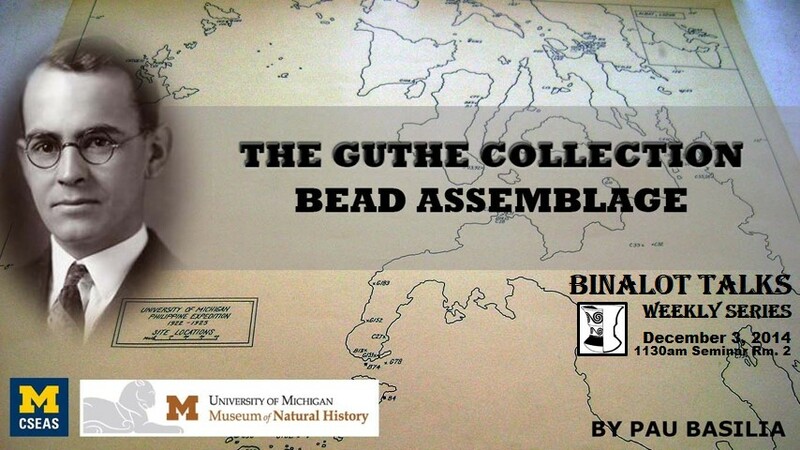 The Guthe Collection: Bead Assemblage. 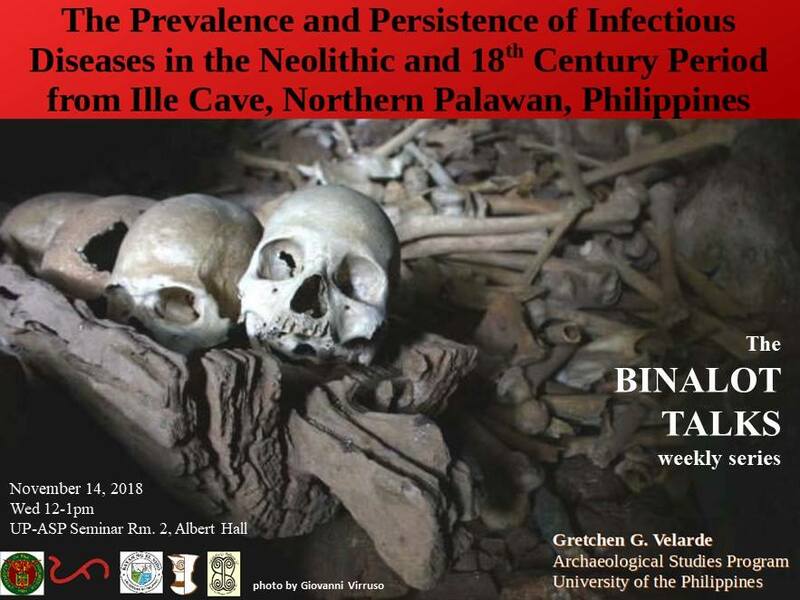 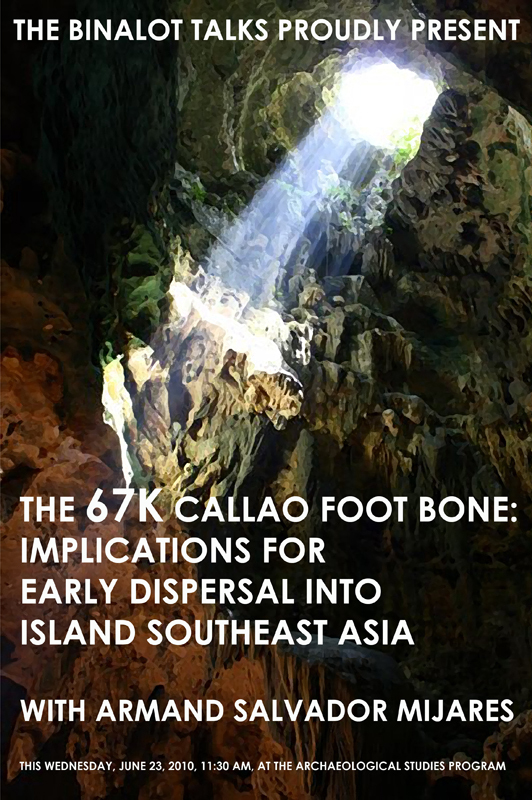 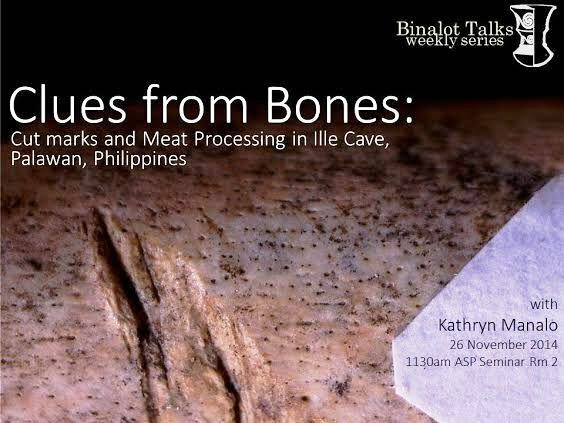 Clues from Bones: Cut Marks and Meat Processing in Ille Cave, Palawan, Philippines. 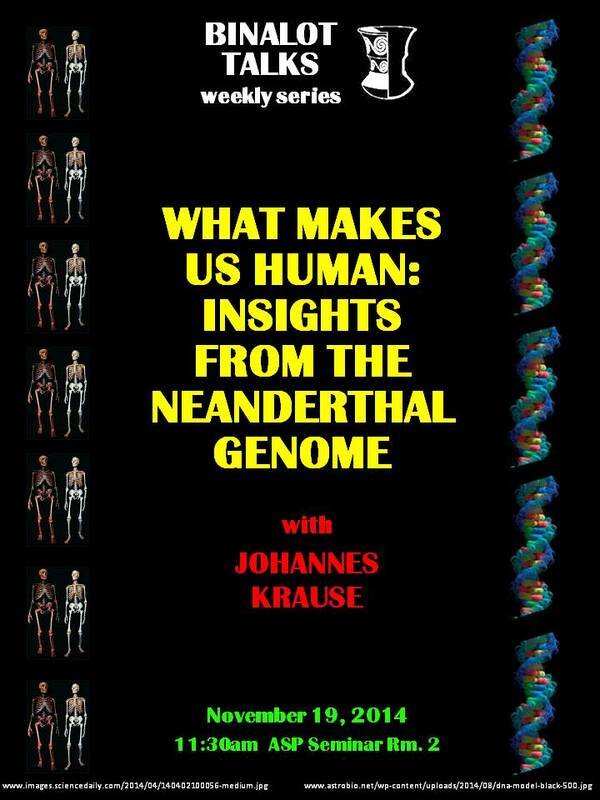 What Makes Us Human: Insights from the Neanderthal Genome. 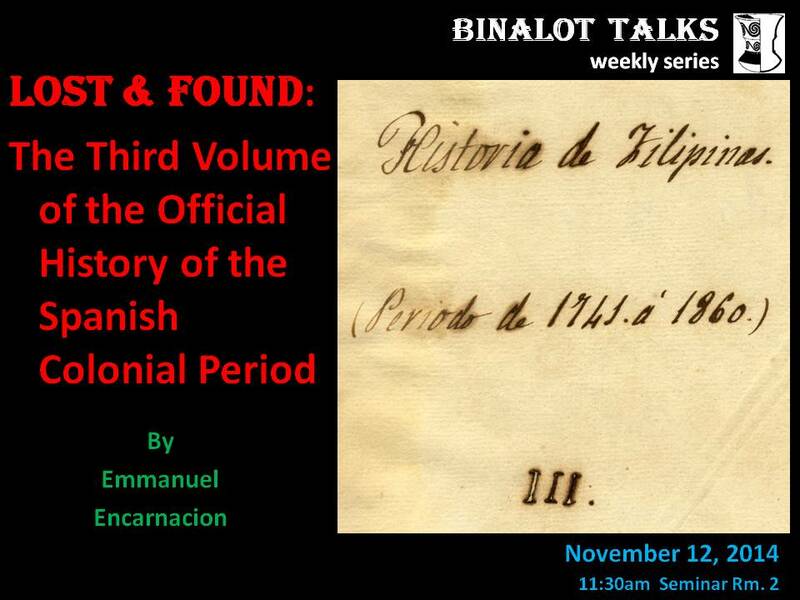 Lost and Found: The Third Volume of the Official History of the Spanish Colonial Period. 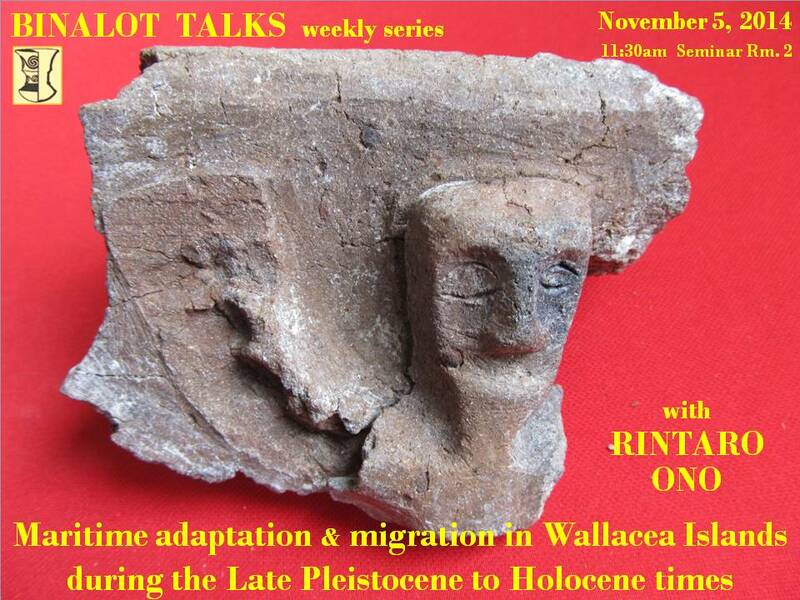 Maritime Adaptation & Migration in Wallacea Islands during the Late Pleistocene to Holocene Times. 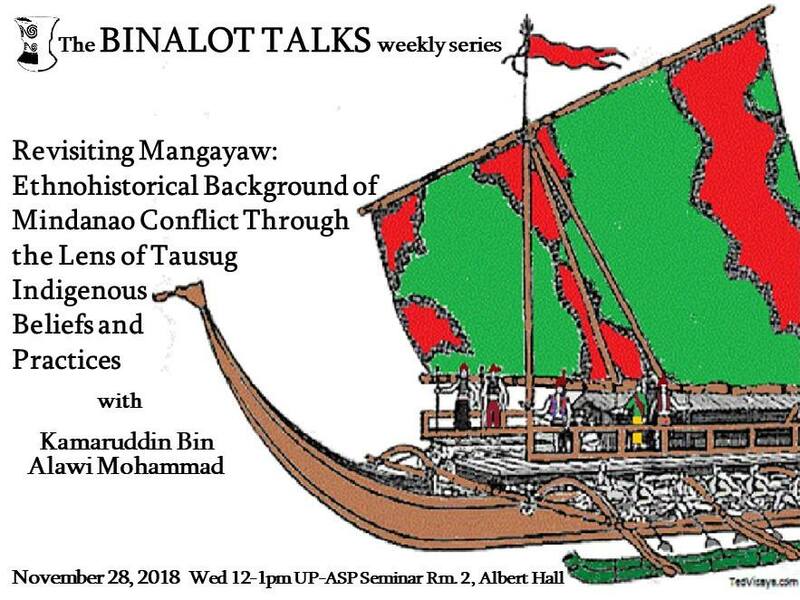 Suyam Tu Agusan Manobo: Tradisyon At Inobasyon Sa Sining Ng Pagbuburda Ng Damit. 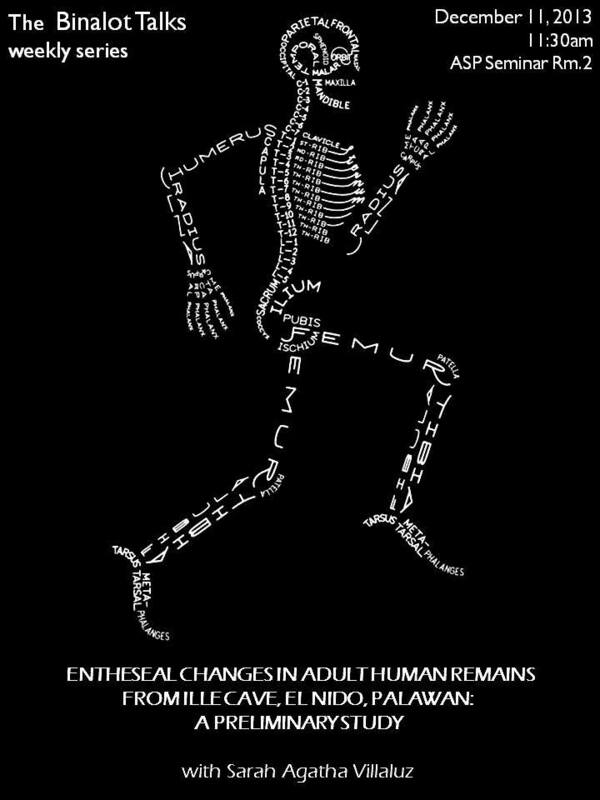 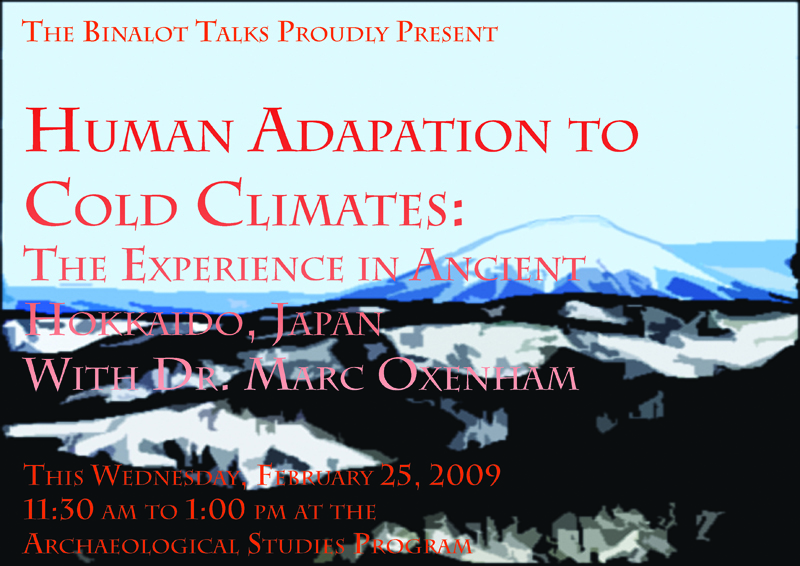 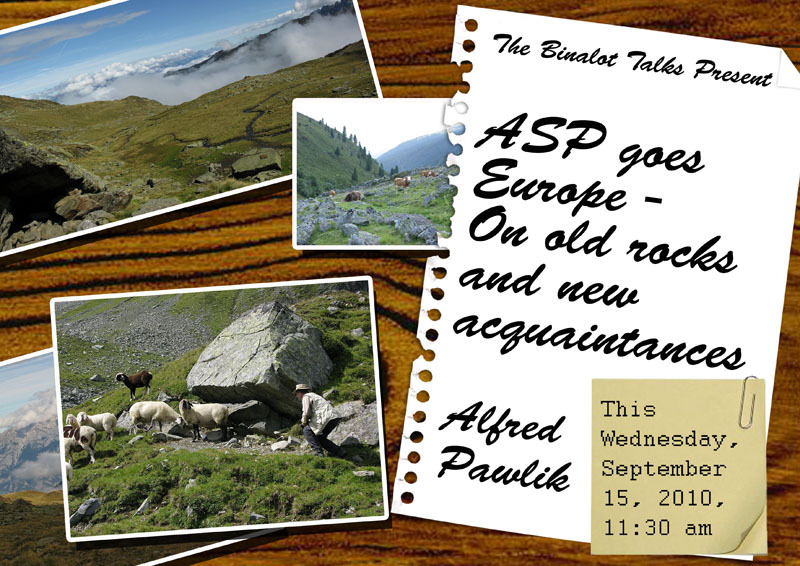 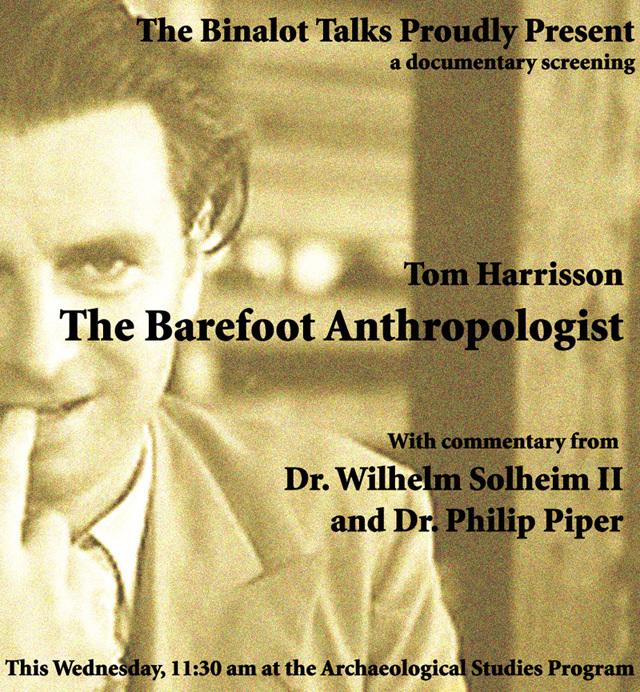 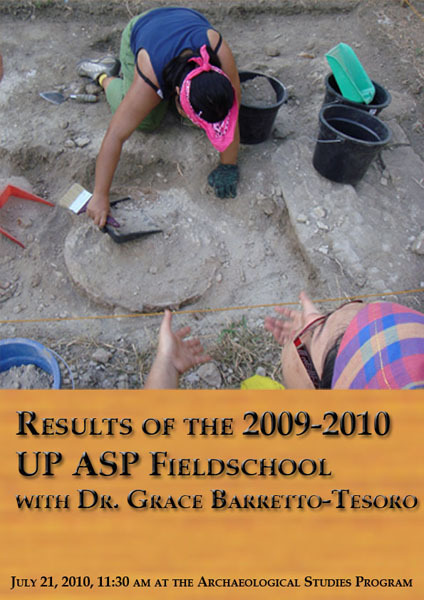 The Anthropecene: An Archaeological View on How Humans Transform the Enviroment. 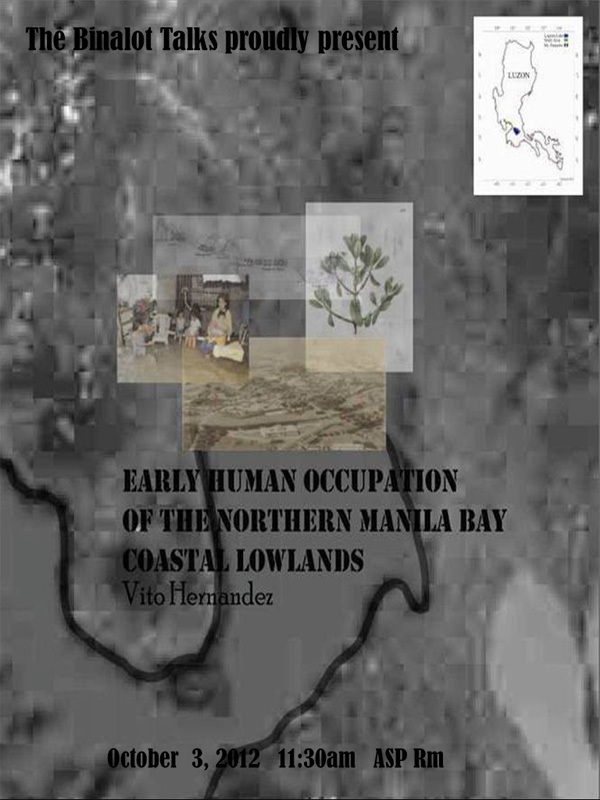 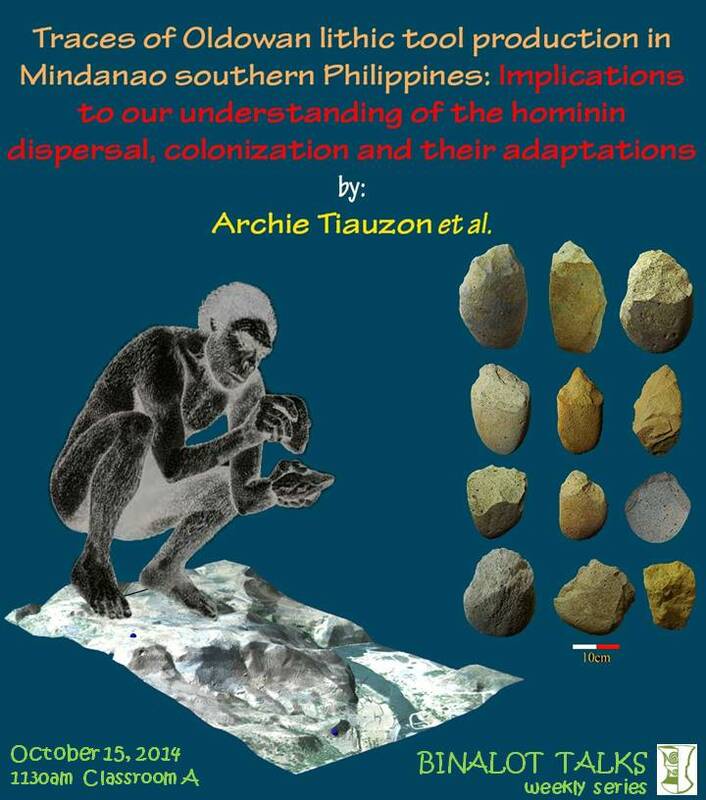 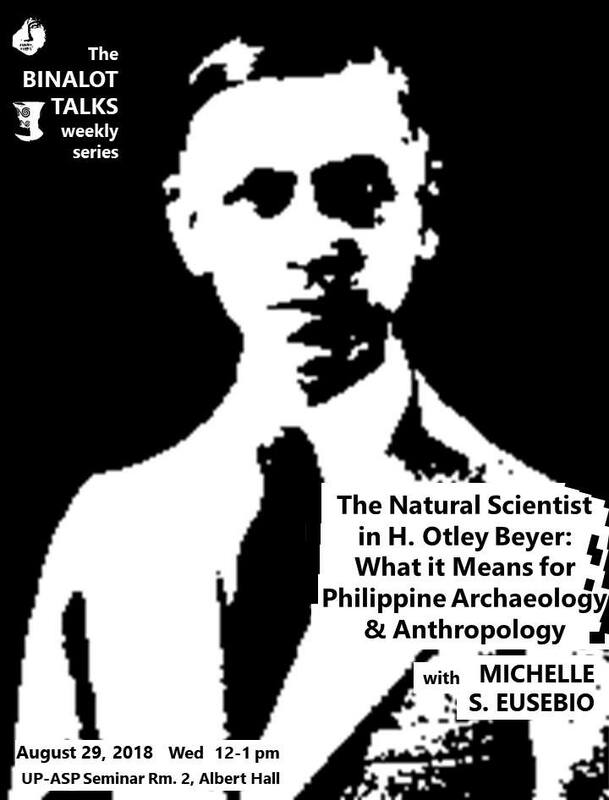 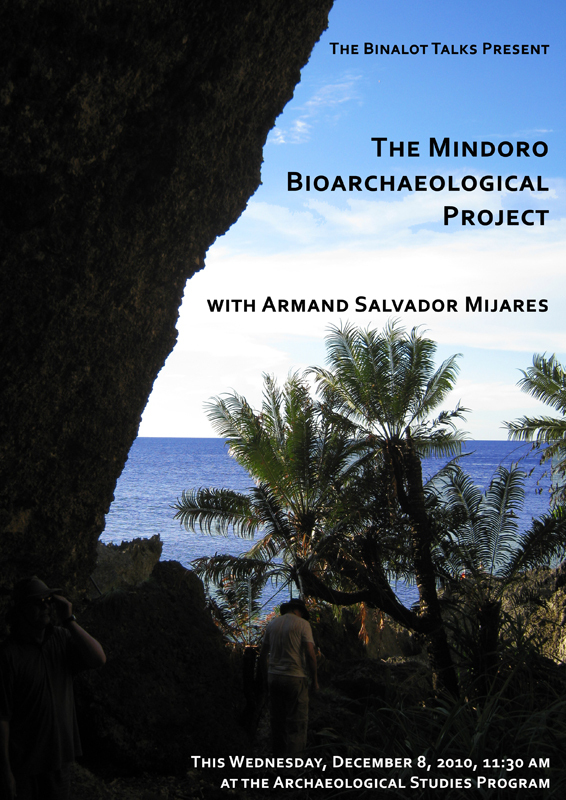 Traces of Oldowan Lithic Production in Mindanao, Southern Philippines: Implications to Our Understanding of the Hominin Disperal, Colonization and their Adaptations. 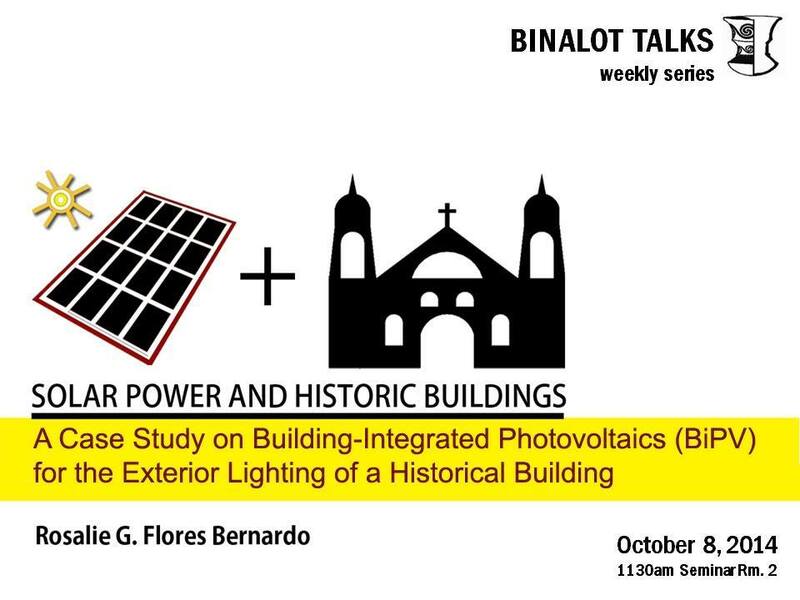 Solar Power and Historic Buildings: A Case Study on Building-Intergrated Photovoltaics (BiPV) for the Exterior Lighting of a Historical Building. 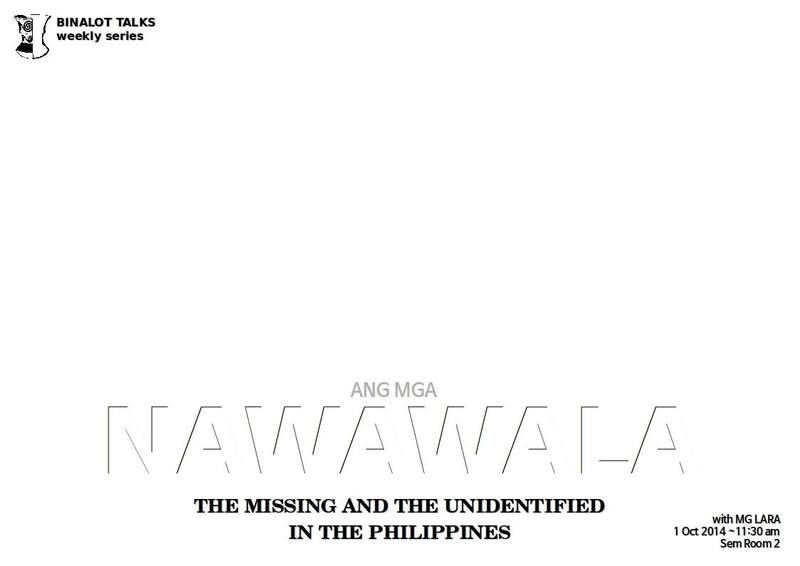 Ang Mga Nawawala: The Missing and the Unidentified in the Philippines. 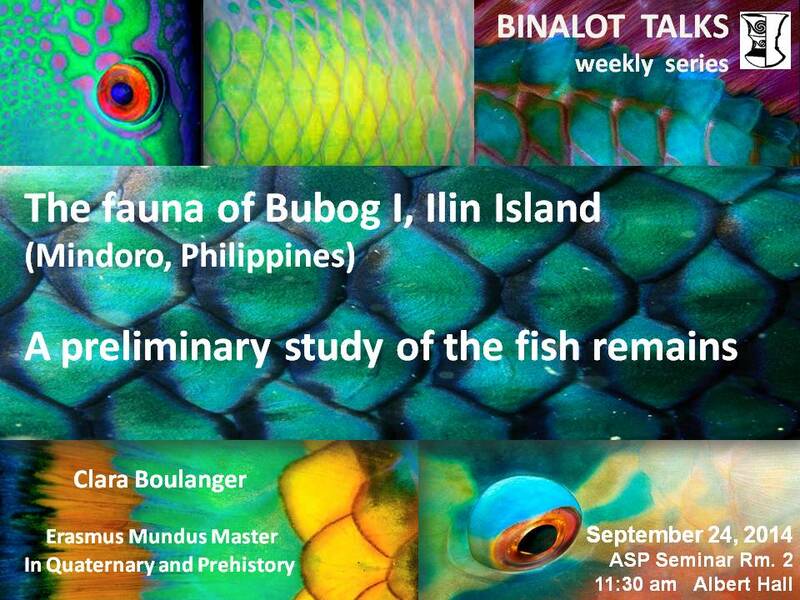 The fauna of Bubog I, Ilin Island (Mindoro, Philippines) A preliminary study of the fish remains. 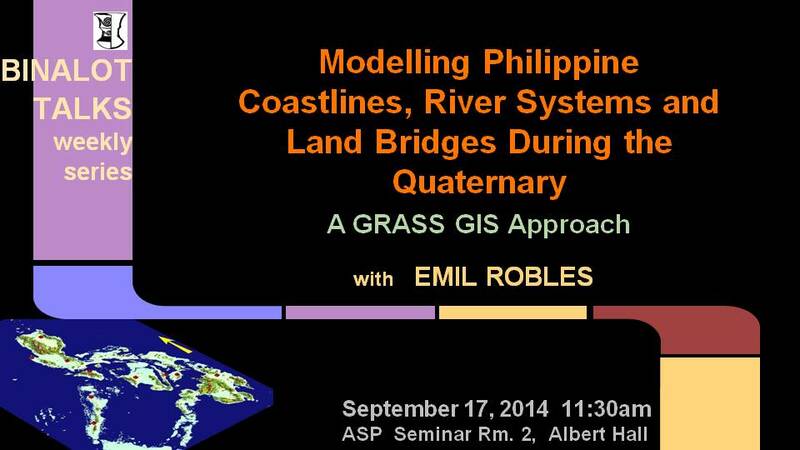 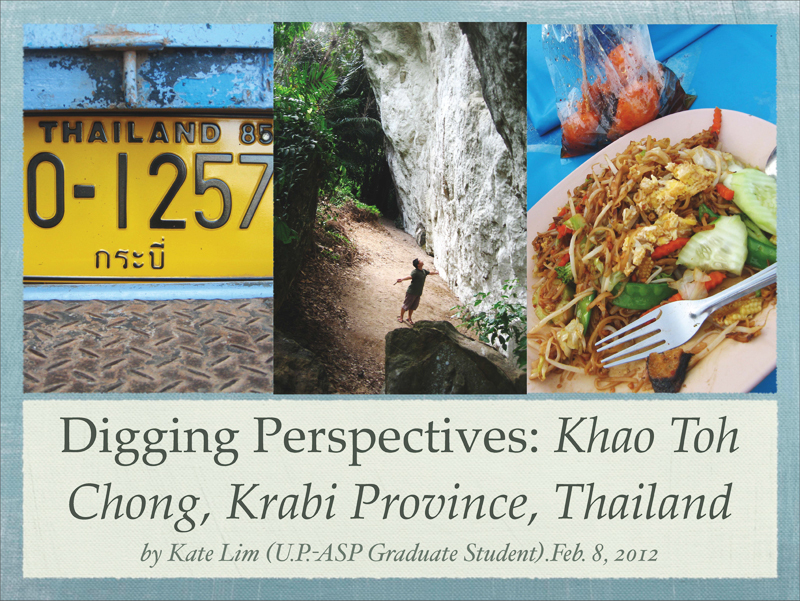 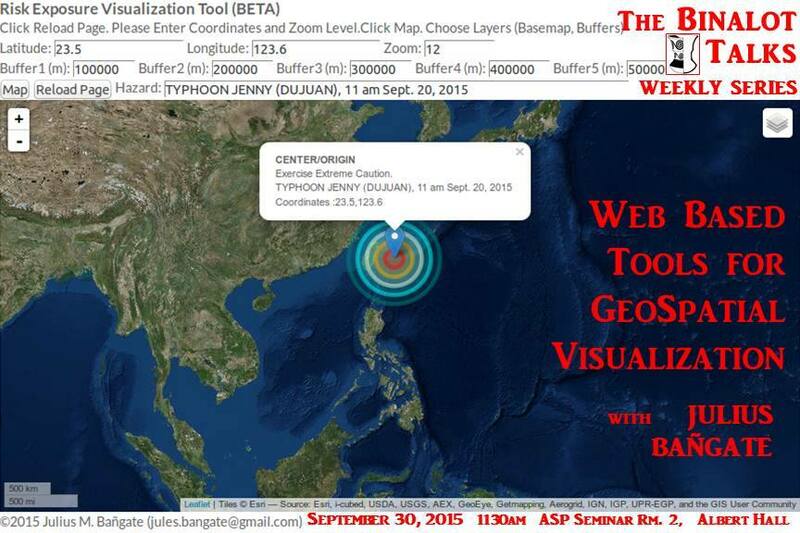 Modelling Philippines Coastlines, River Systems and Land Bridges During the Quaternary: A Grass GIS Approach. 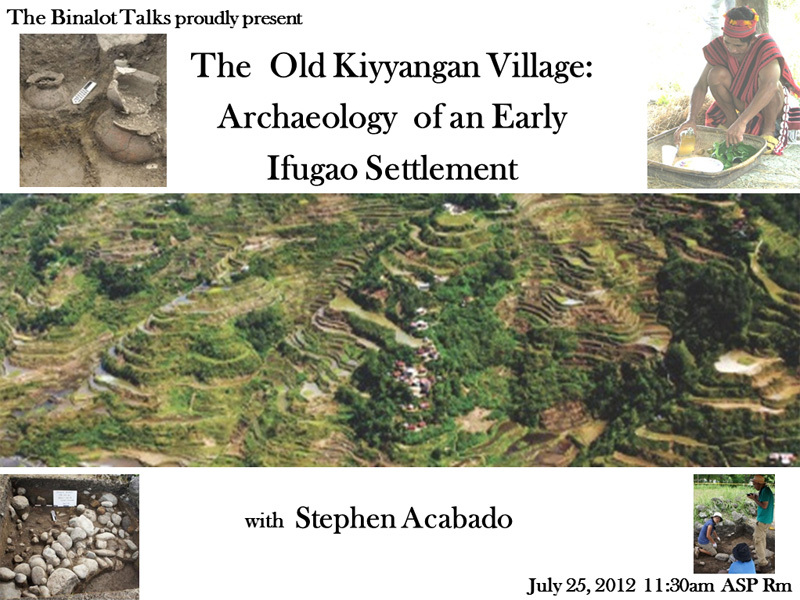 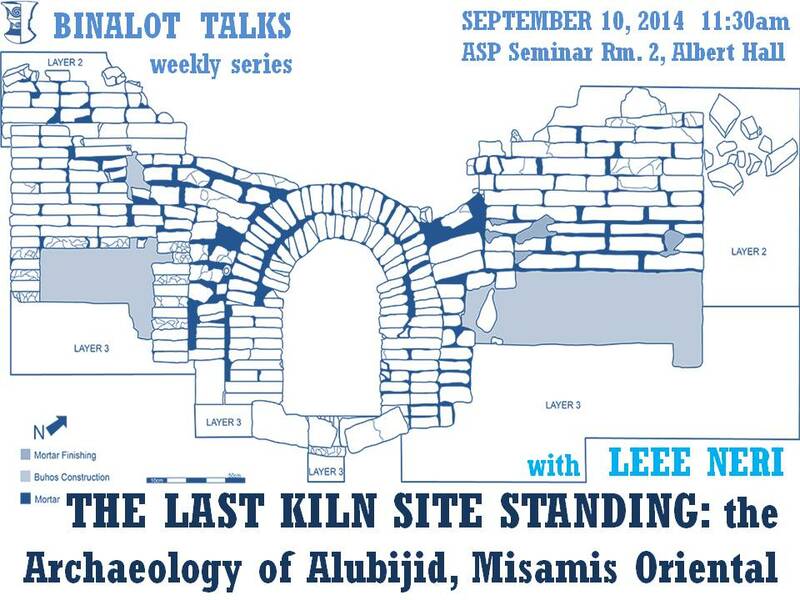 The Last Kiln Site Standing: the Archaeology of Alubijid, Misamis Oriental. 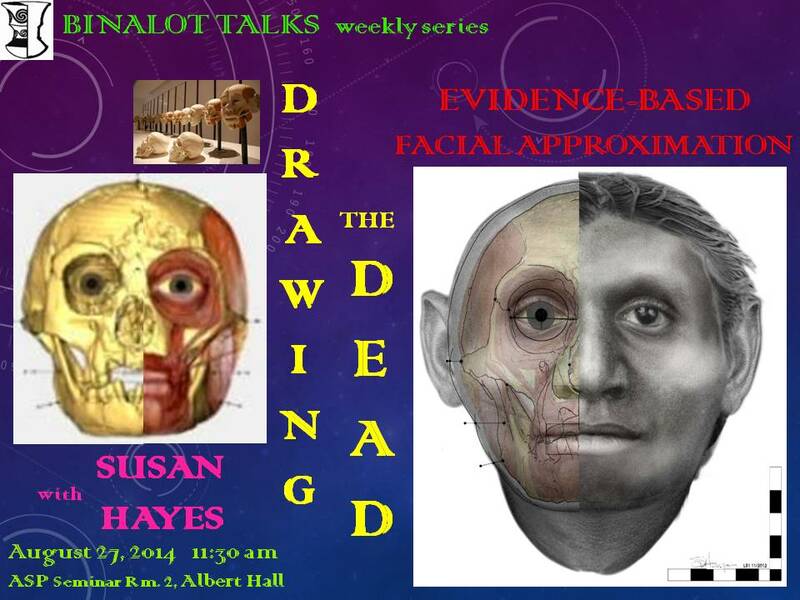 Drawing the Dead: Evidence-Based Facial Approximation. 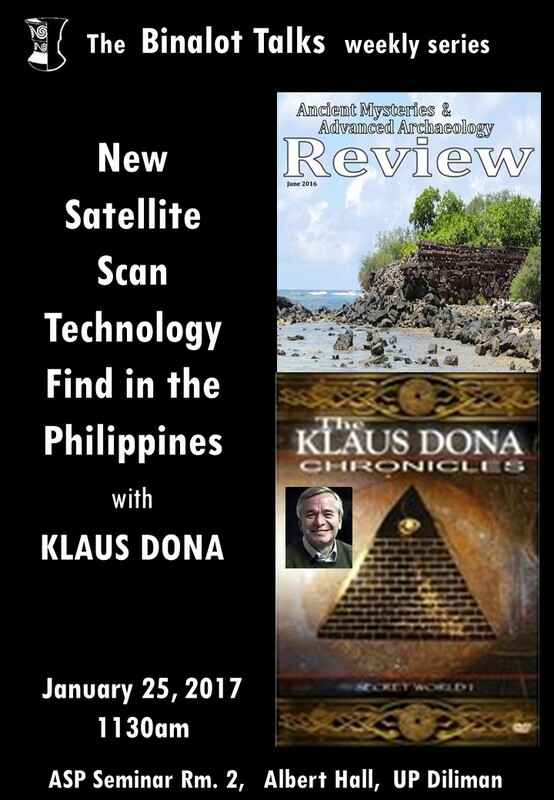 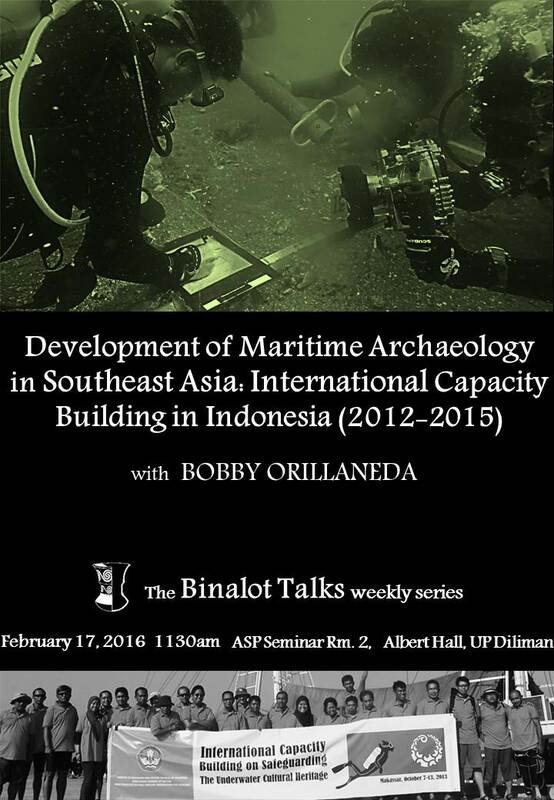 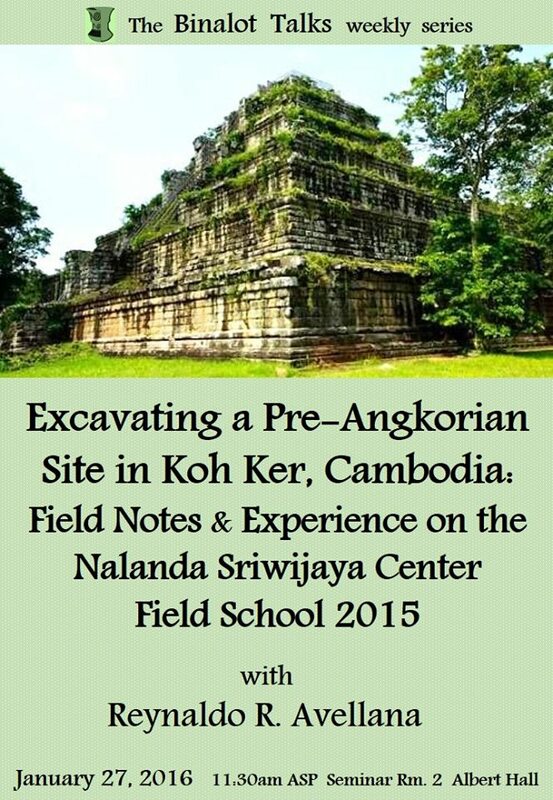 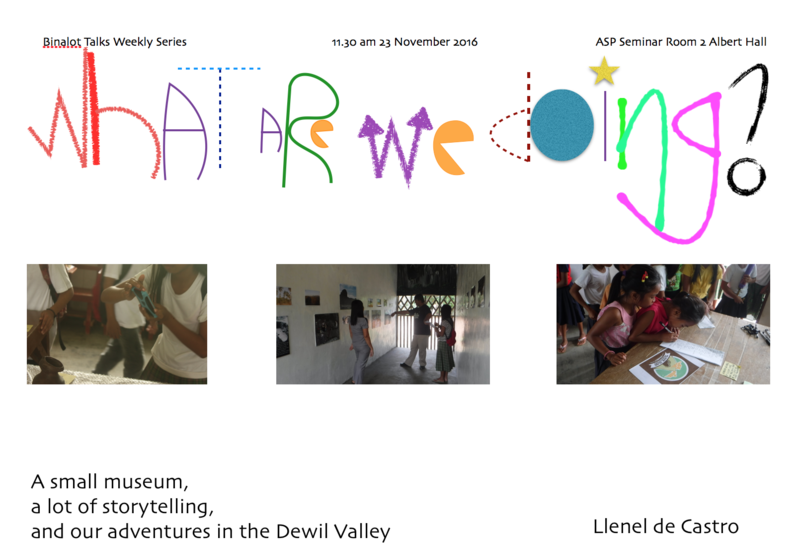 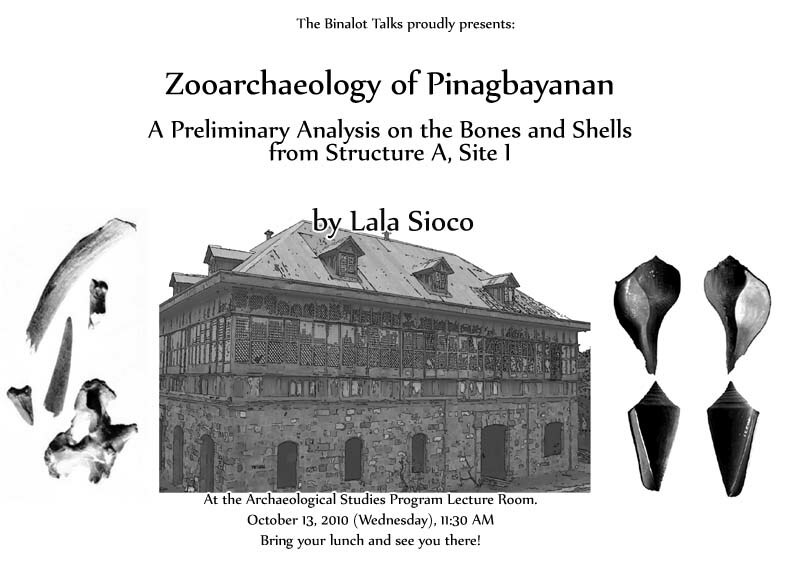 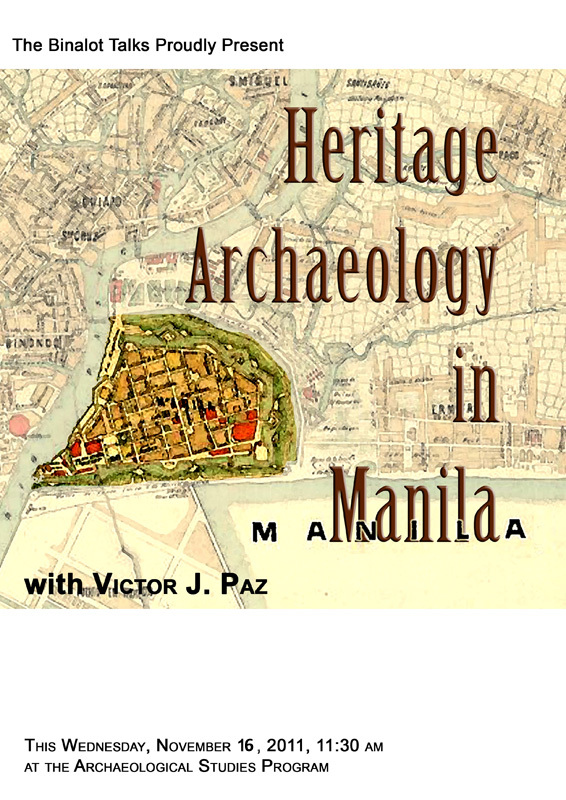 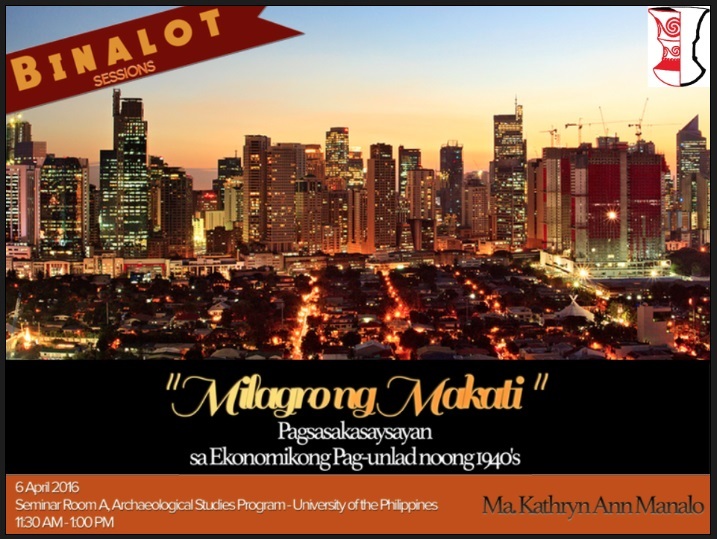 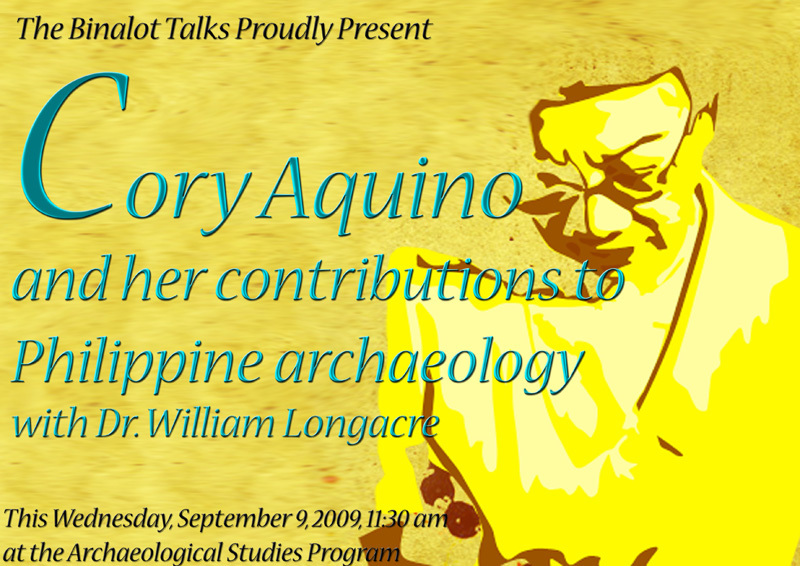 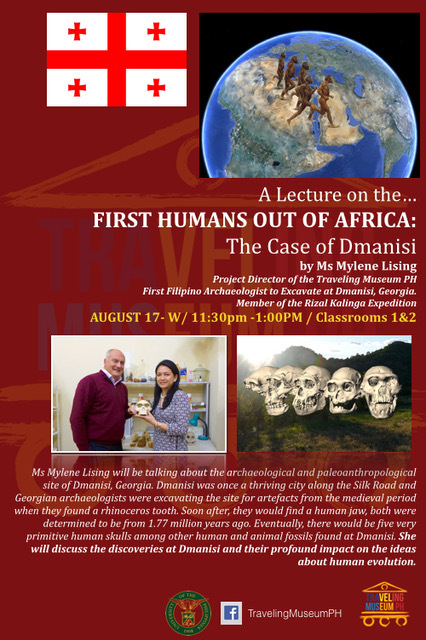 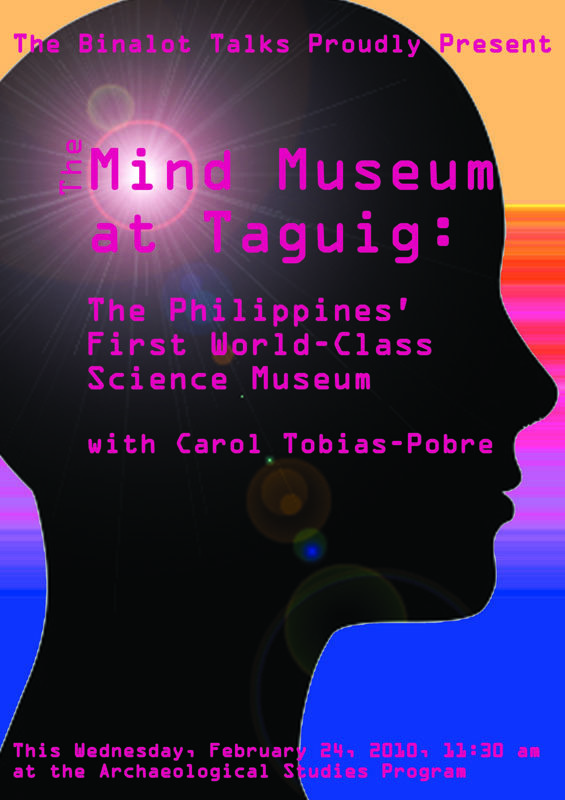 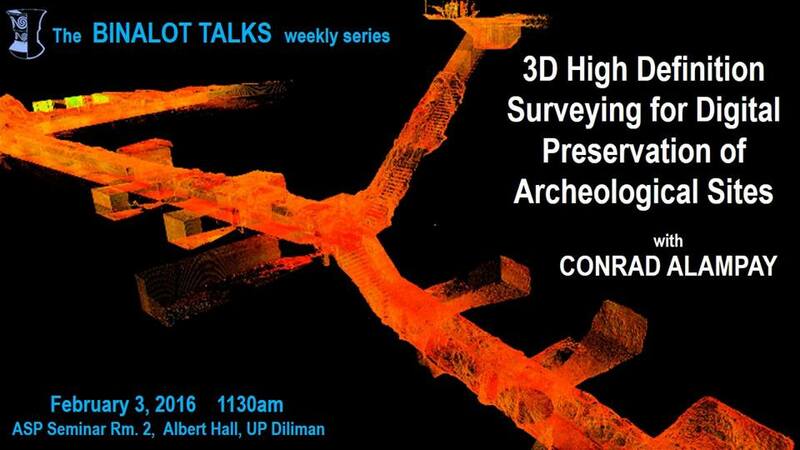 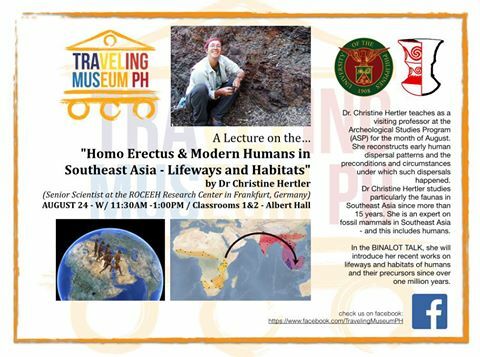 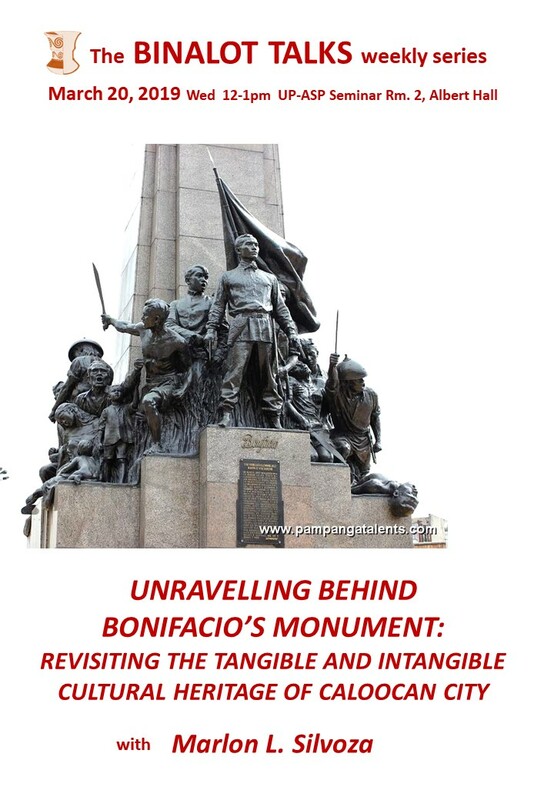 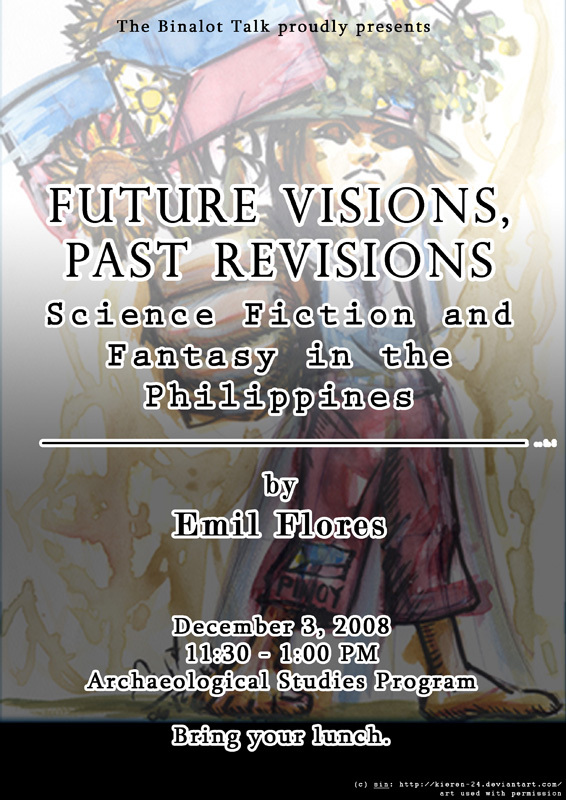 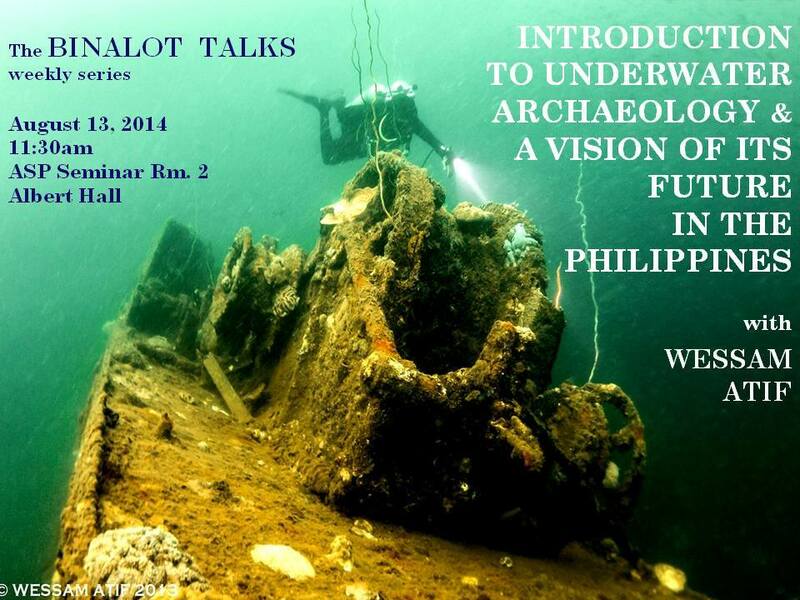 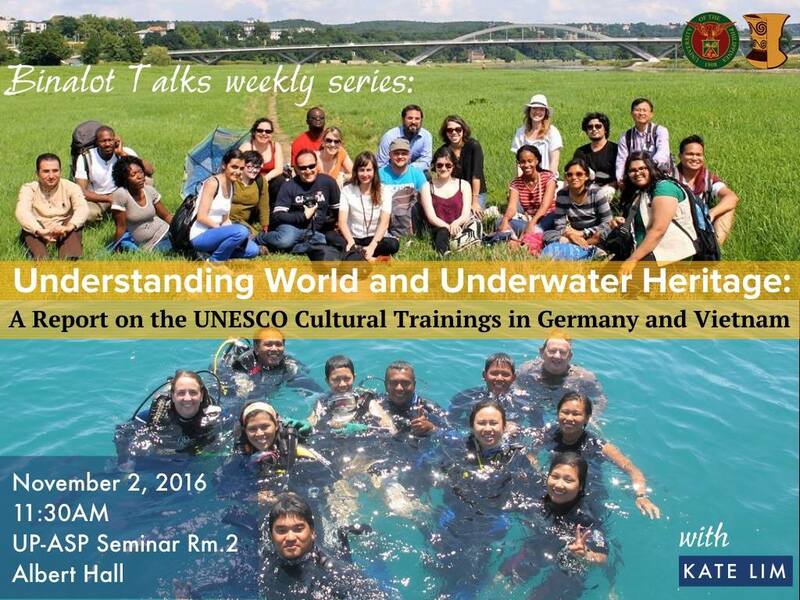 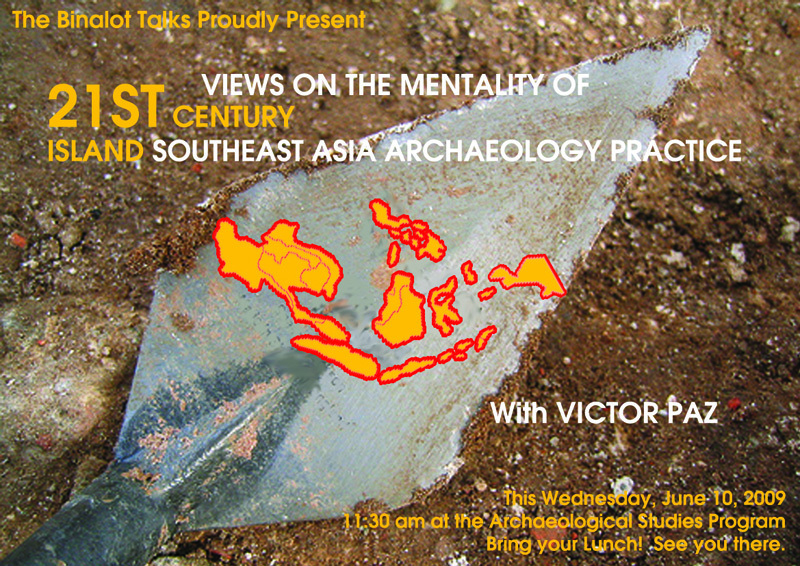 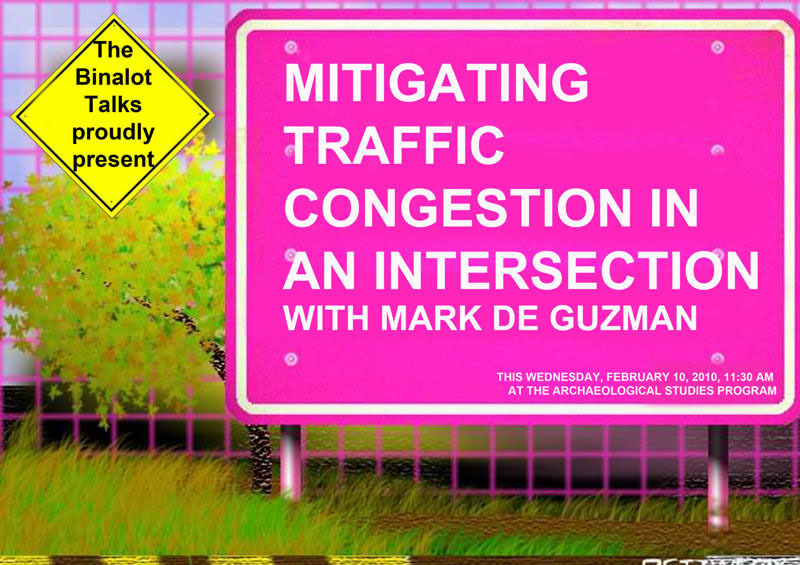 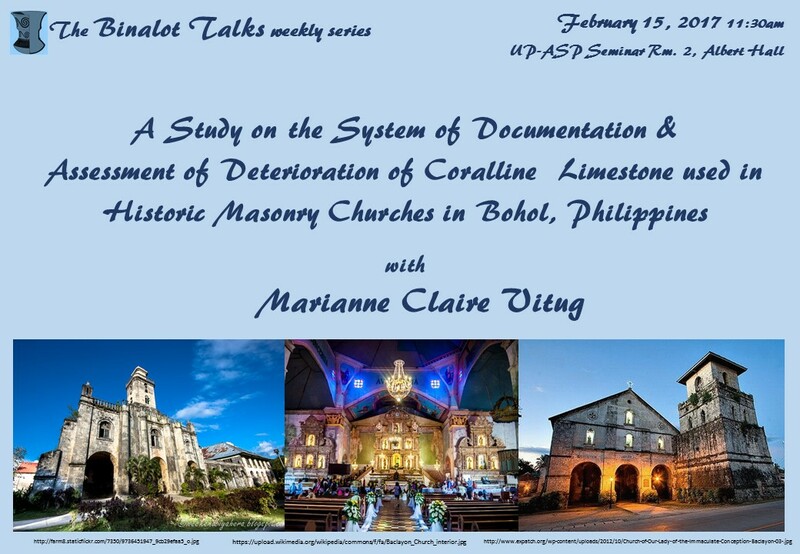 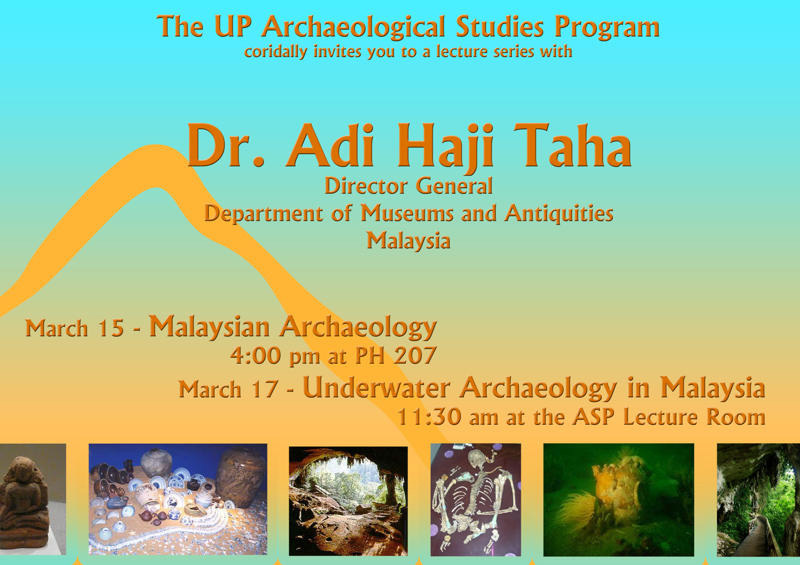 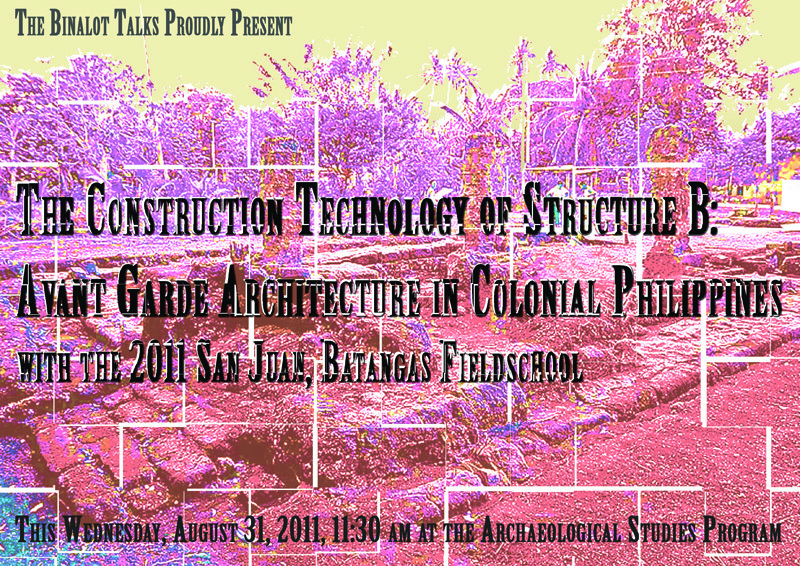 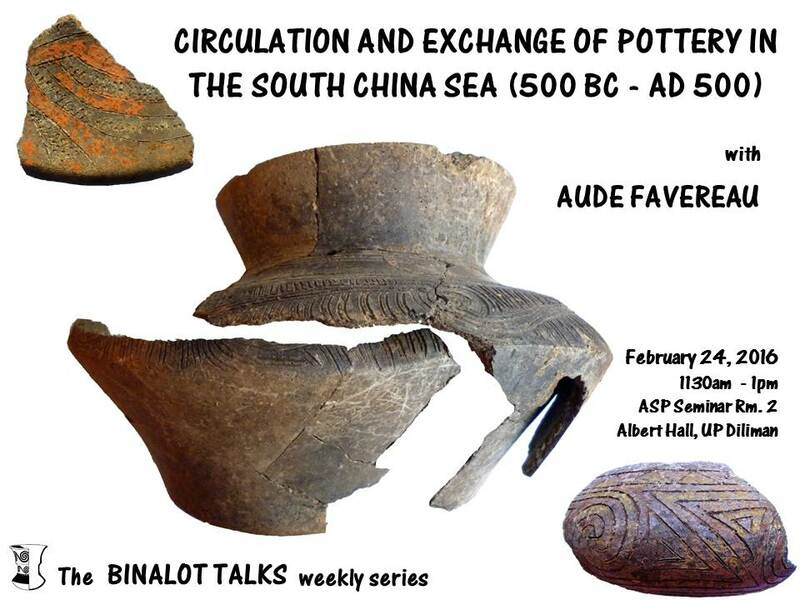 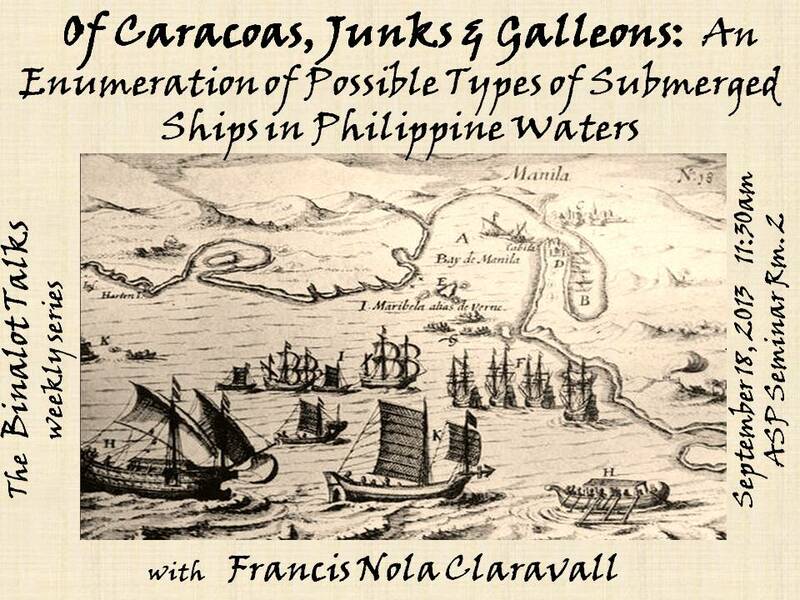 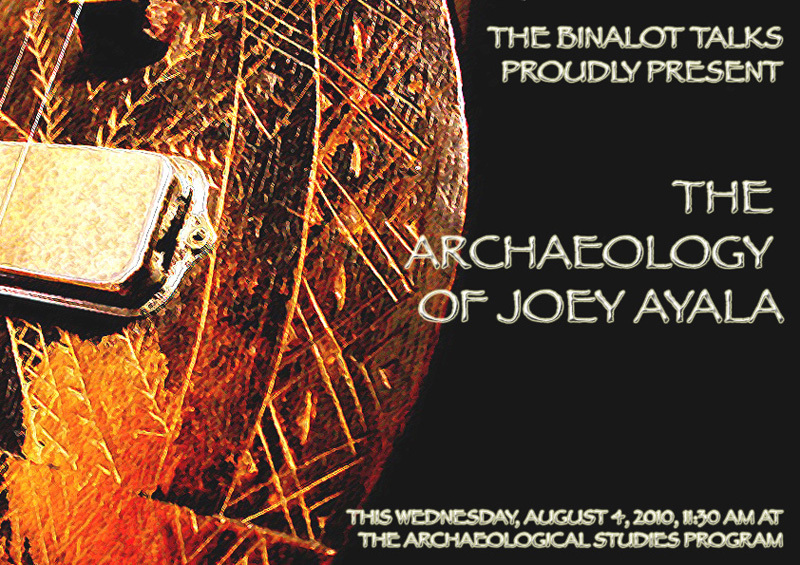 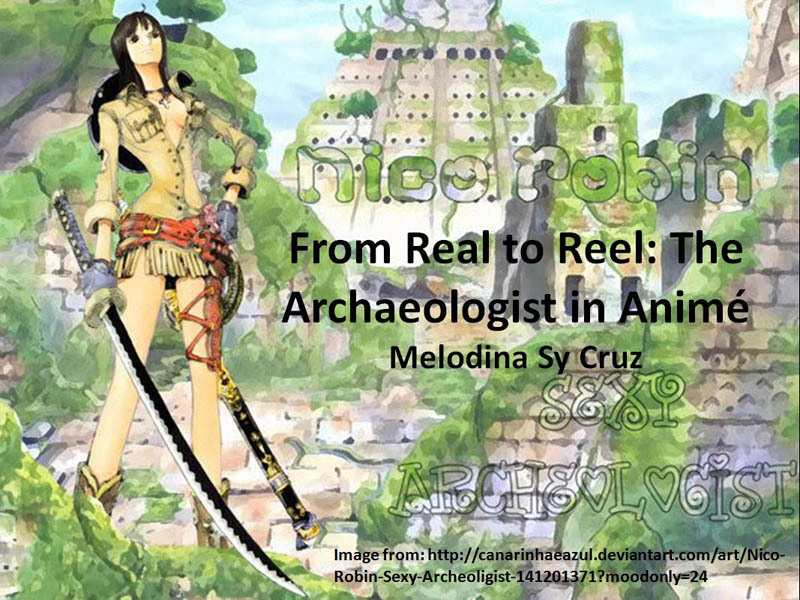 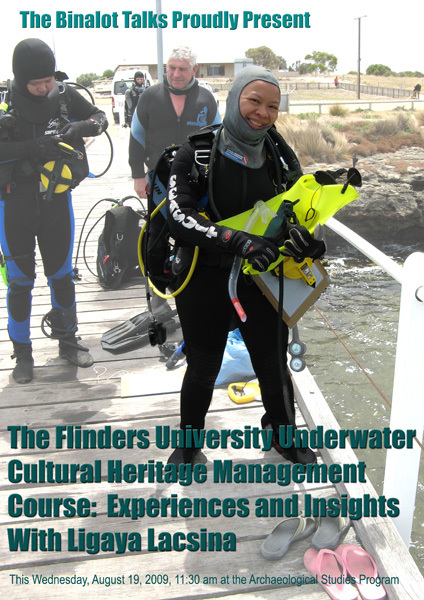 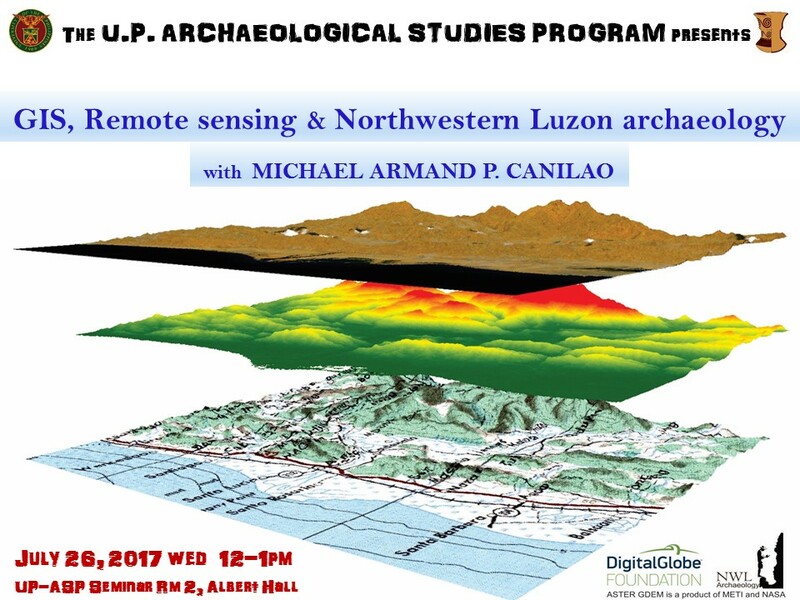 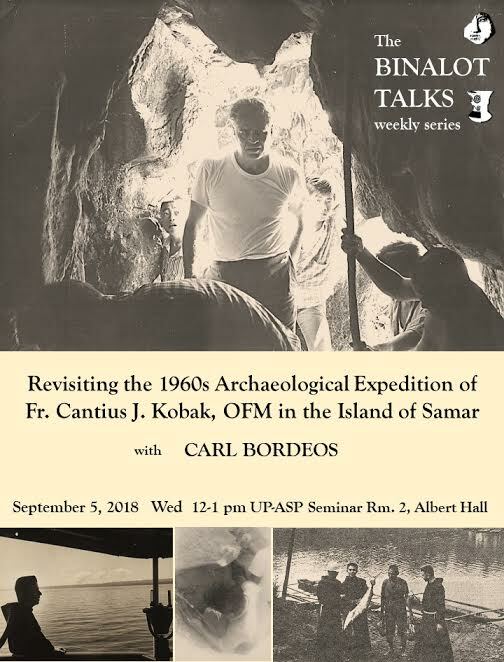 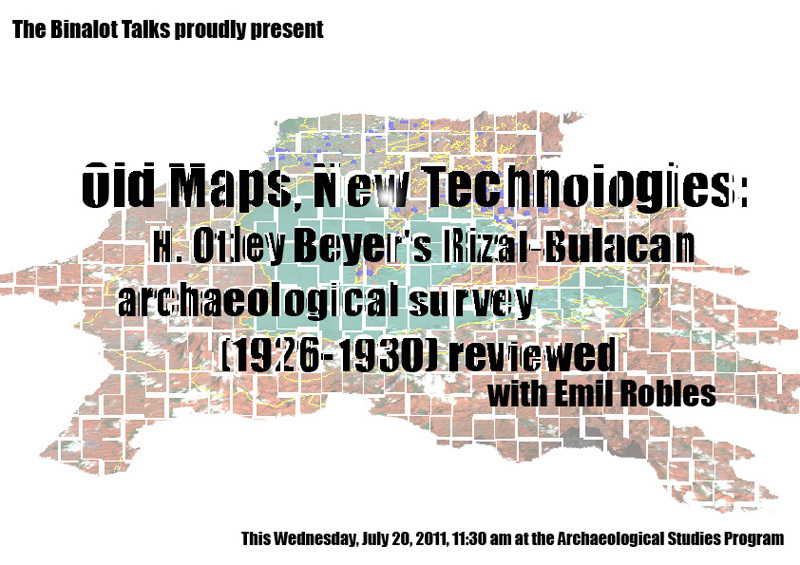 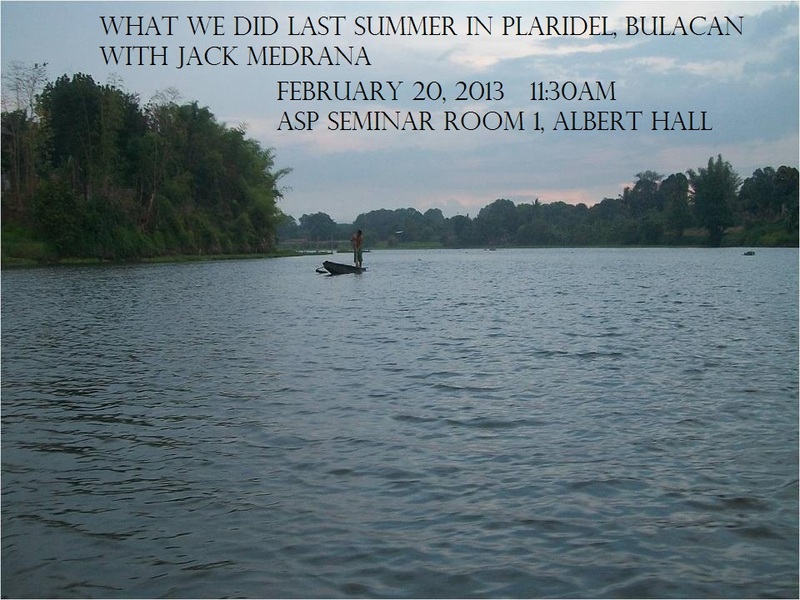 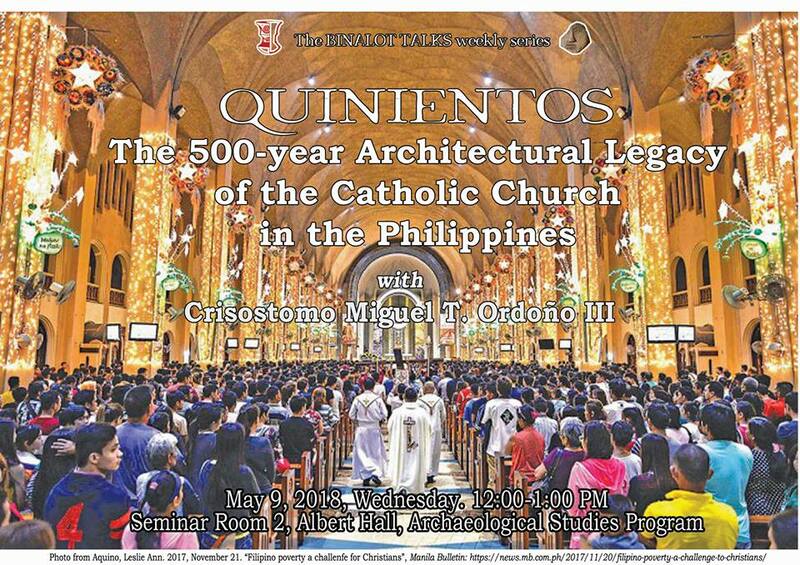 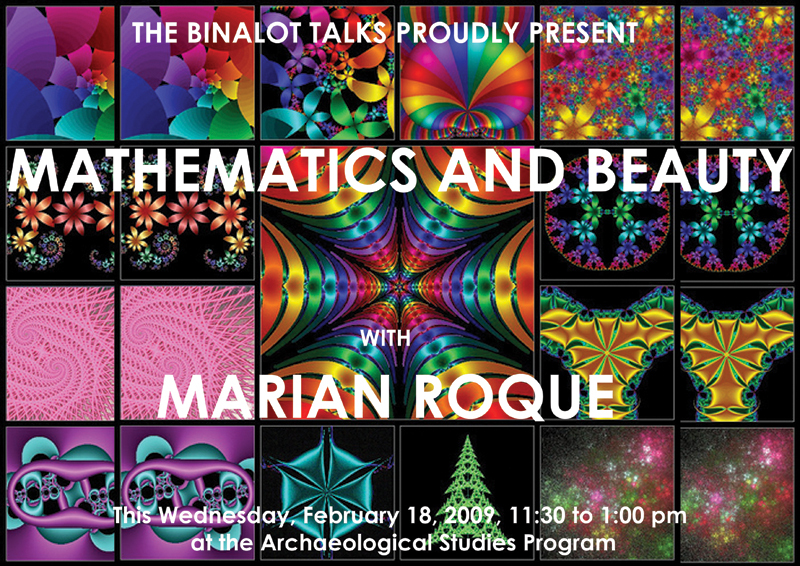 Introduction to underwater Archaeology & a vision of its future in the Philippines. 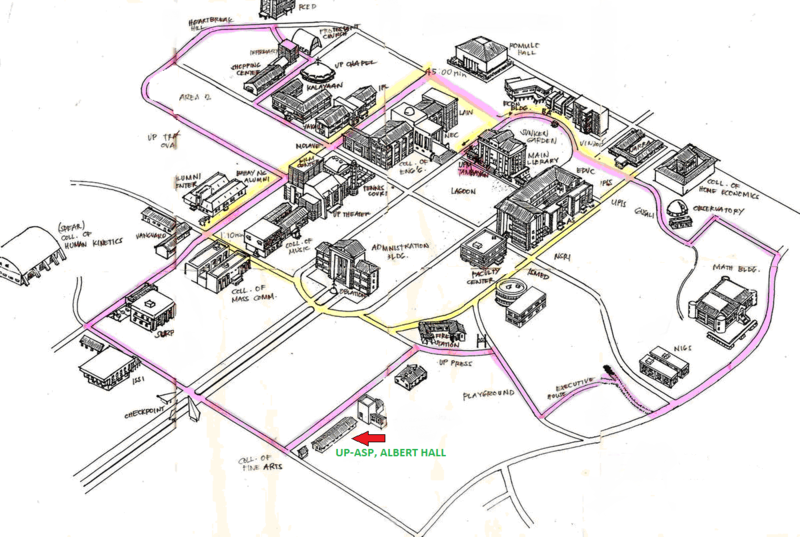 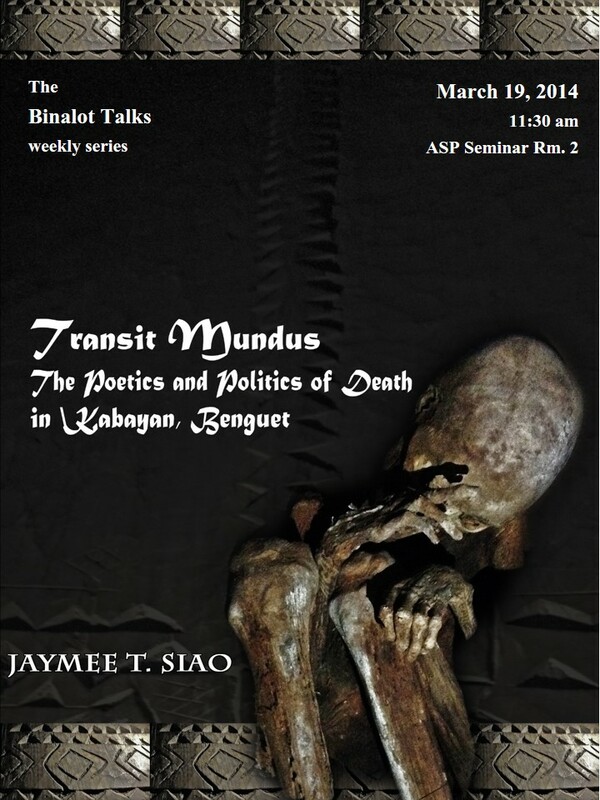 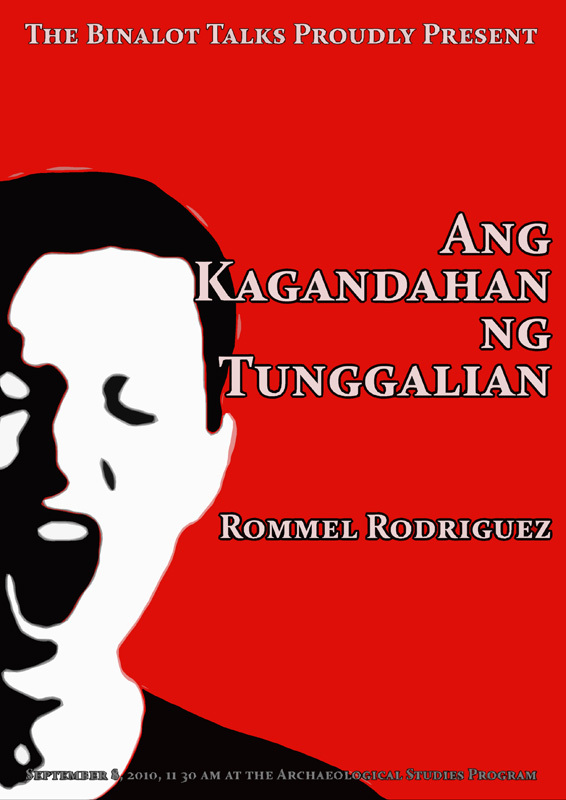 Transit Mundus: The Poetics and Politics of Death in Kabayan, Benguet. 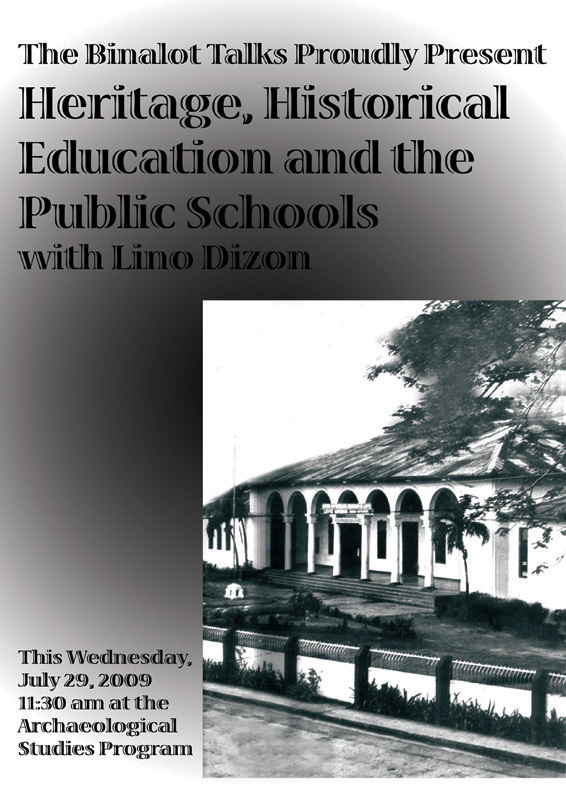 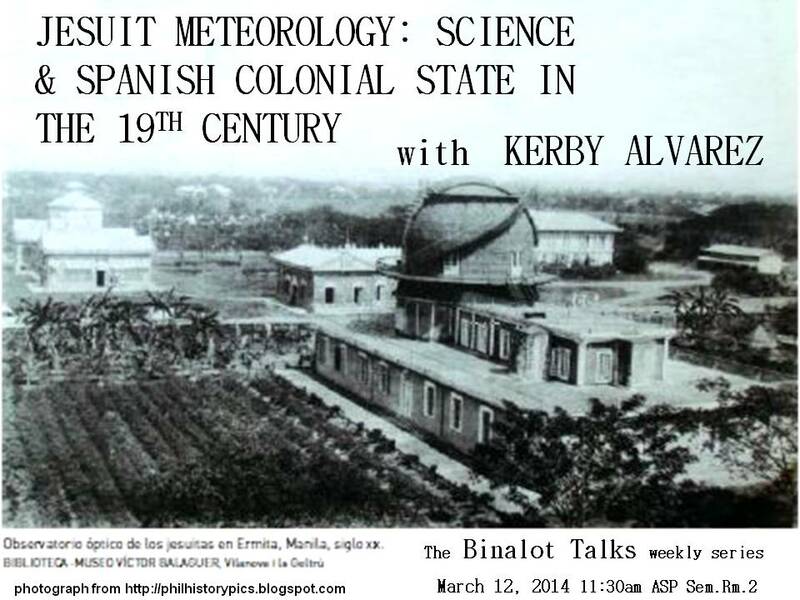 JESUIT METEOROLOGY: SCIENCE & SPANISH COLONIAL STATE IN THE 19TH CENTURY. 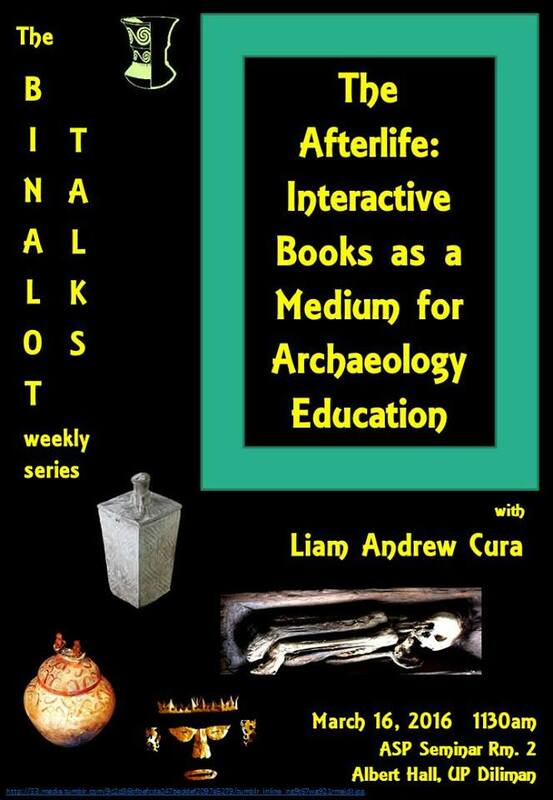 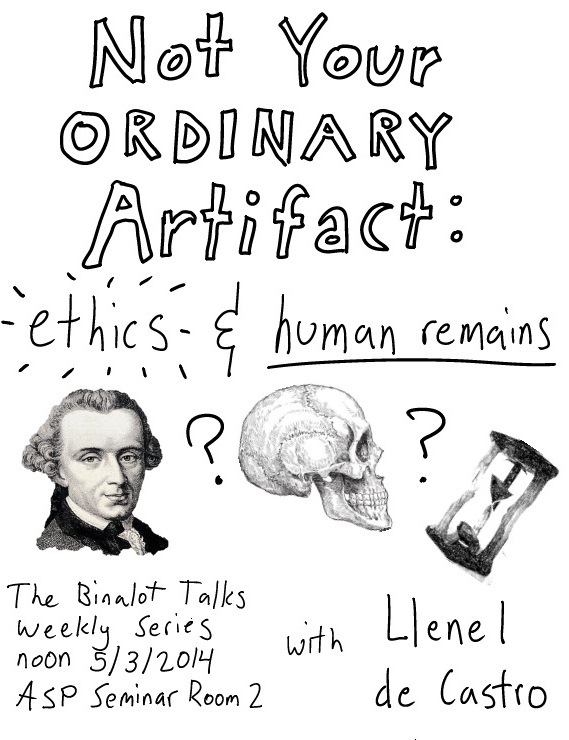 NOT YOUR ORDINARY ARTIFACT: Ethics and Human Remains. 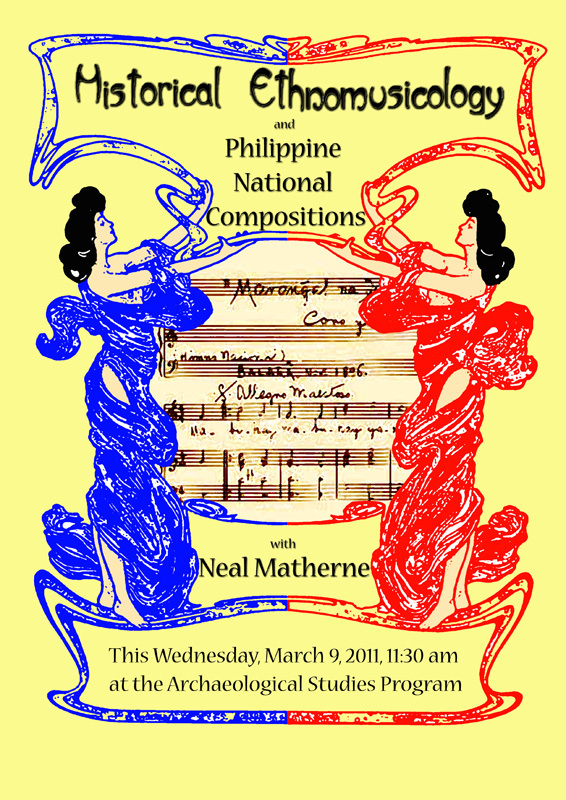 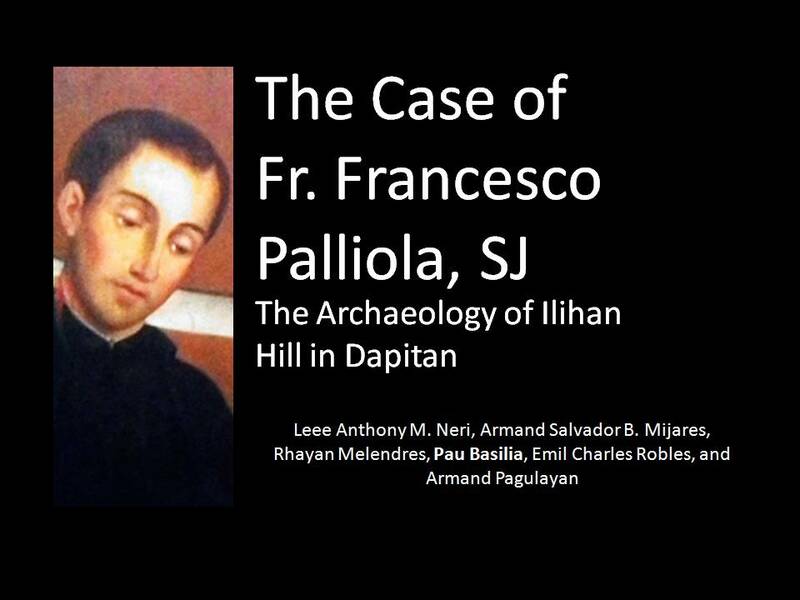 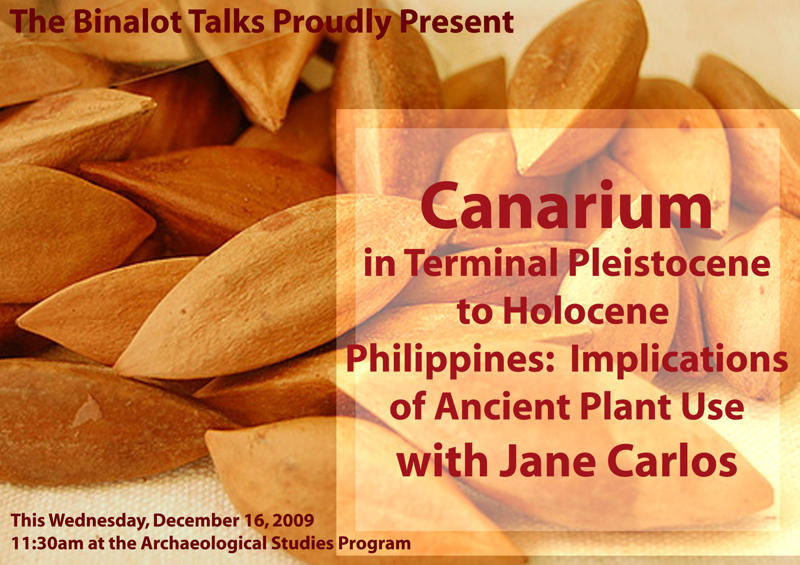 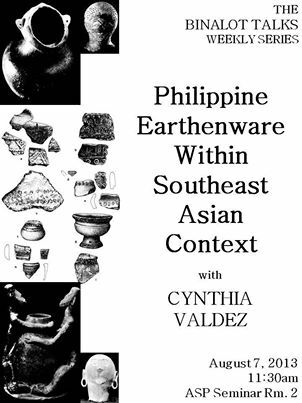 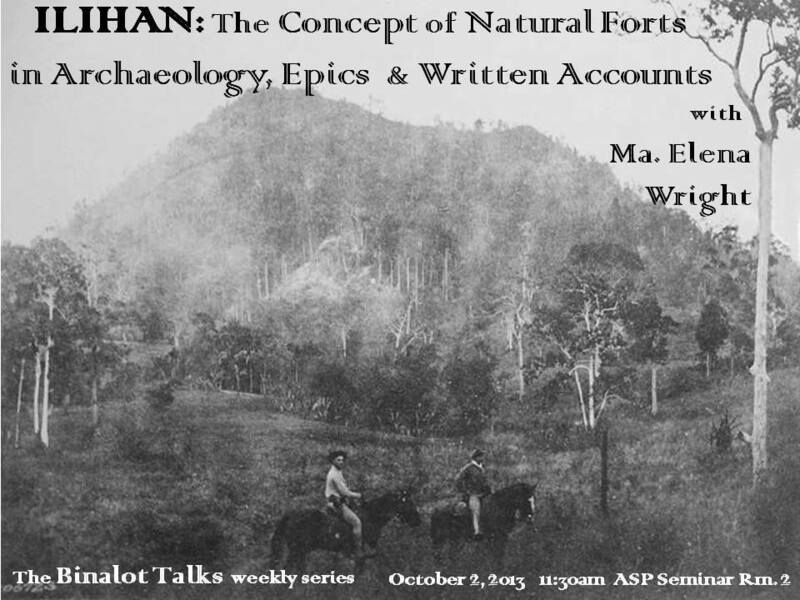 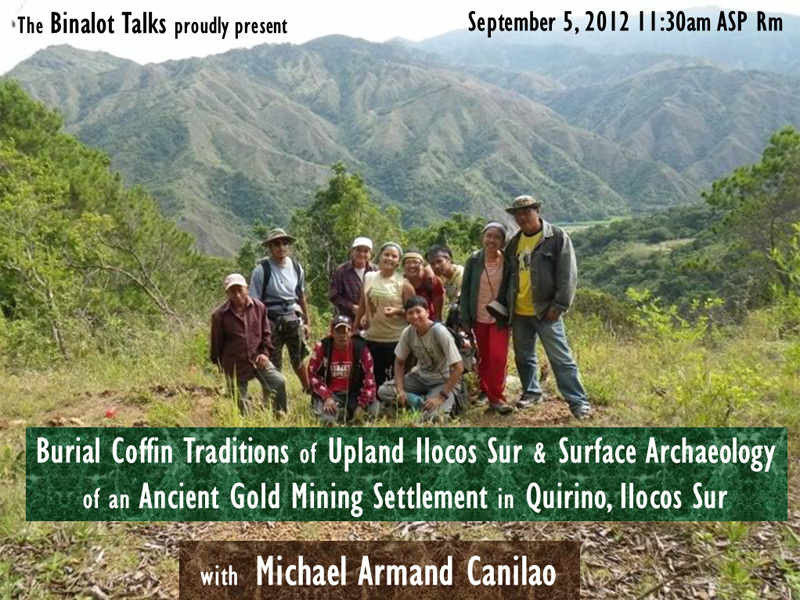 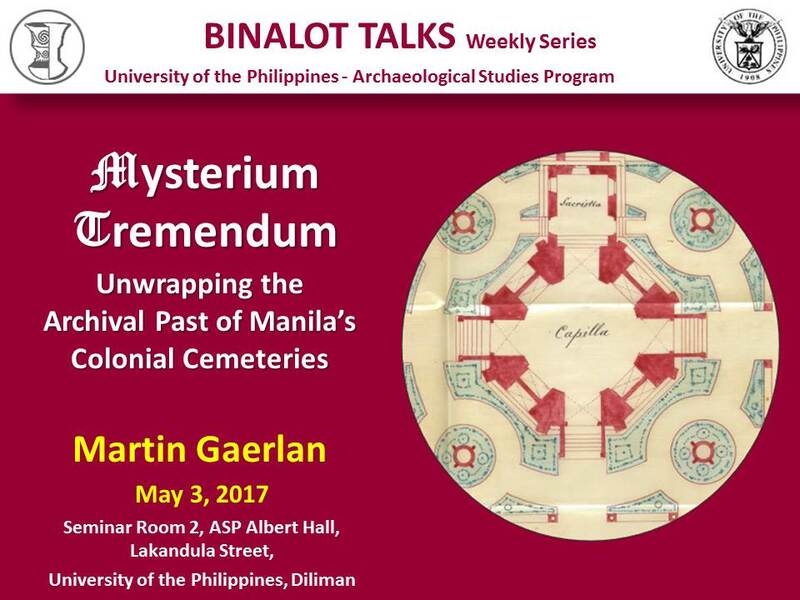 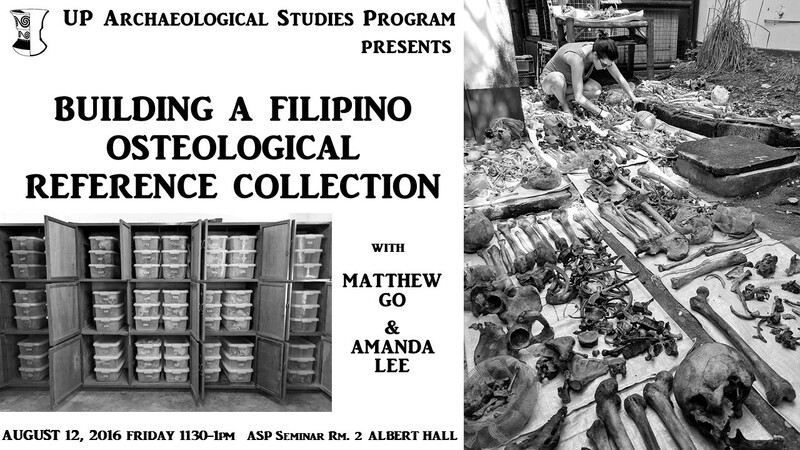 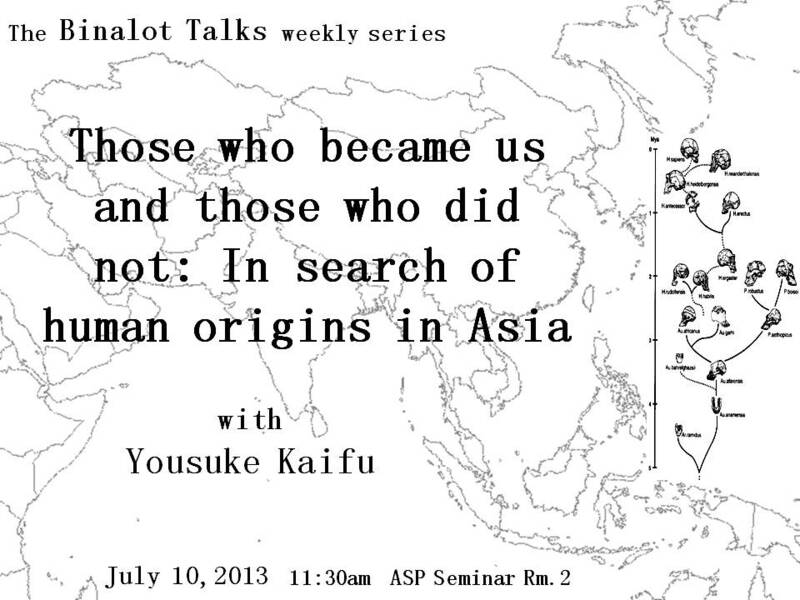 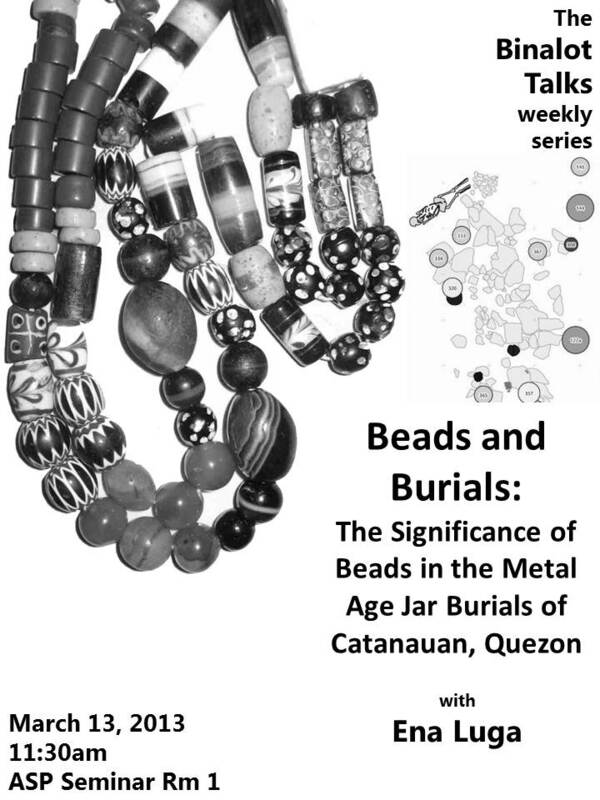 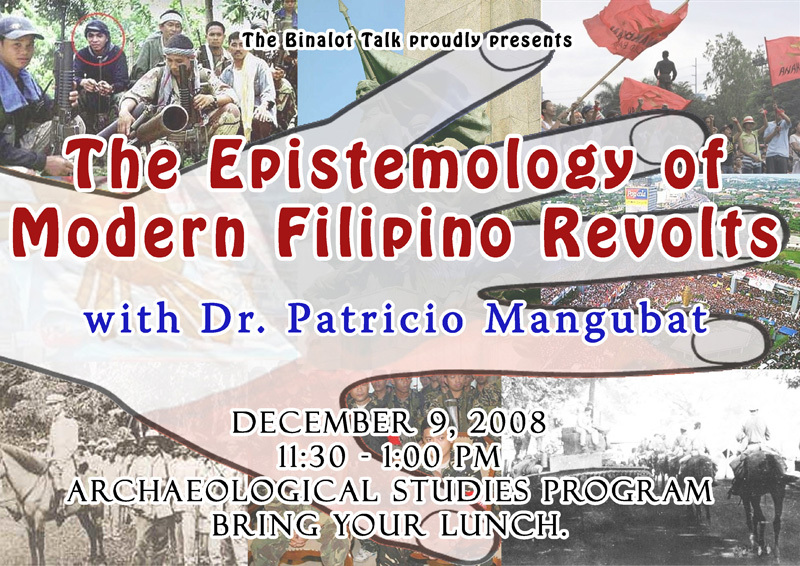 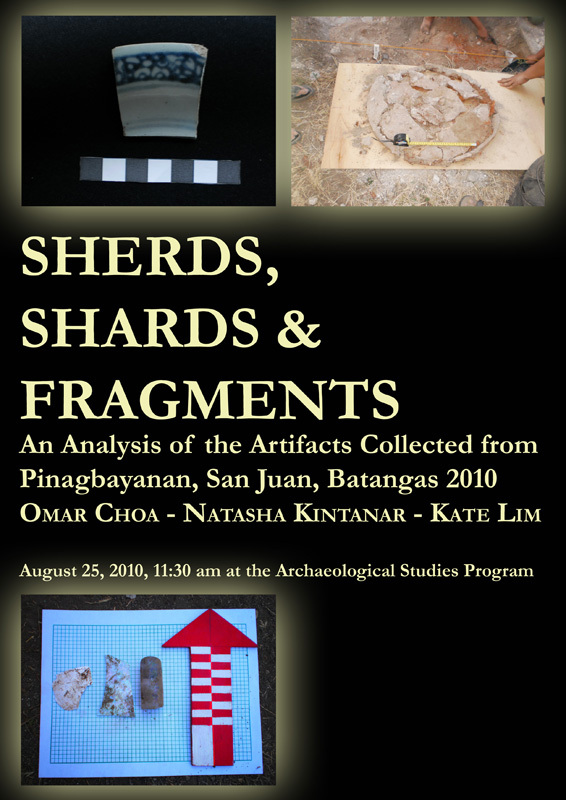 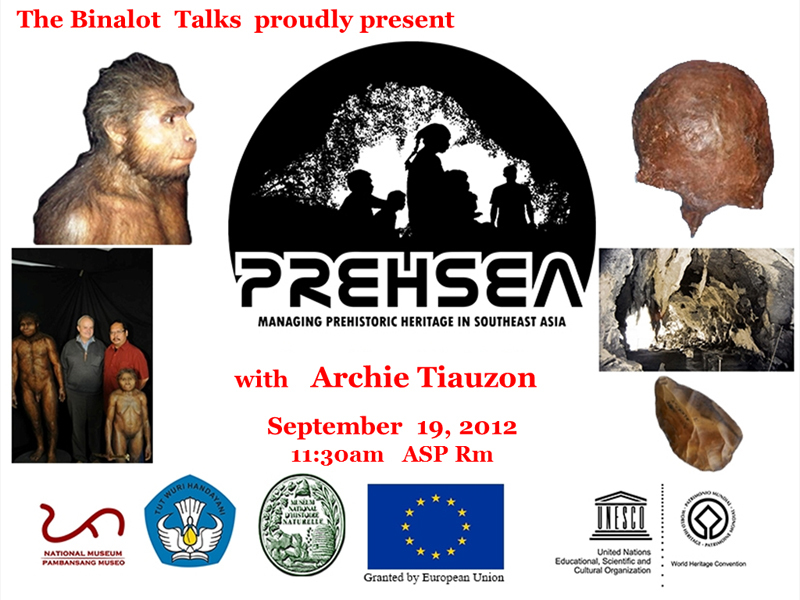 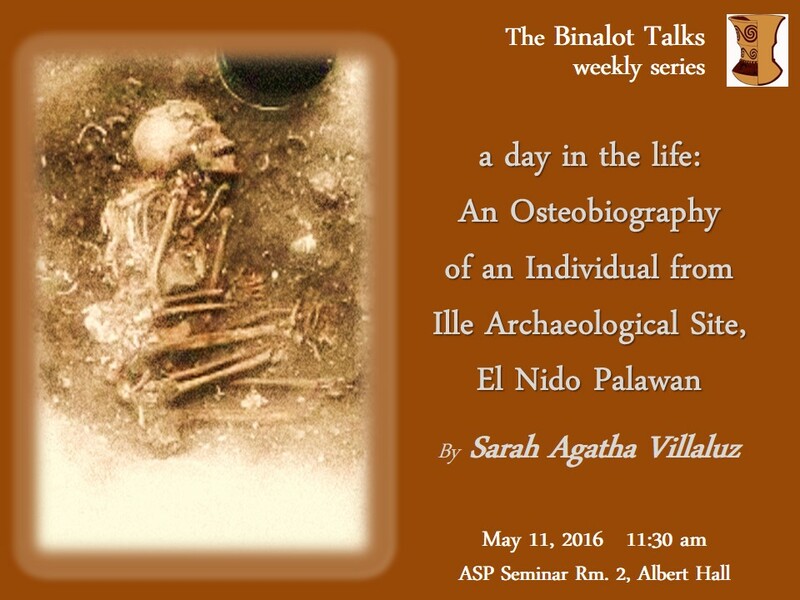 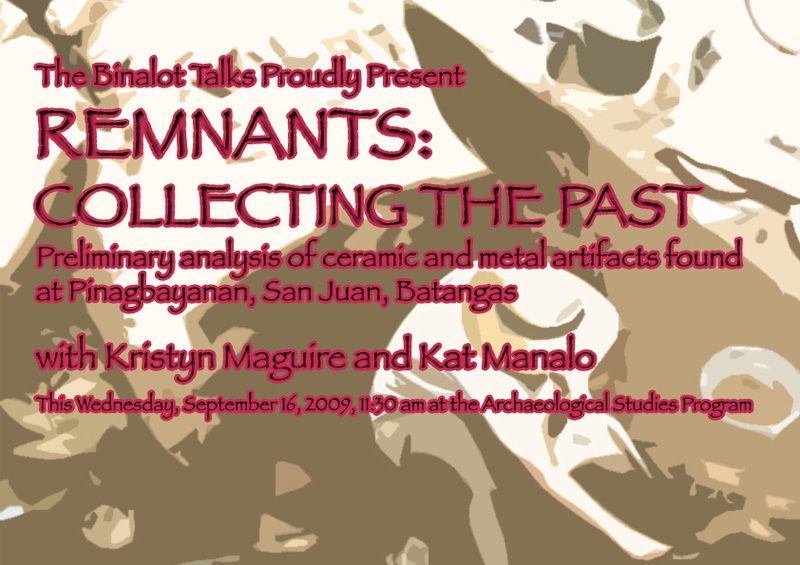 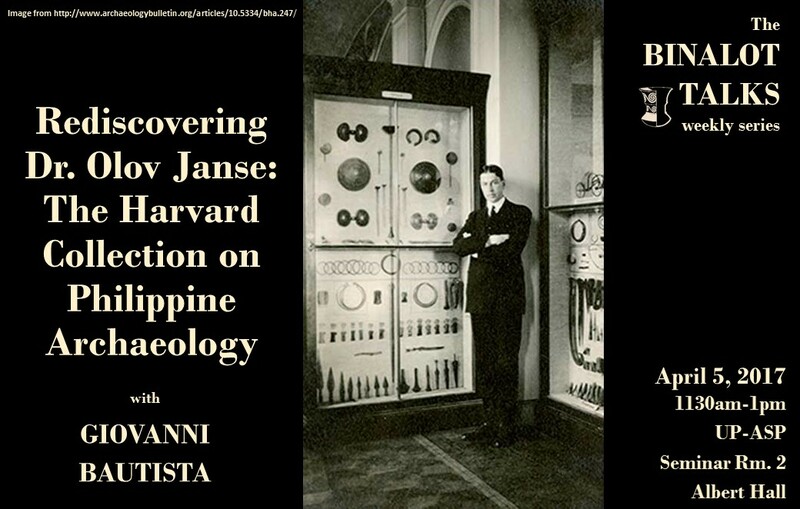 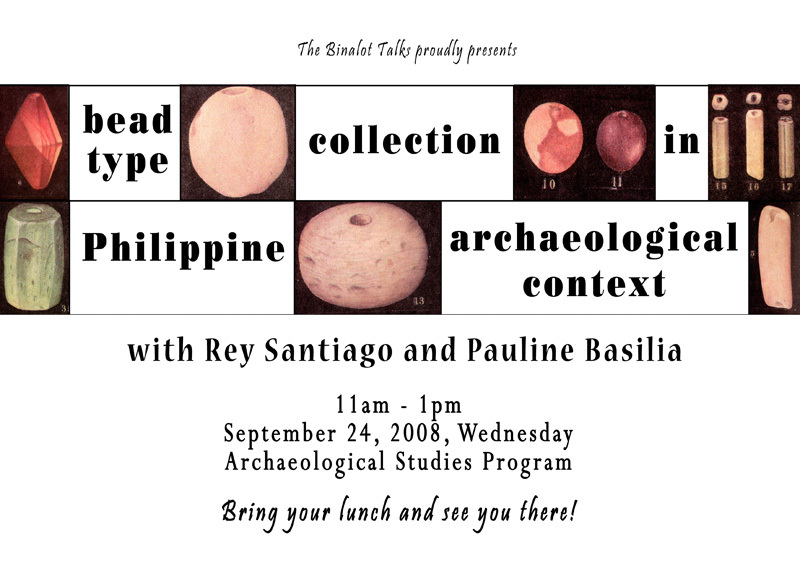 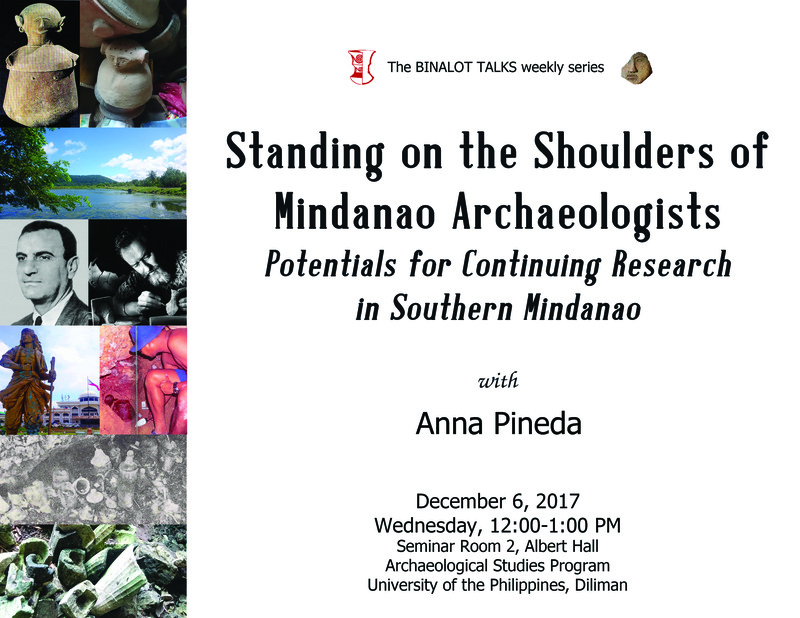 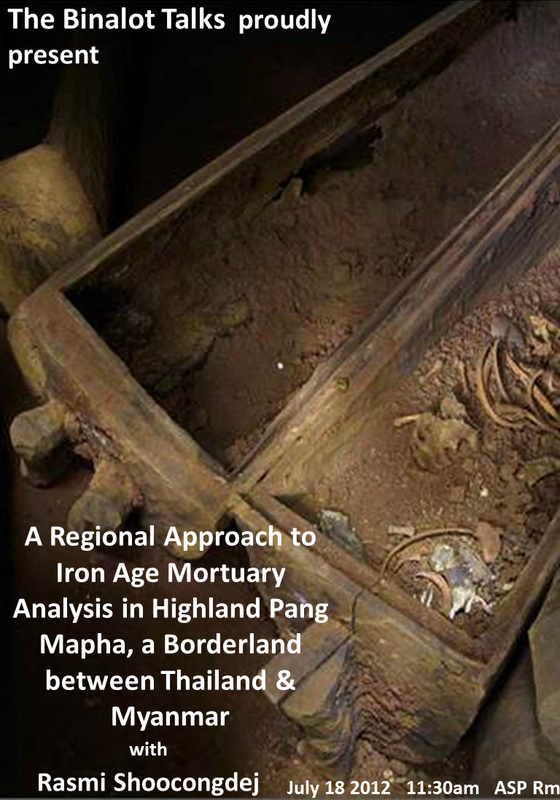 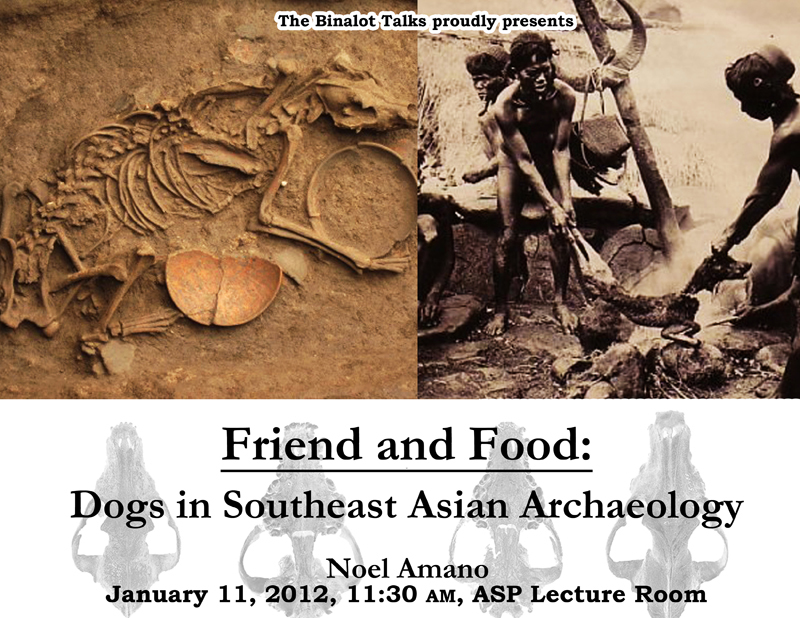 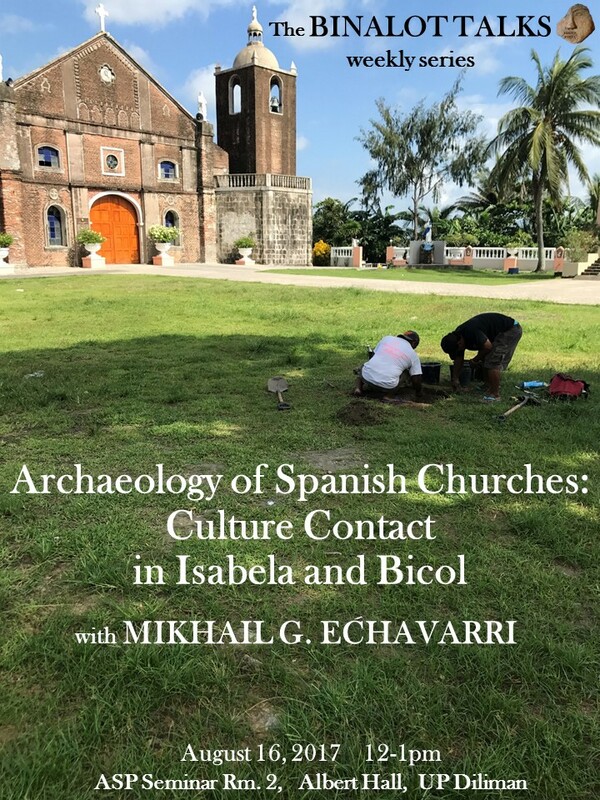 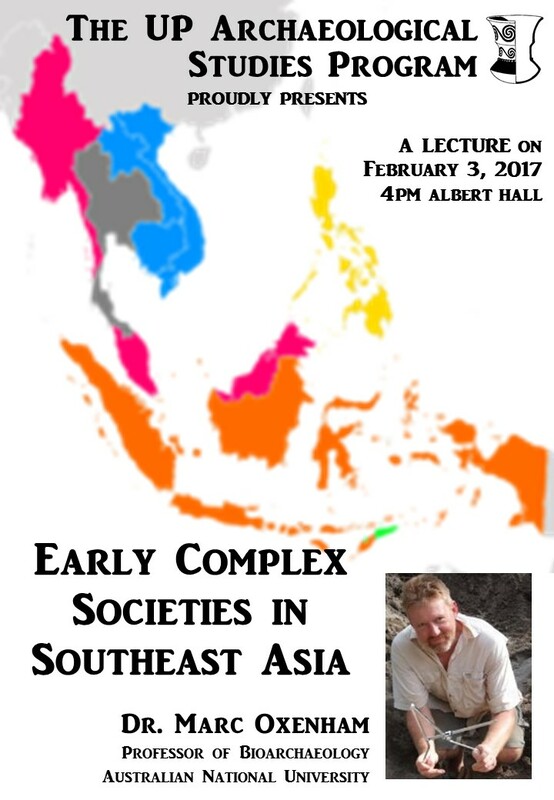 THE DEATH OF GOLD IN EARLY PHILIPPINE SOCIETIES:Ethnohistoric Accounts and Archaeological Evidences. 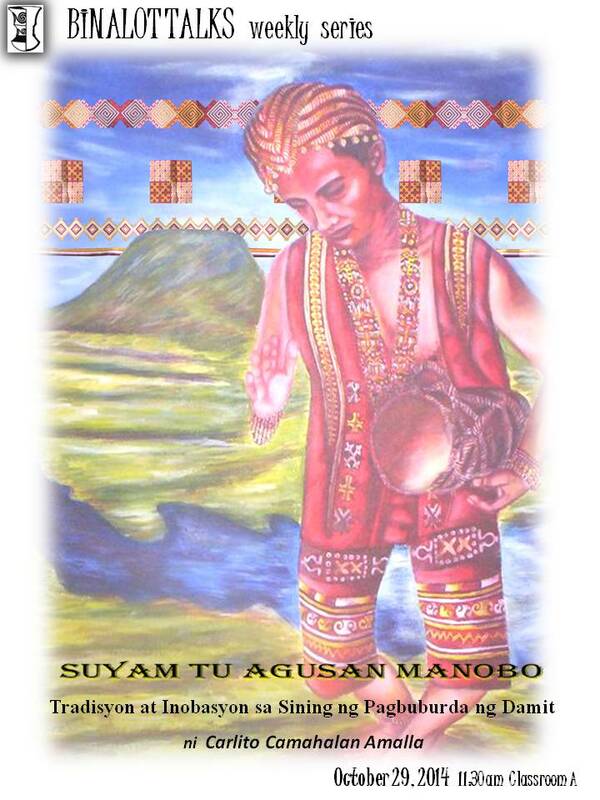 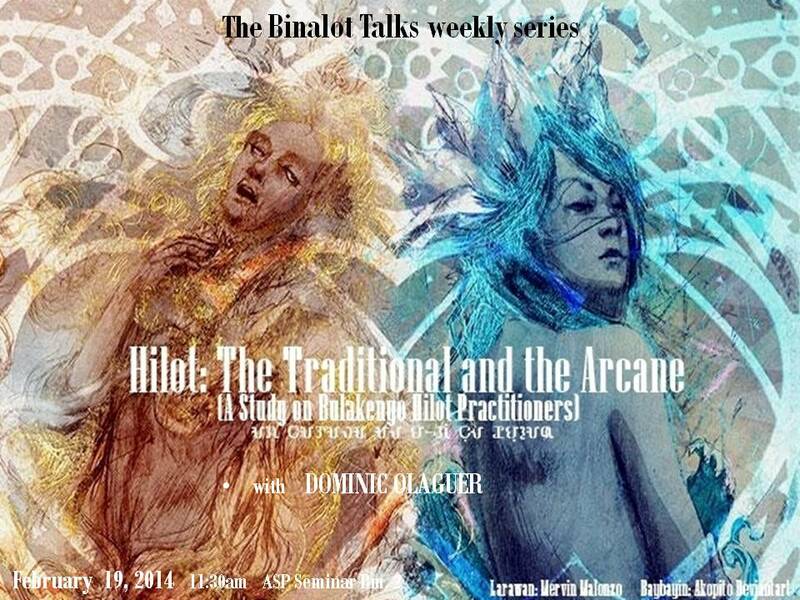 HILOT: THE TRADITIONAL & THE ARCANE, A Study on Bulakenyo Hilot Practitioners. 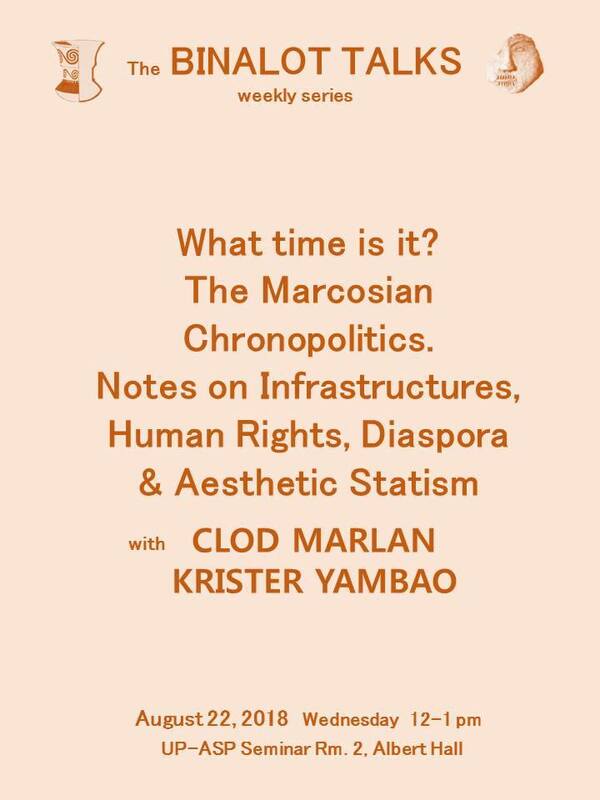 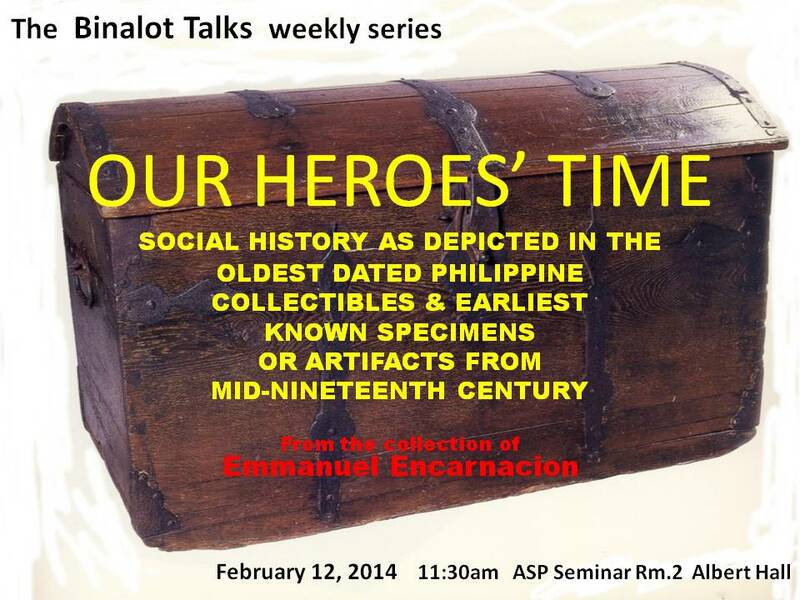 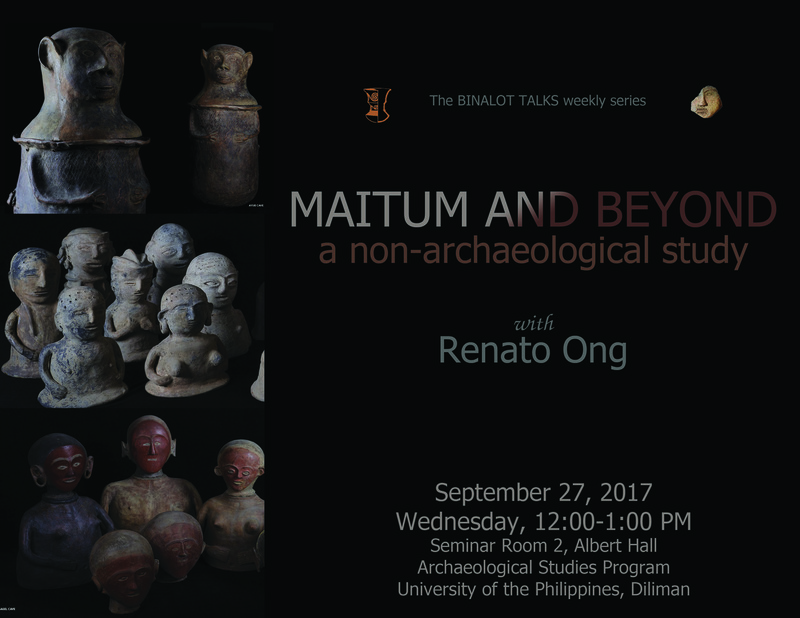 OUR HEROES’ TIME: Social History as Depicted in the Oldest Dated Philippine Collectibles & Earliest Known Artifacts from the 19th Century. 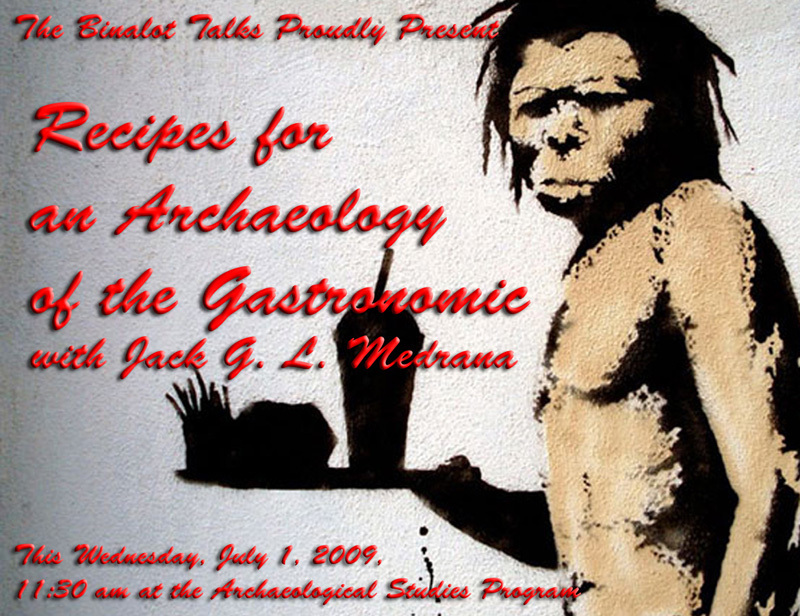 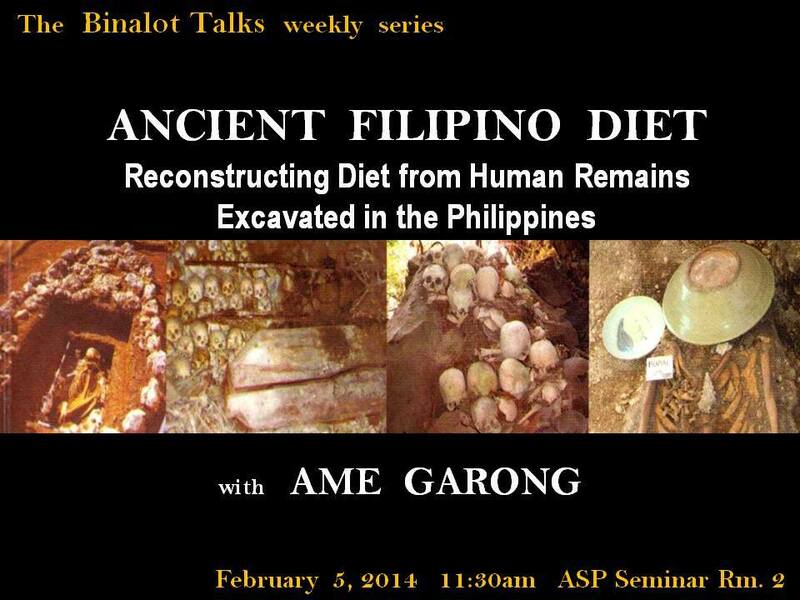 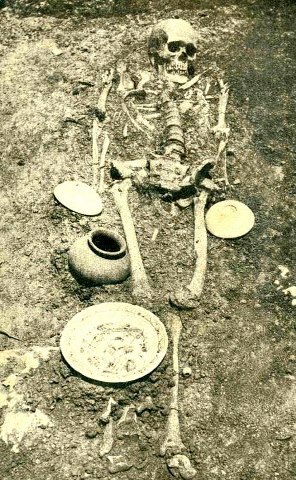 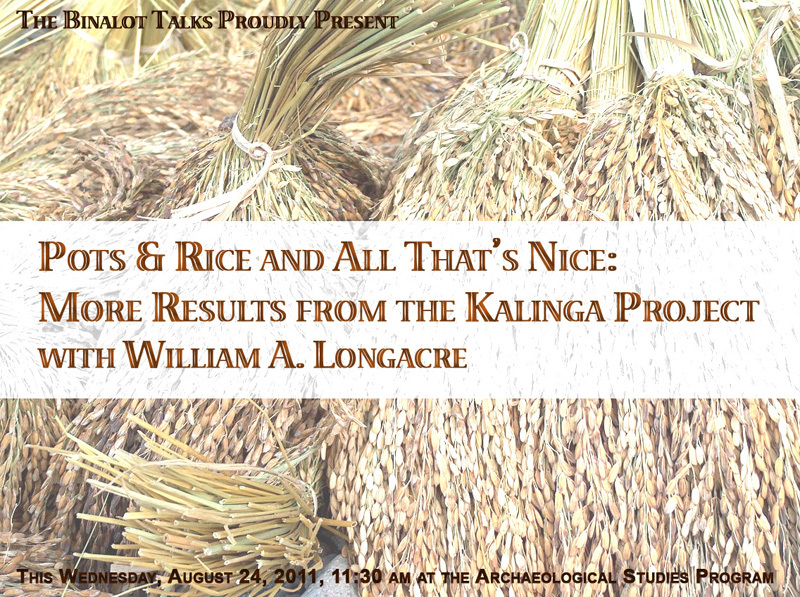 ANCIENT FILIPINO DIET: Reconstructing Diet from Human Remains Excavated in the Philippines. 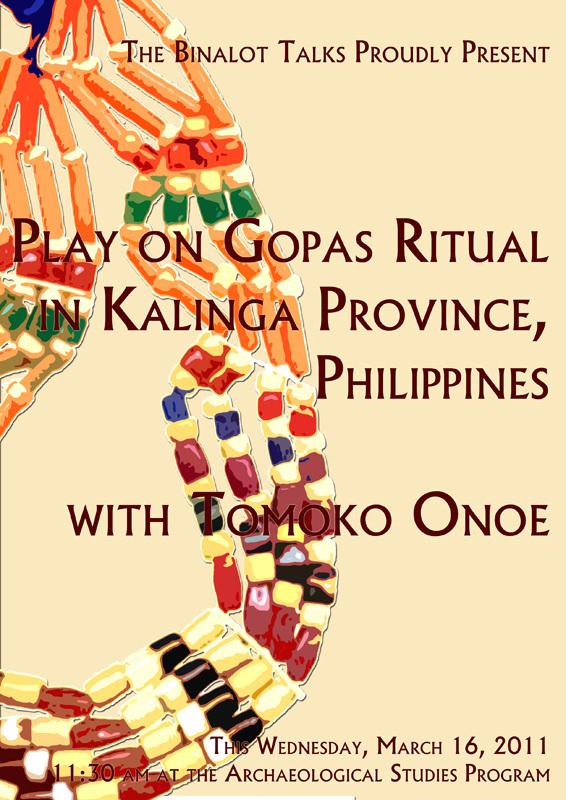 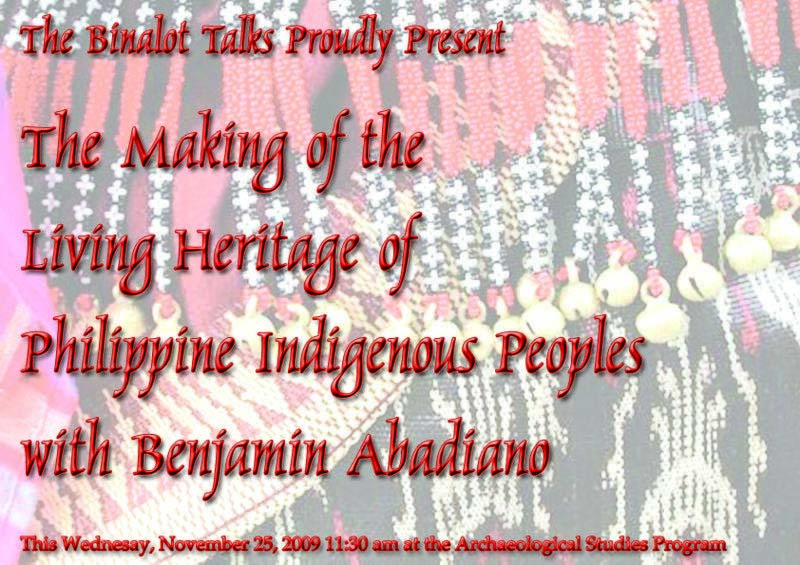 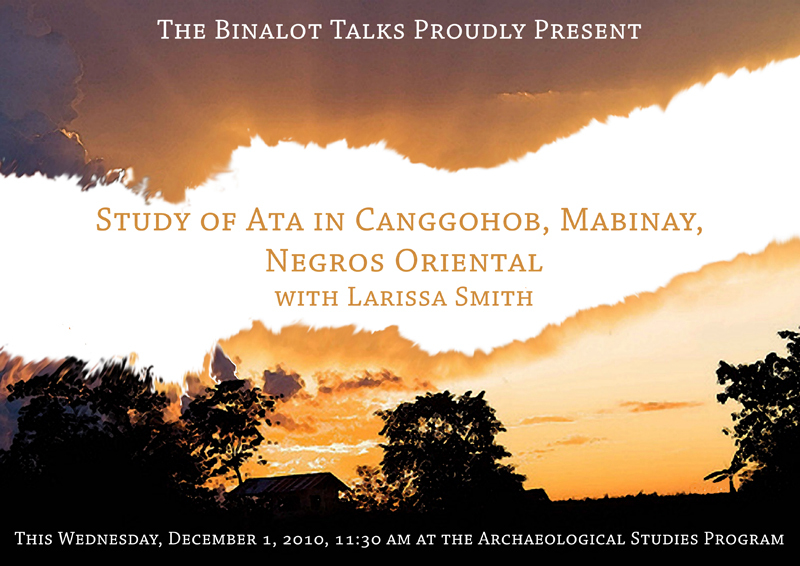 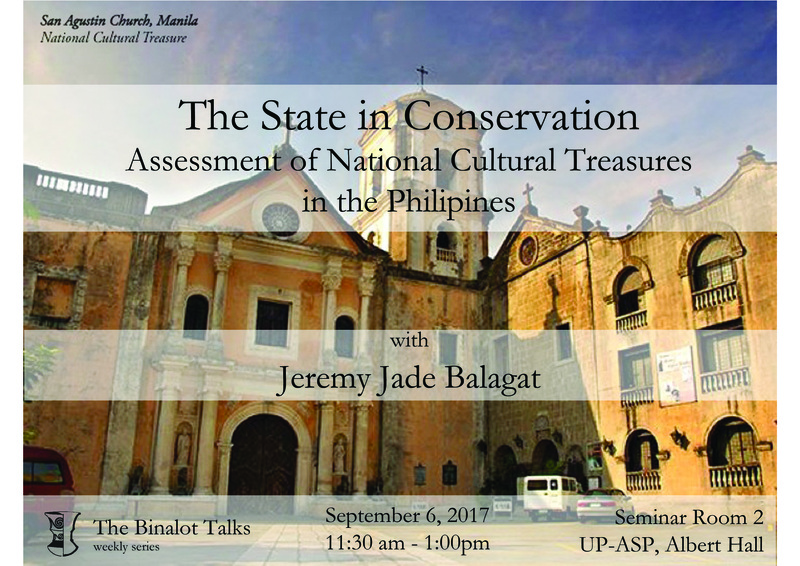 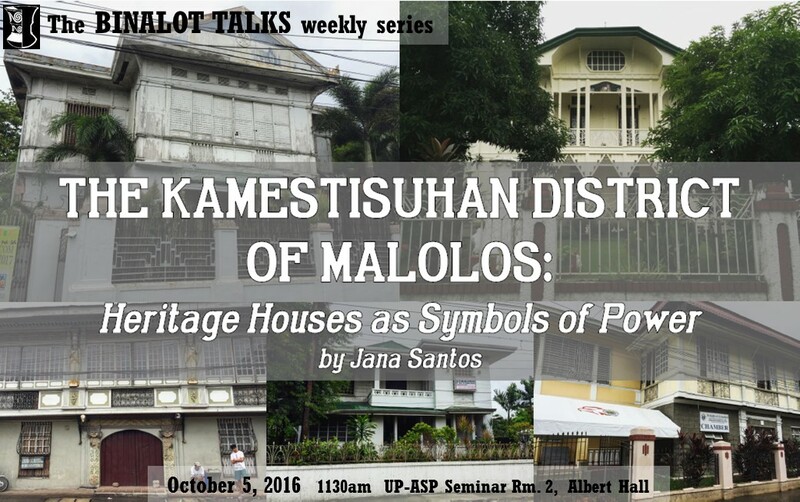 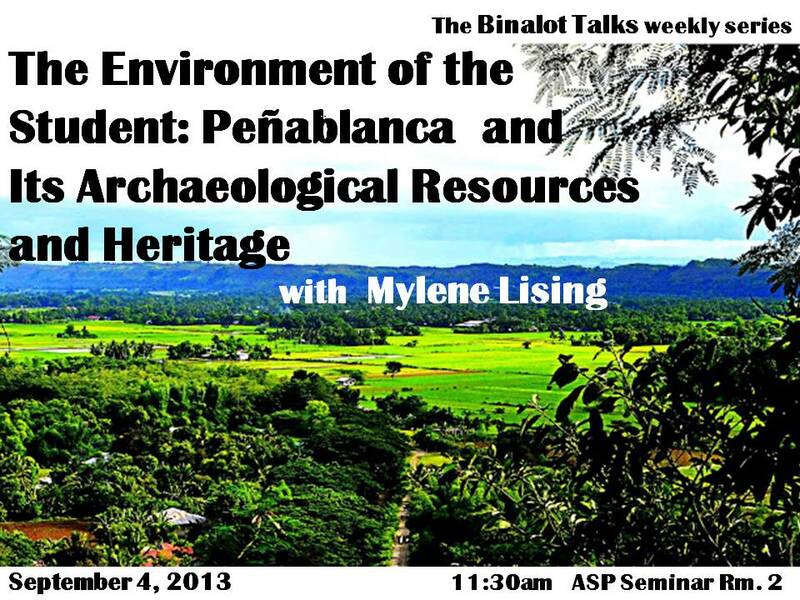 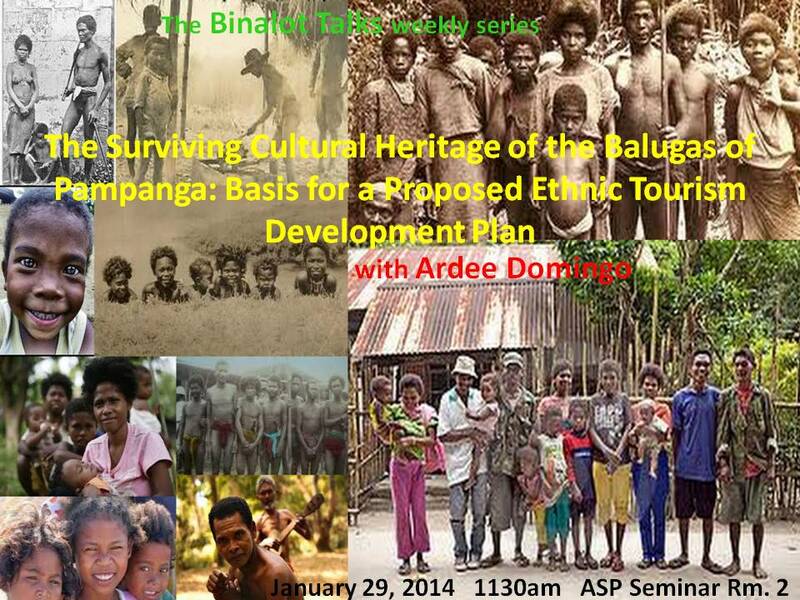 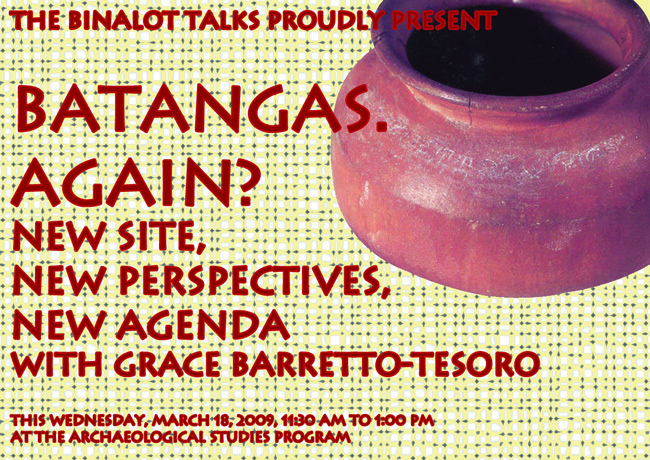 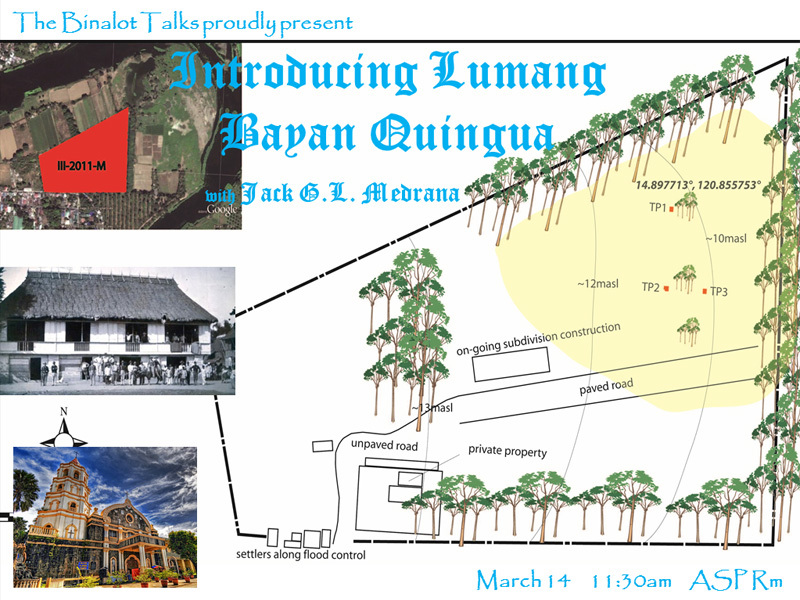 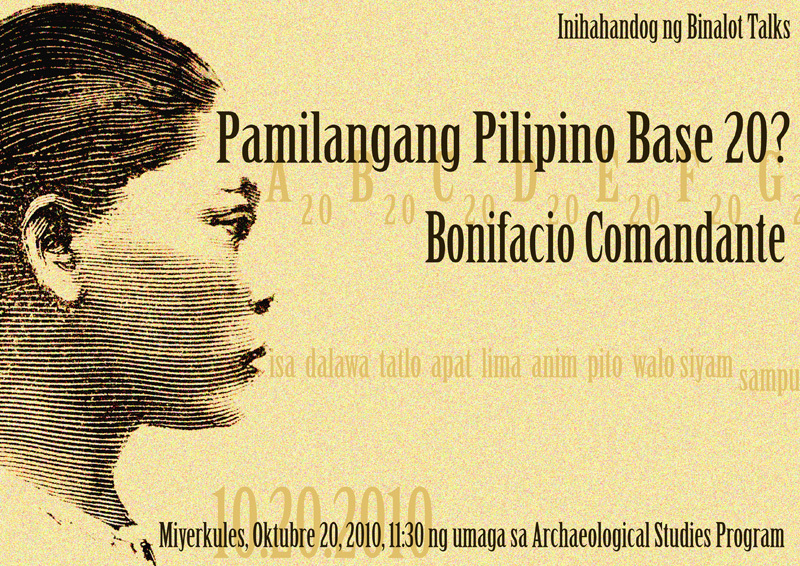 The Surviving Cultural Heritage of the Balugas of Pampanga: Basis for a Proposed Ethnic Tourism Development Plan. 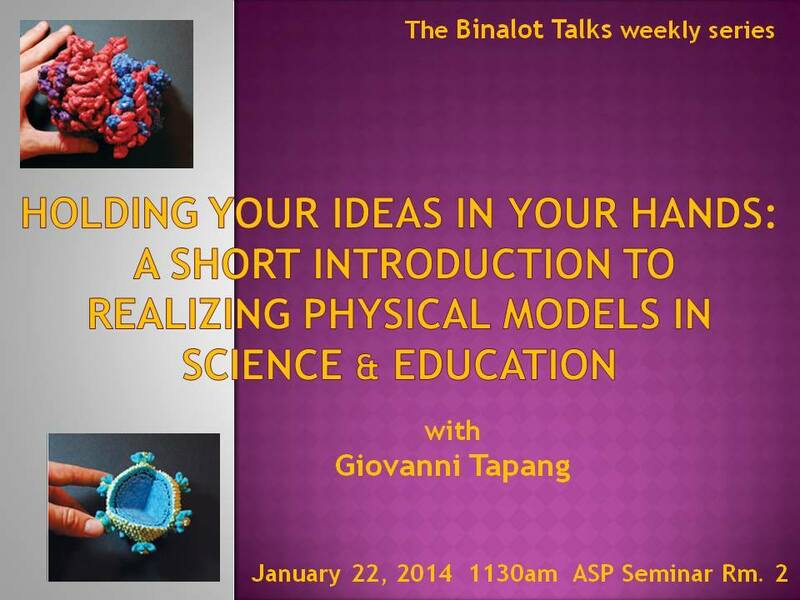 Holding your ideas in your hands: a short introduction to realizing physical models in science & education. 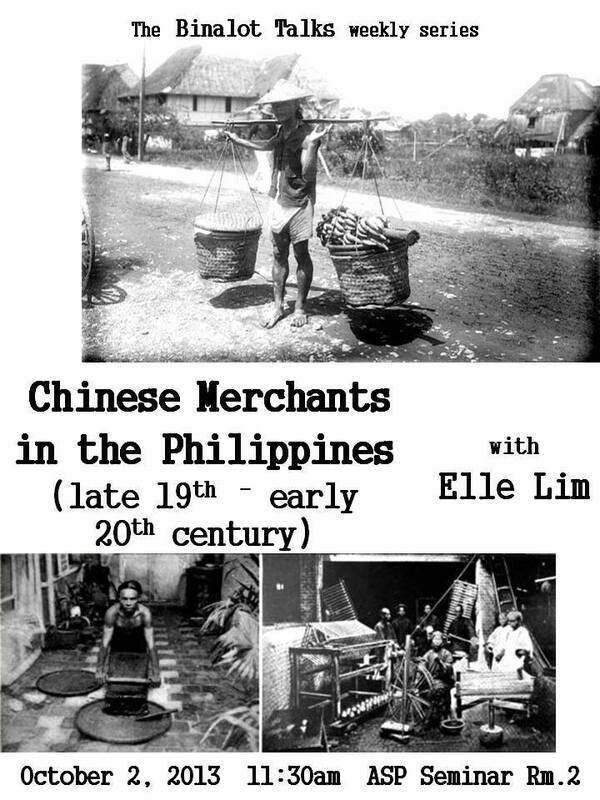 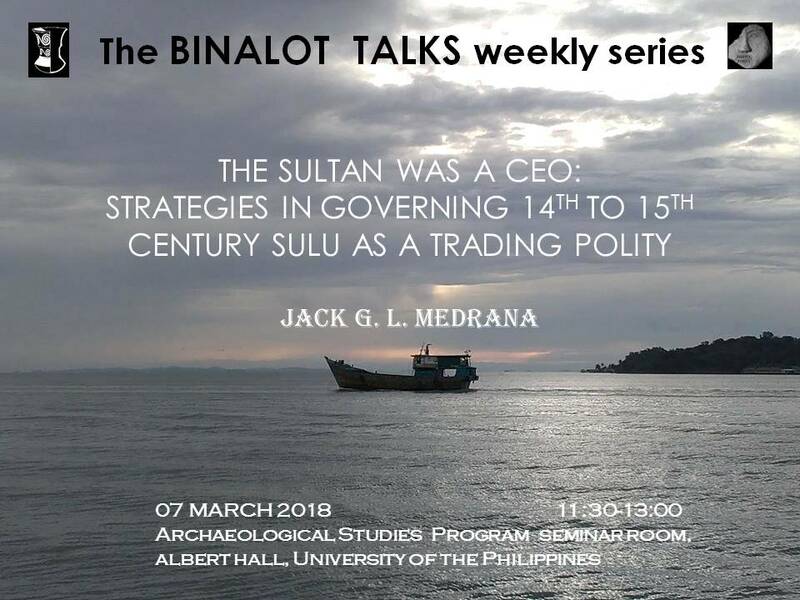 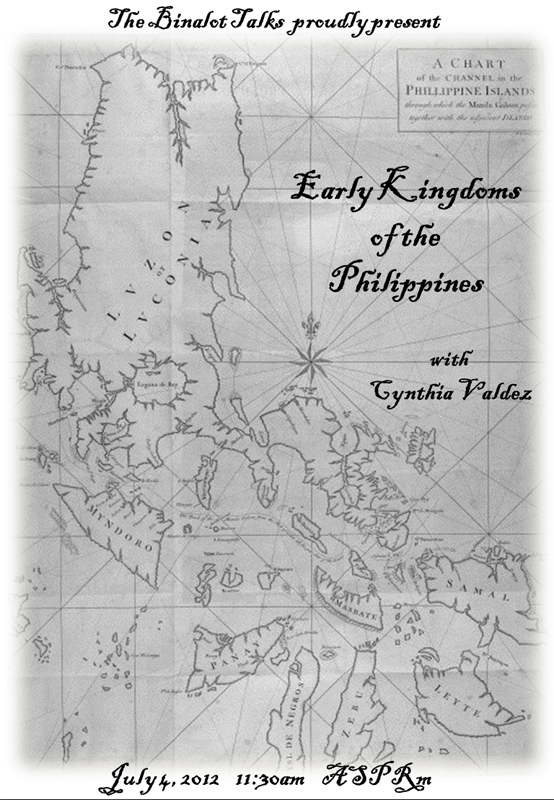 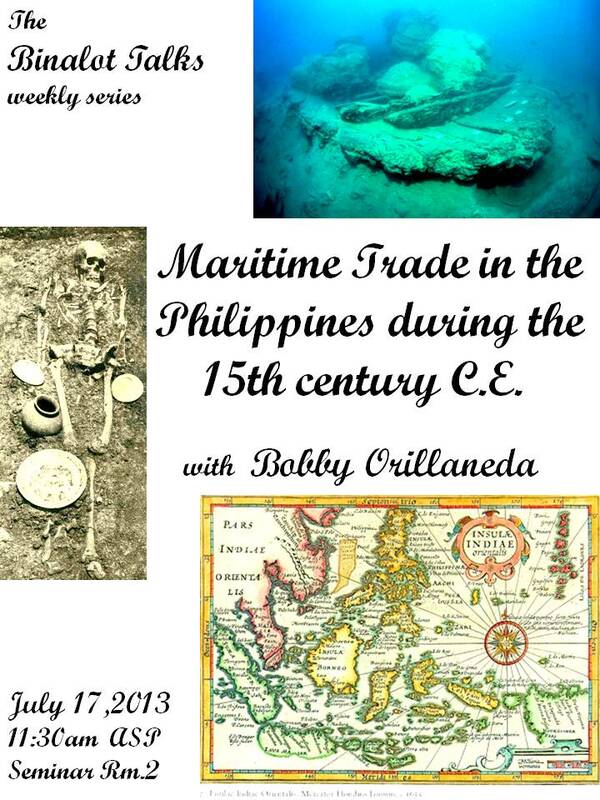 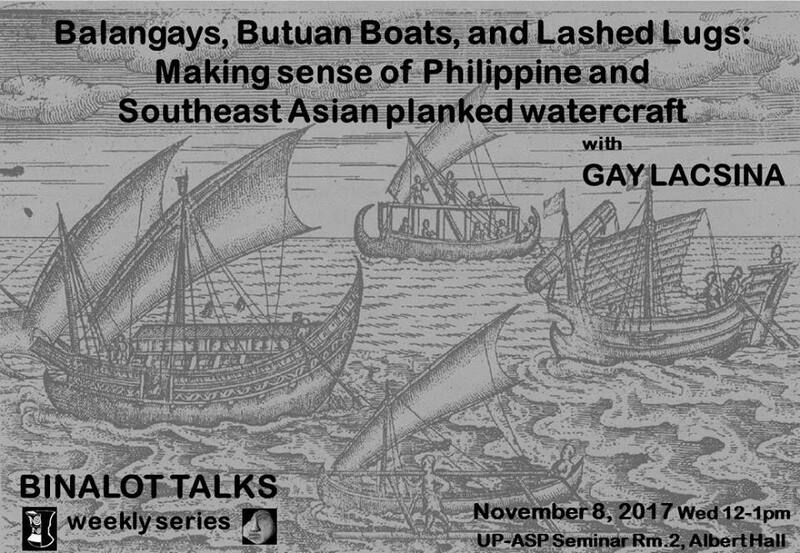 Maritime Trade in the Philippines during the 15th century C.E. 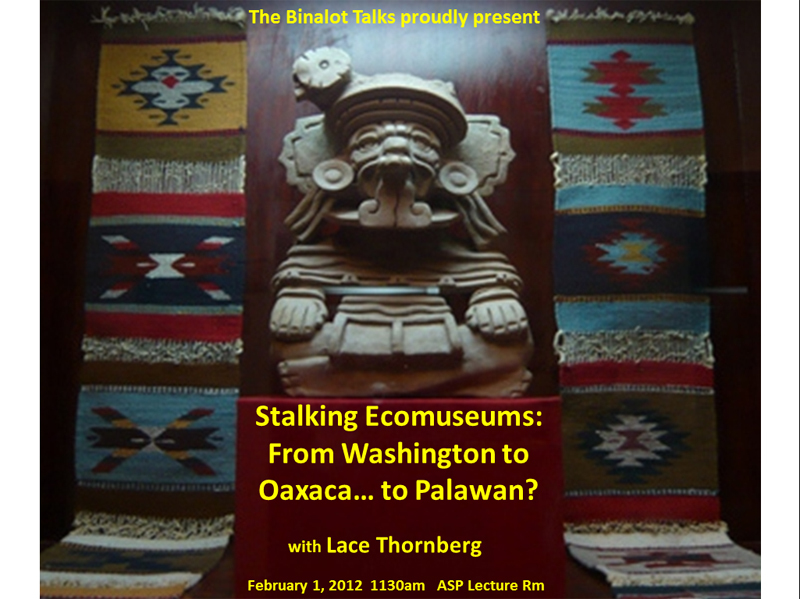 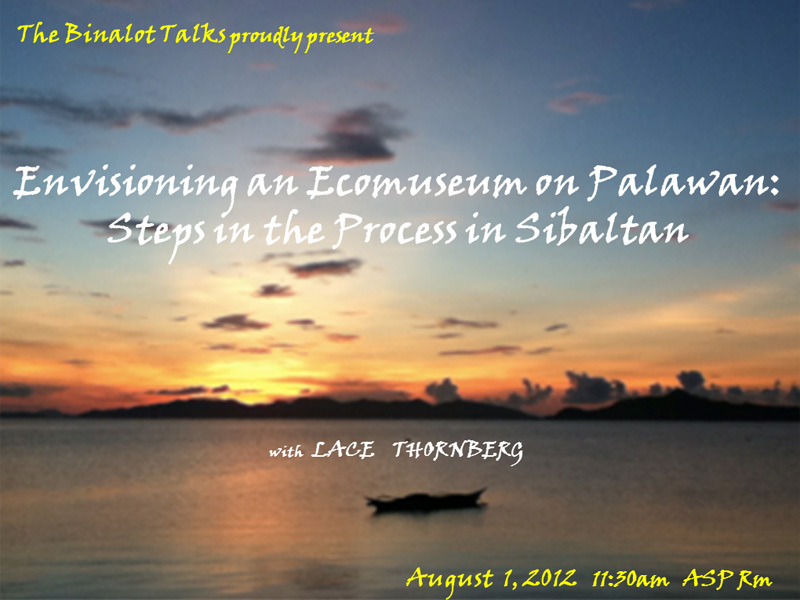 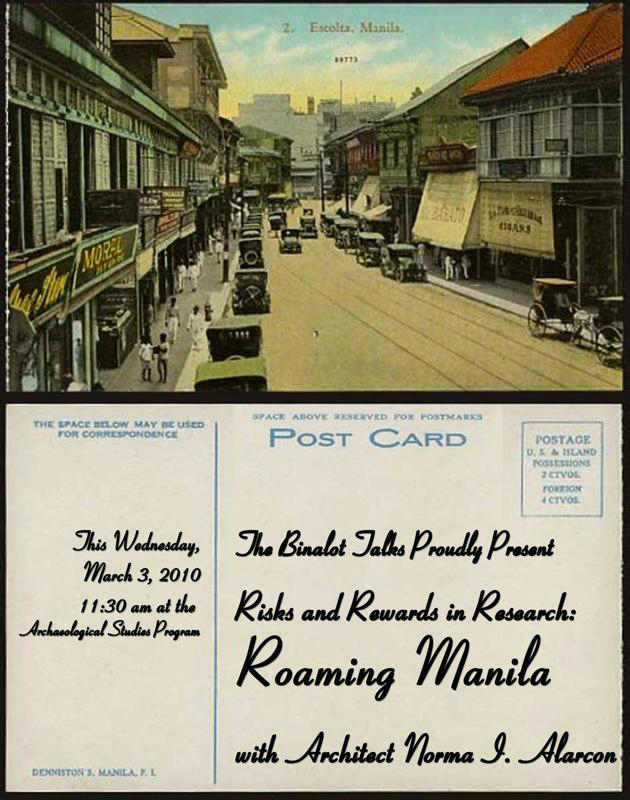 Stalking Ecomuseums: From Washington to Oaxaca...to Palawan? 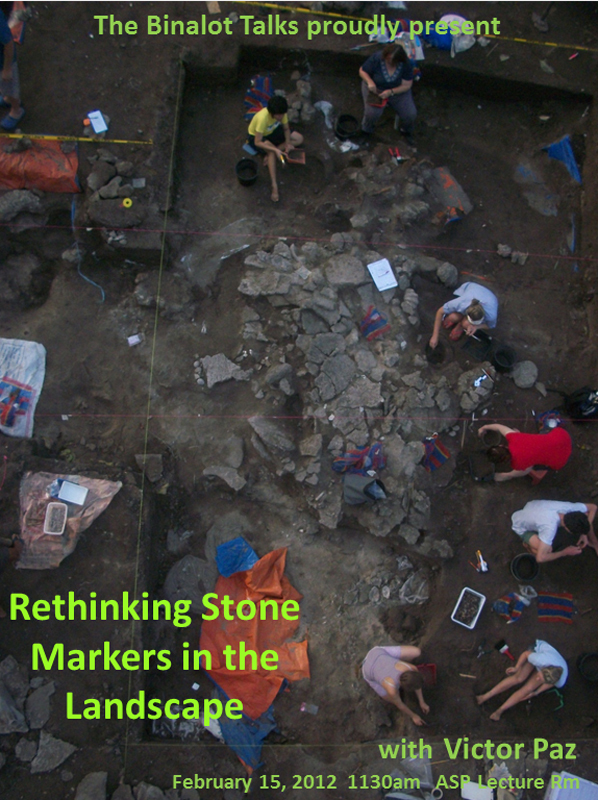 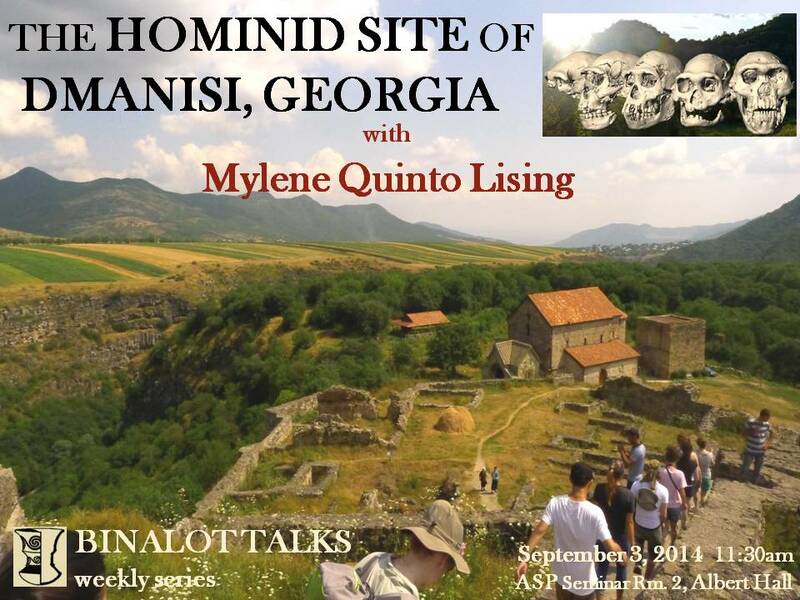 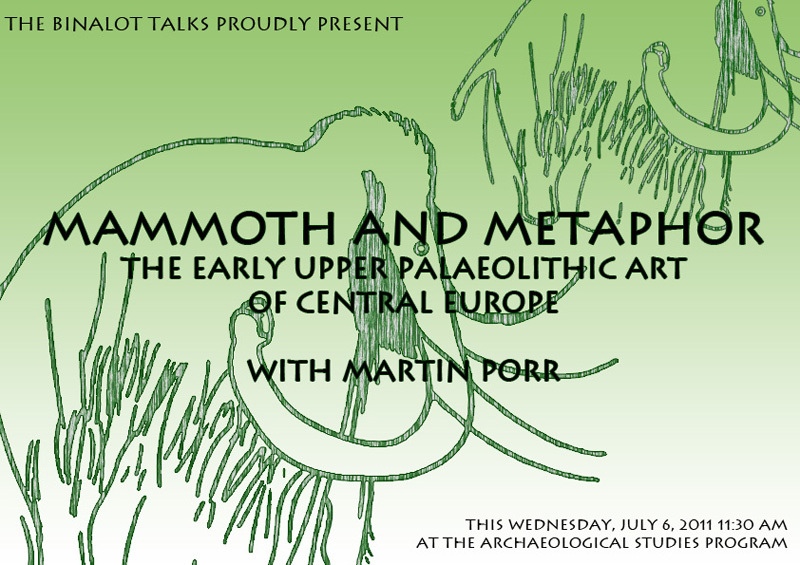 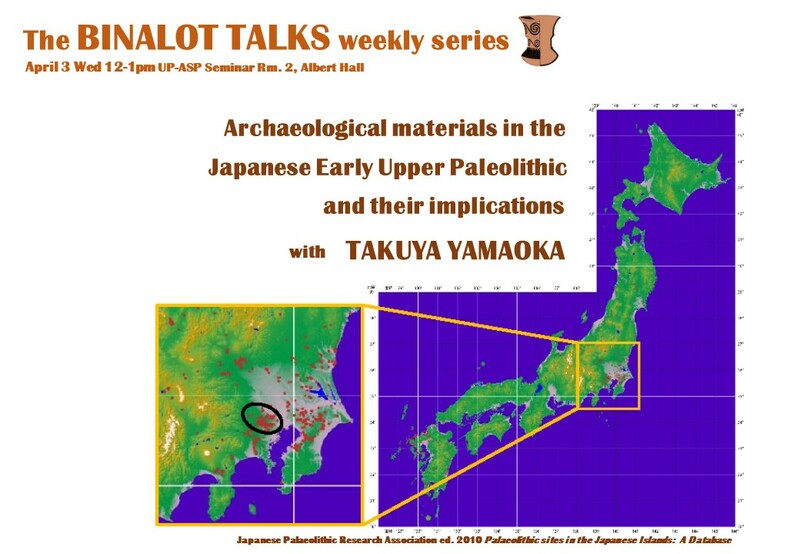 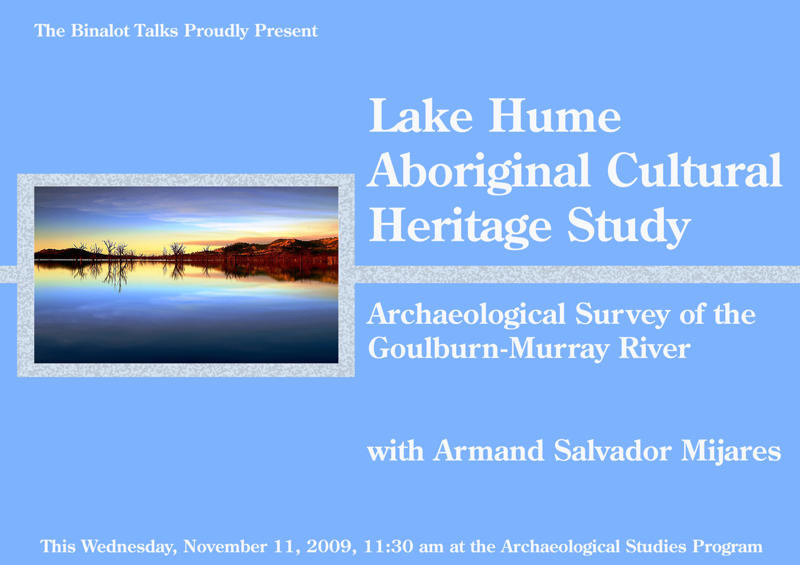 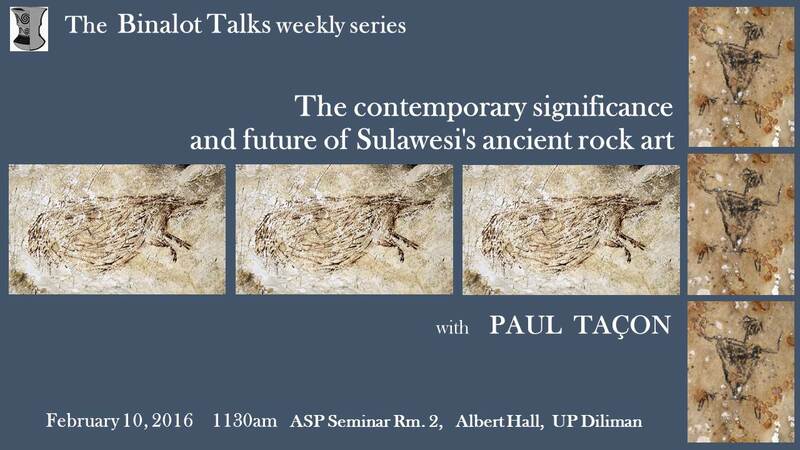 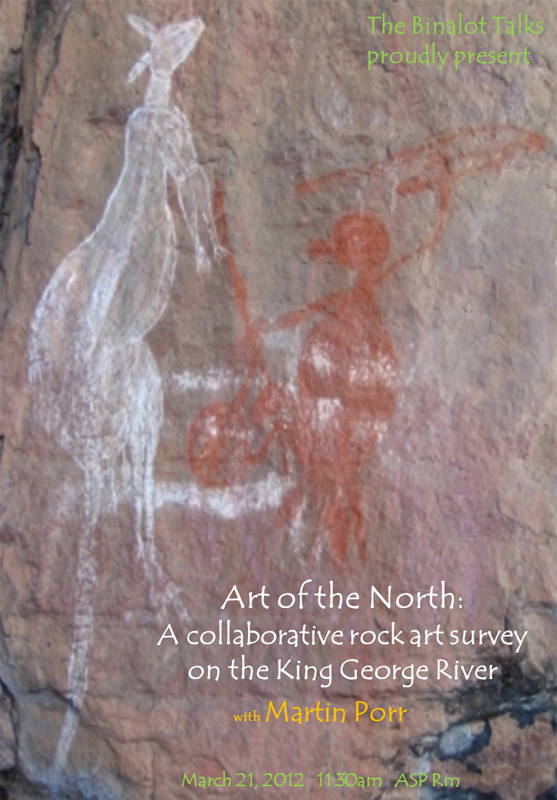 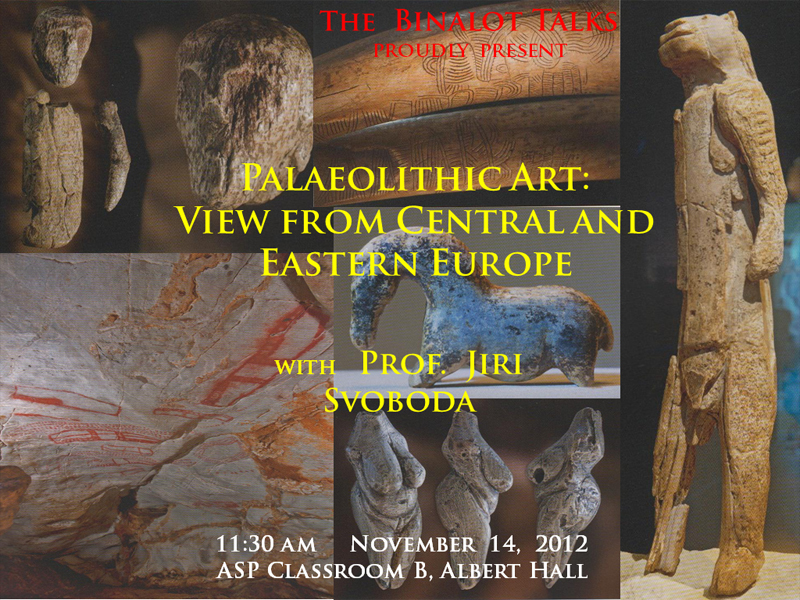 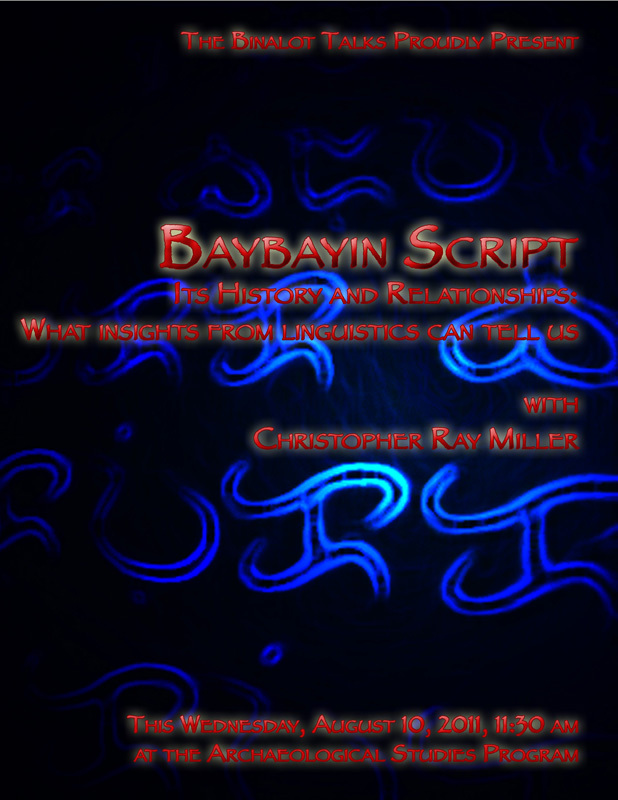 "Taming" of Space: Rock art as sites of knowledge transmission? 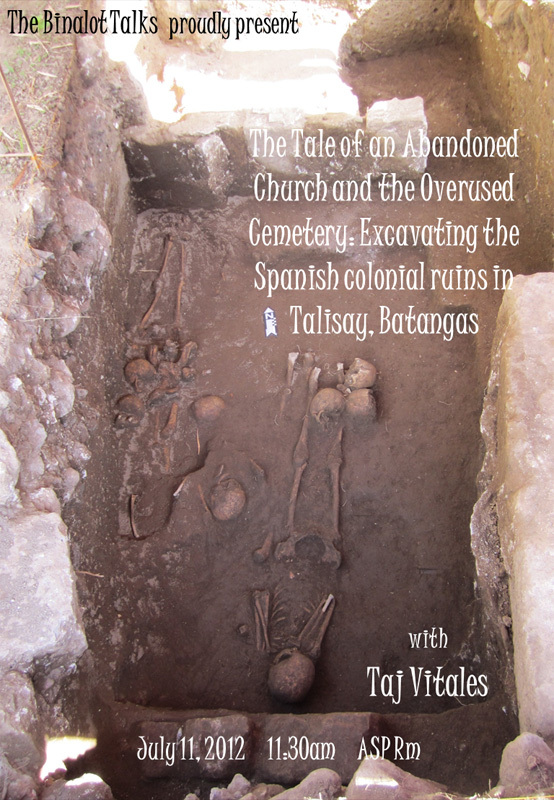 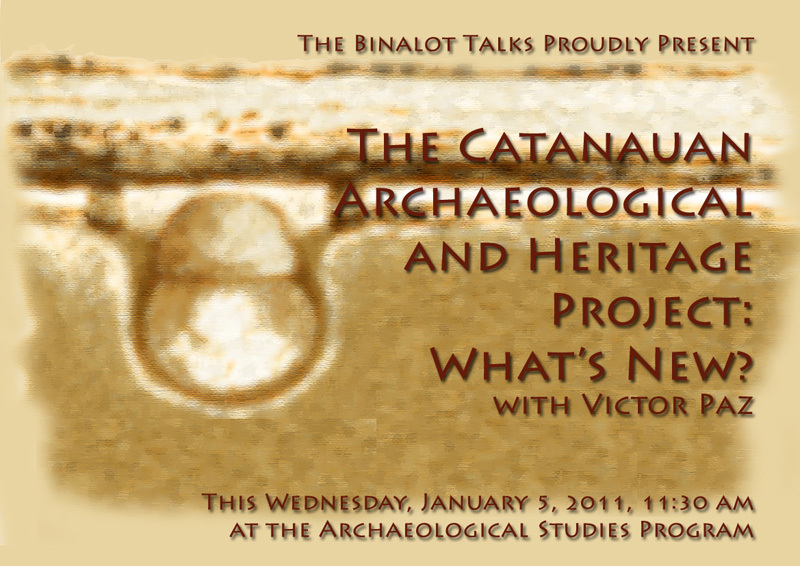 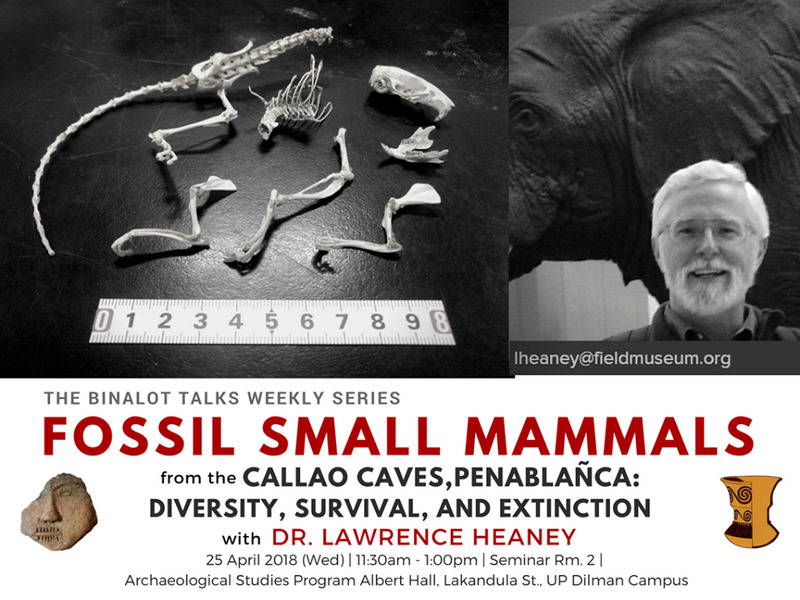 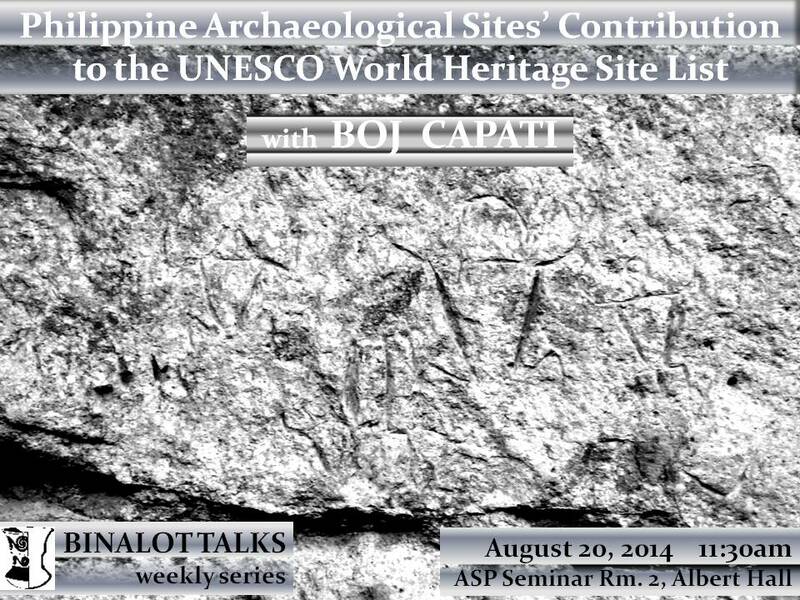 The Catanauan Archaeological and Heritage Project: What's New? 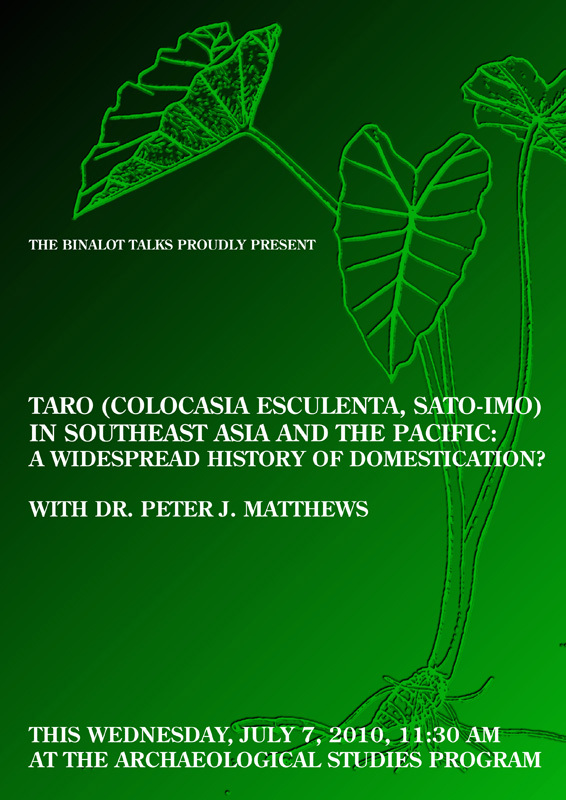 Taro (Colocasia esculenta) in Southeast Asia and the Pacific: a widespread history of domestication? 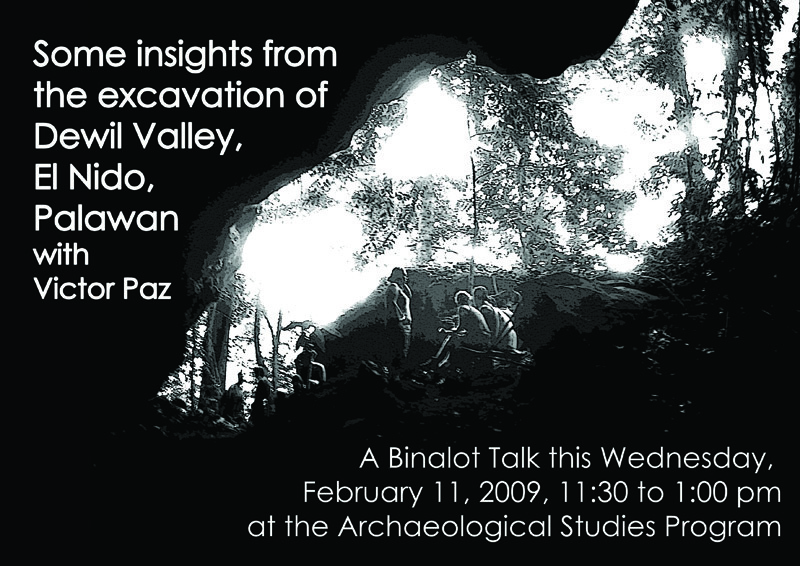 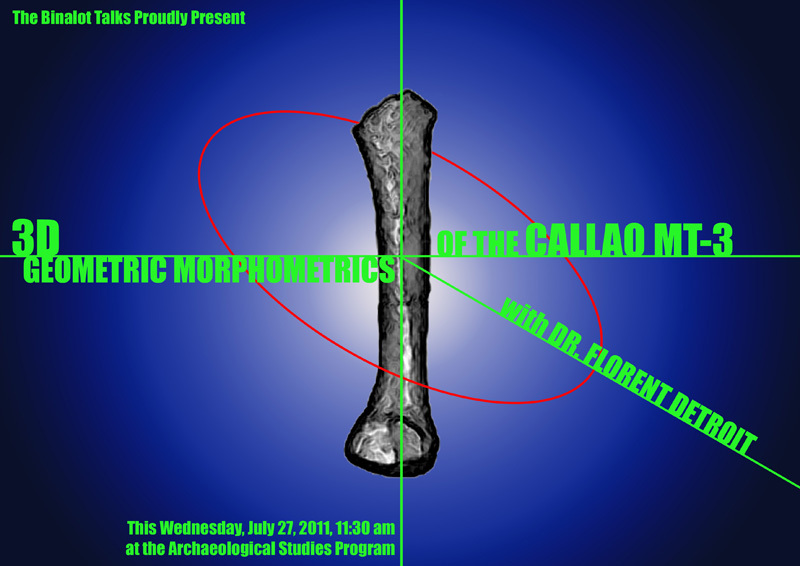 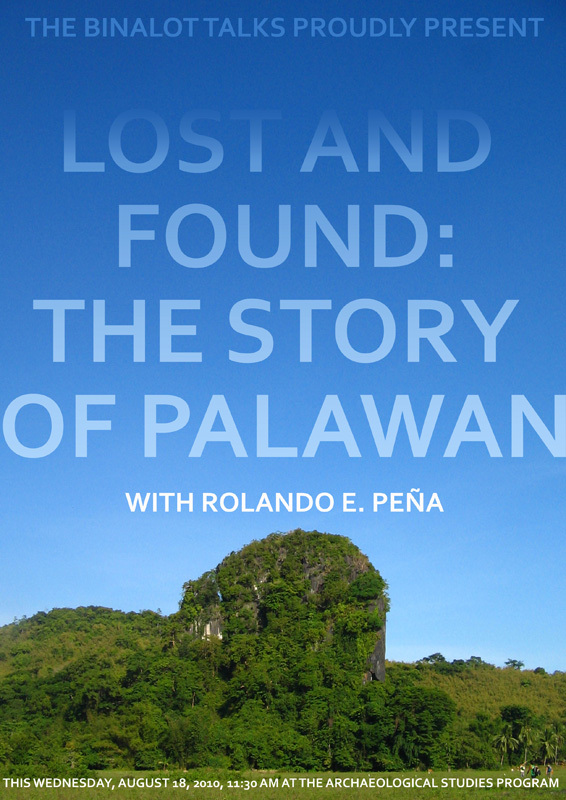 Where is the Neolithic in Ille Cave, Palawan? 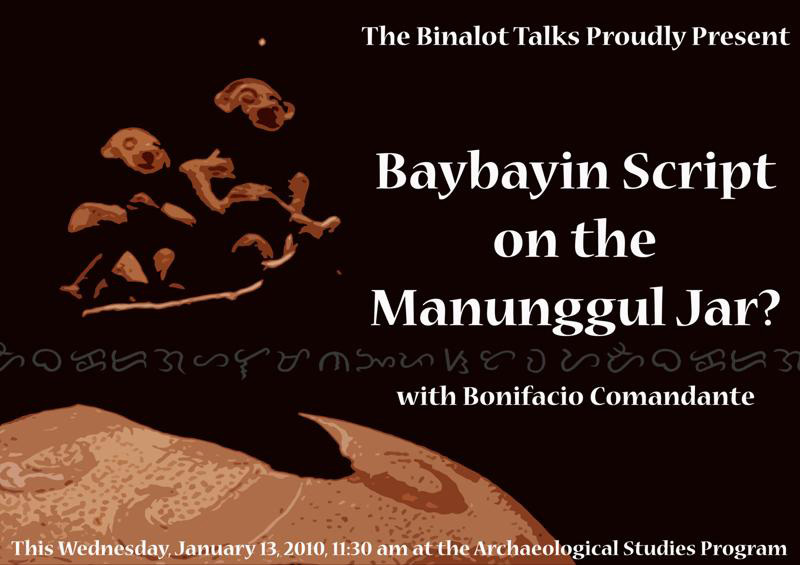 Baybayin Script on the Manunggul Jar? 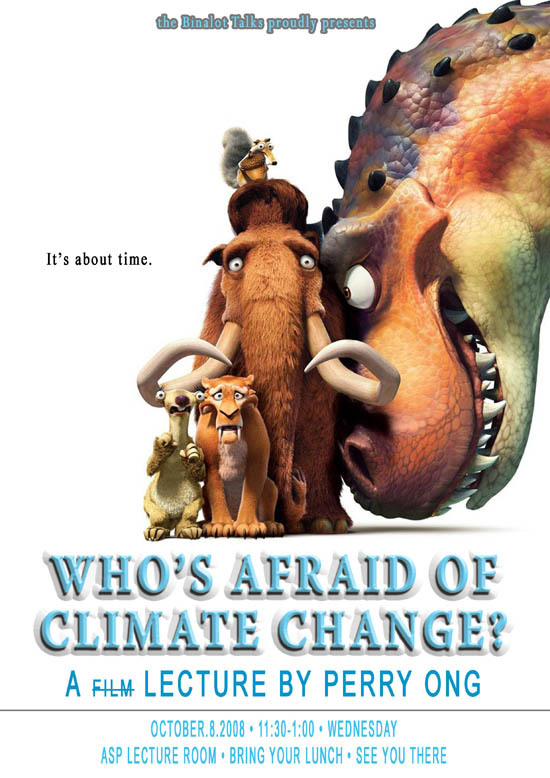 Who's Afraid of Climate Change?